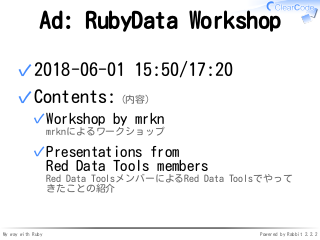 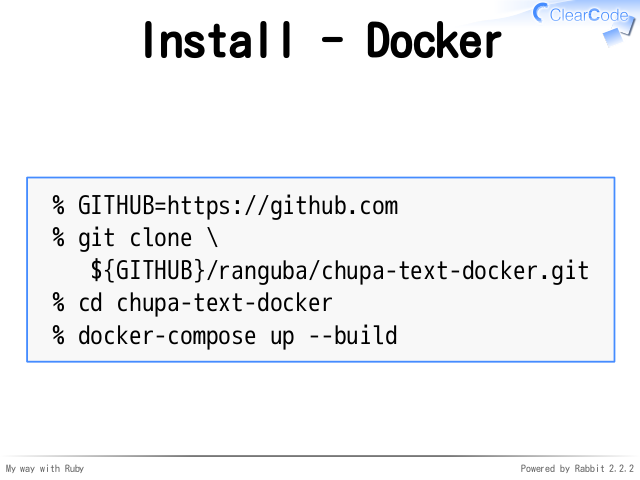 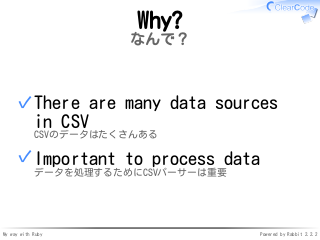 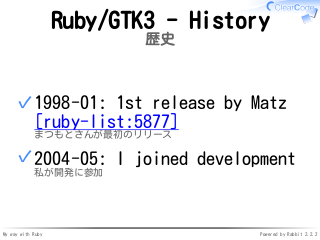 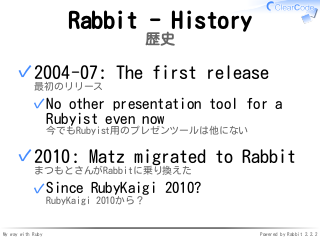 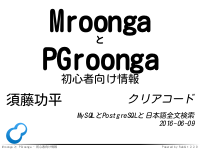 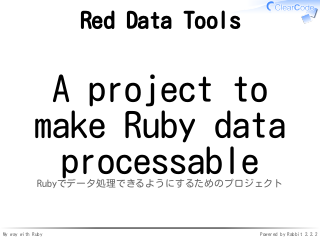 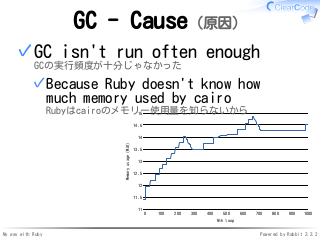 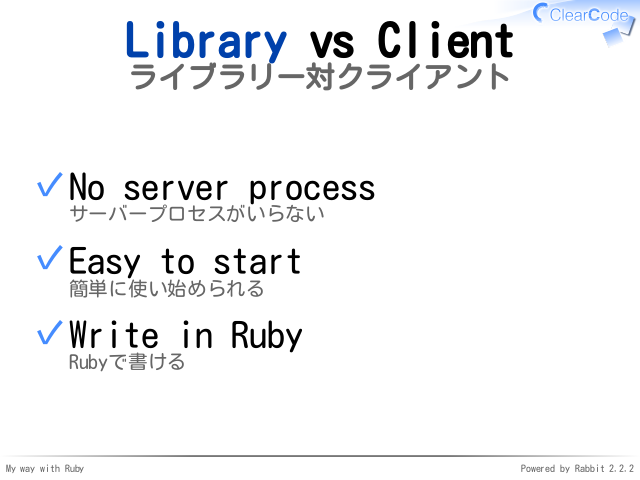 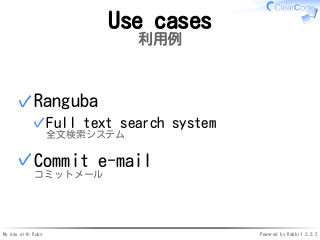 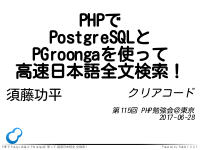 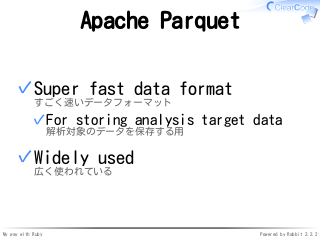 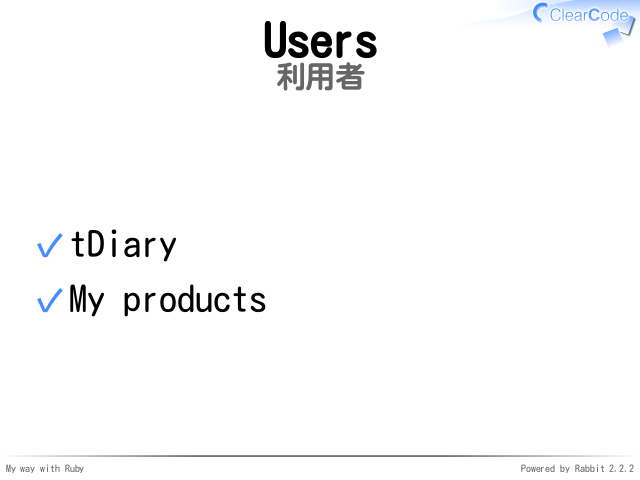 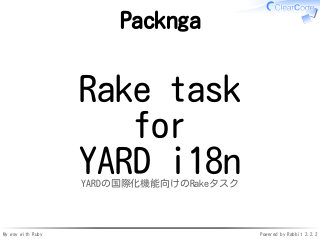 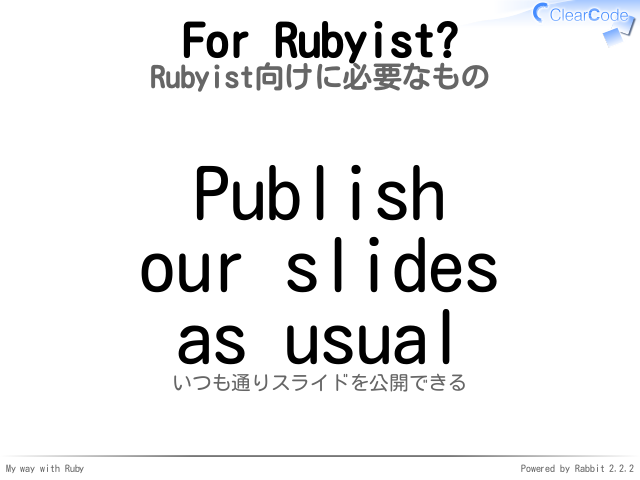 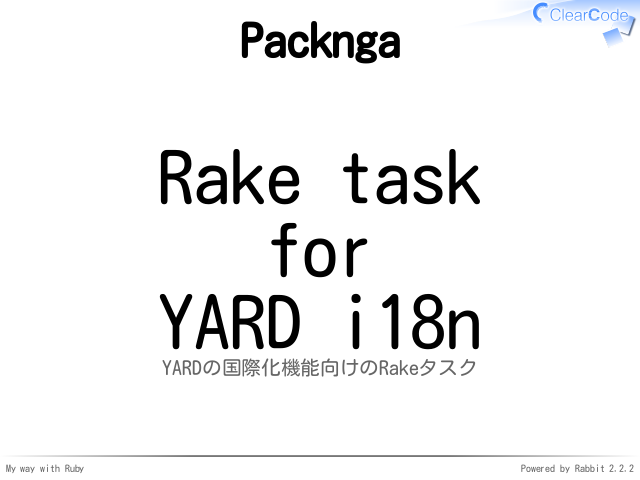 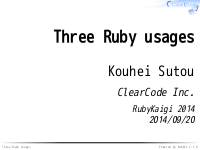 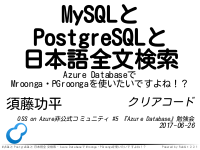 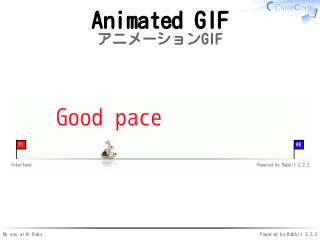 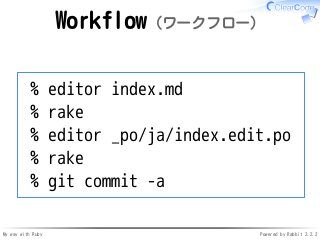 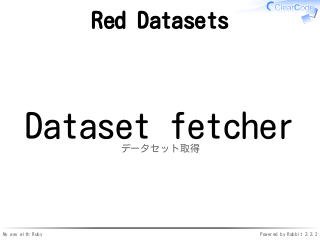 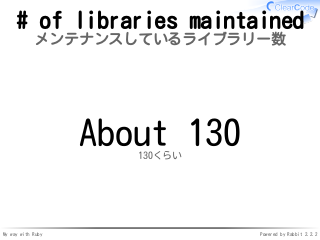 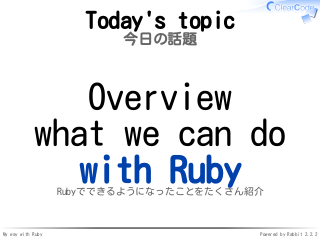 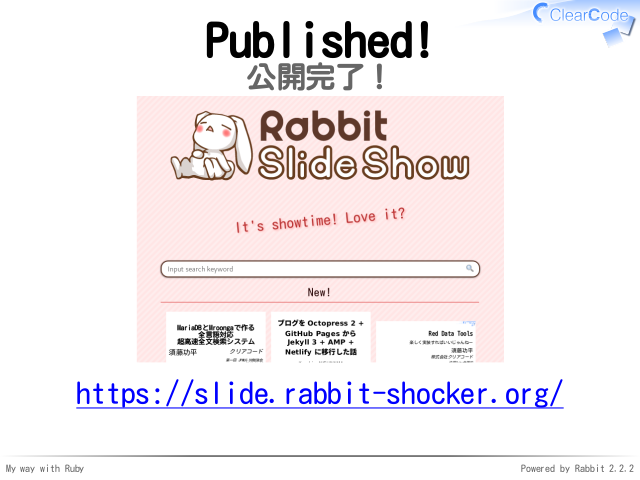 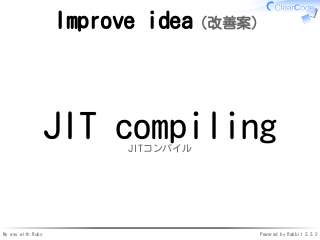 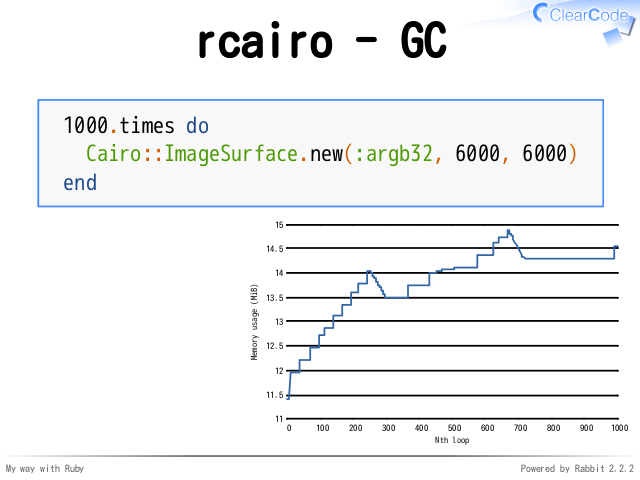 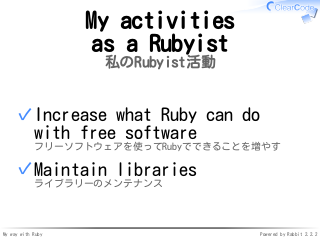 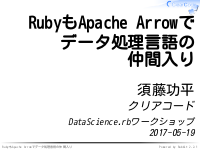 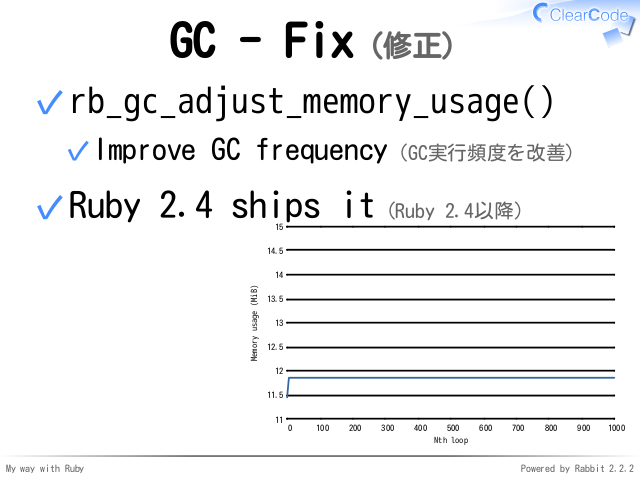 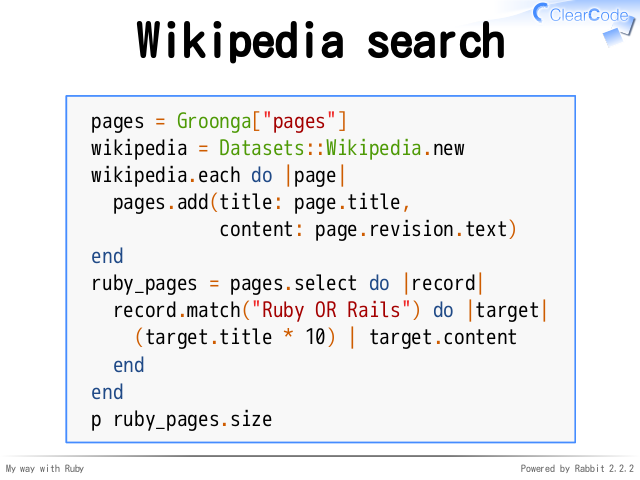 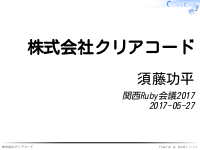 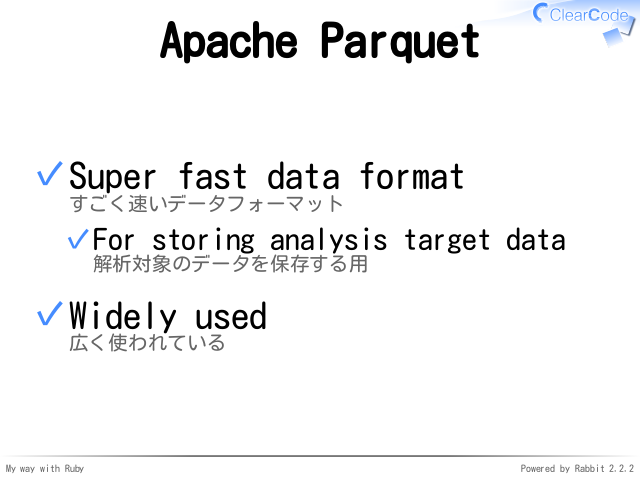 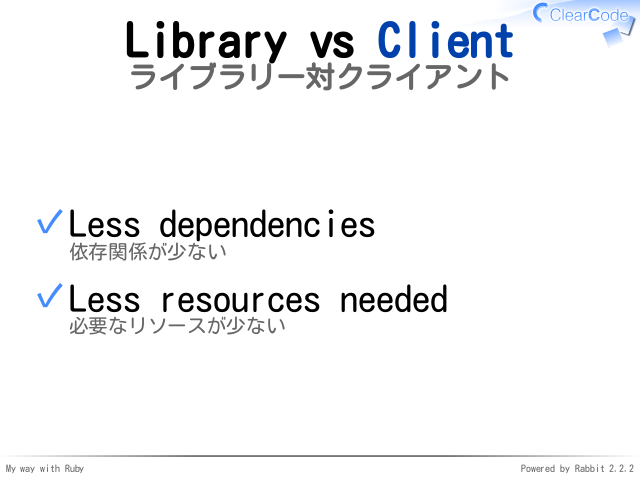 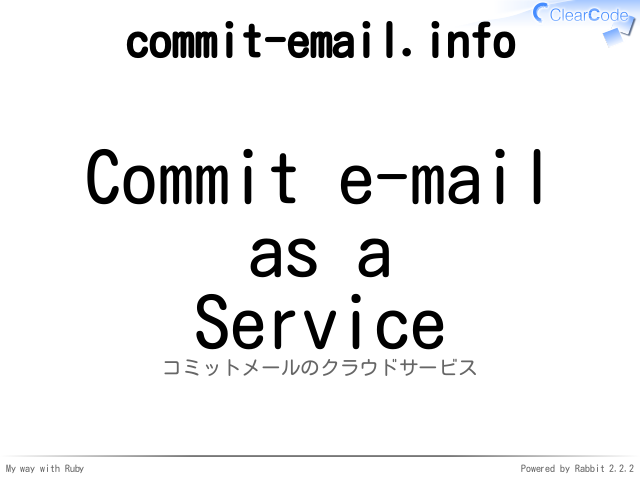 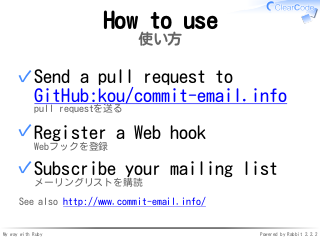 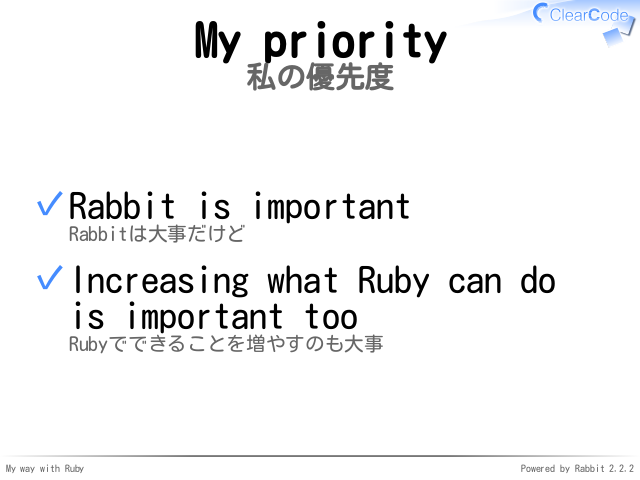 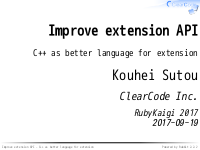 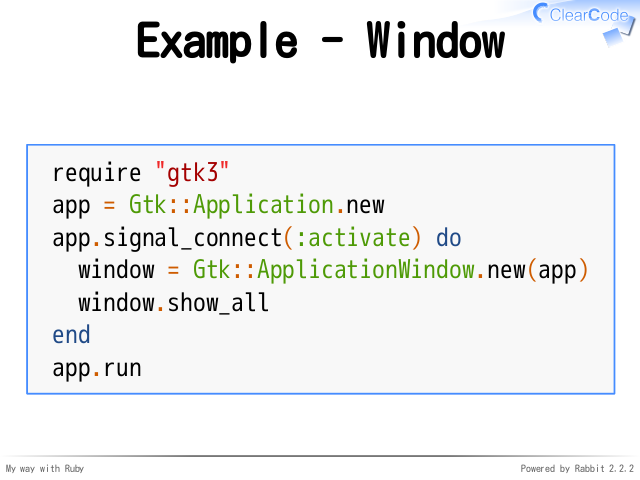 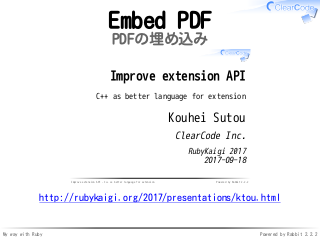 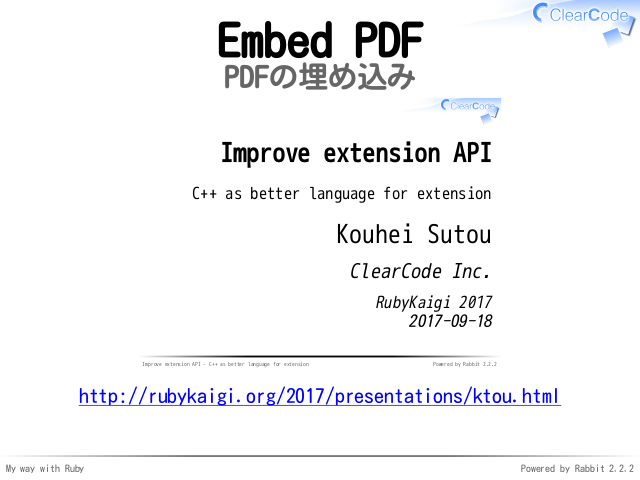 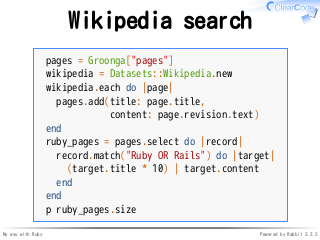 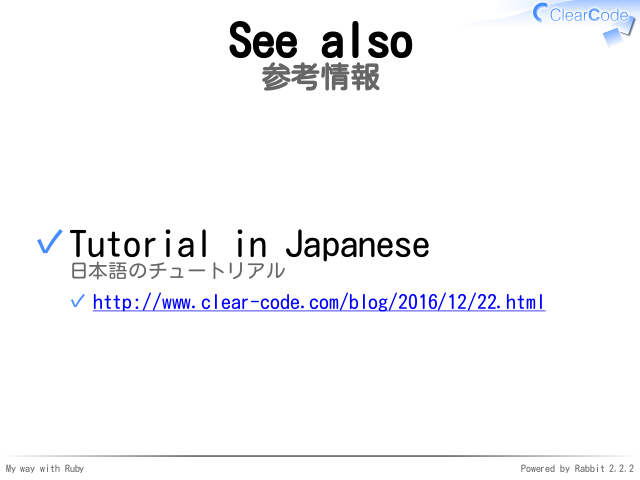 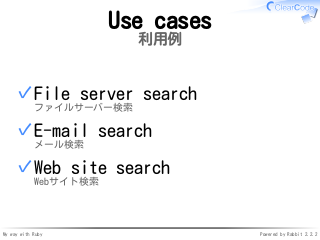 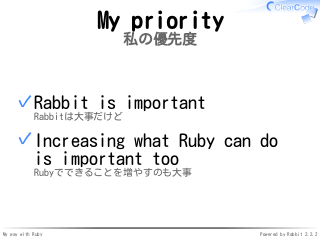 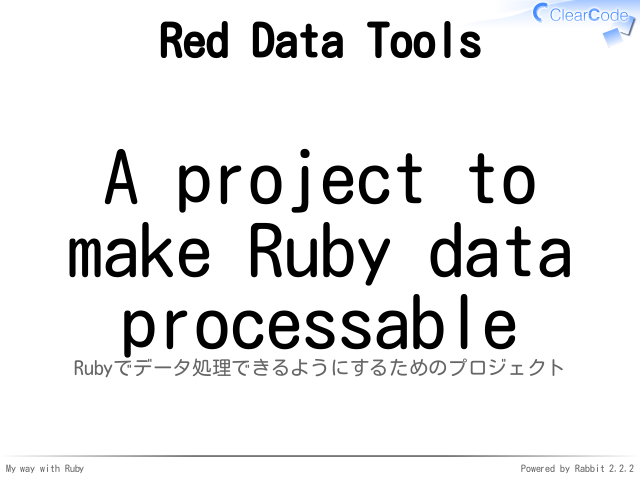 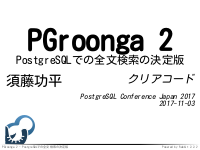 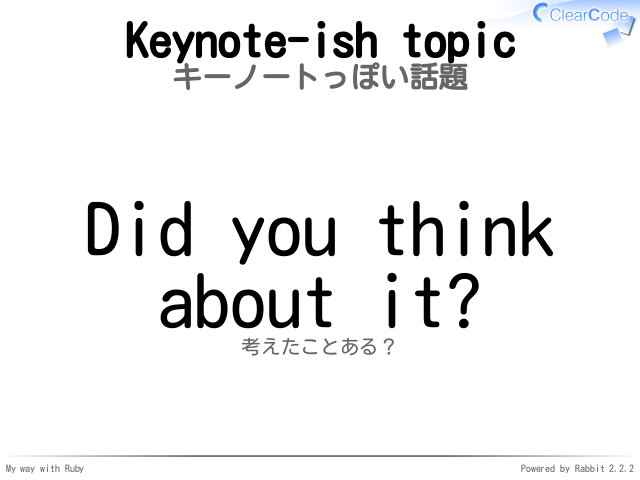 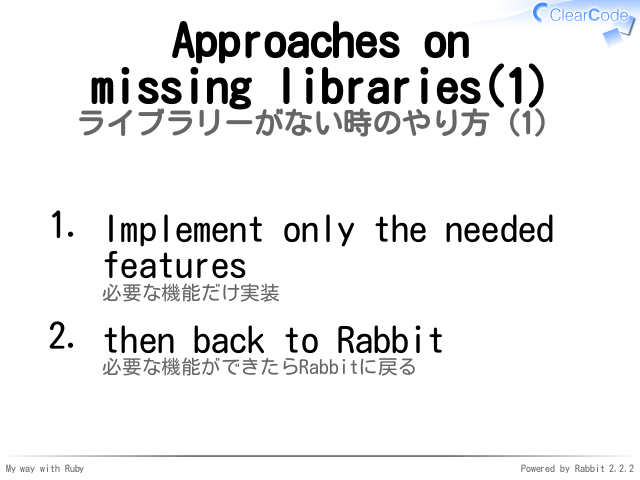 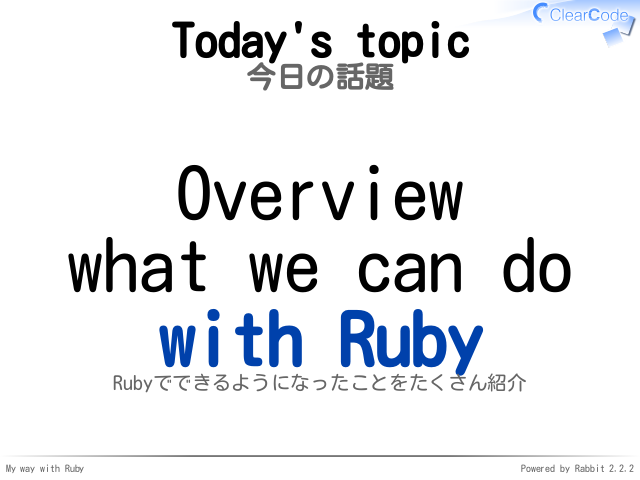 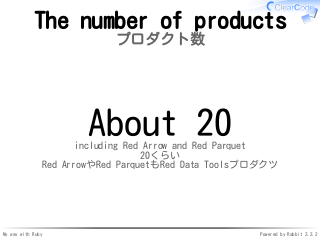 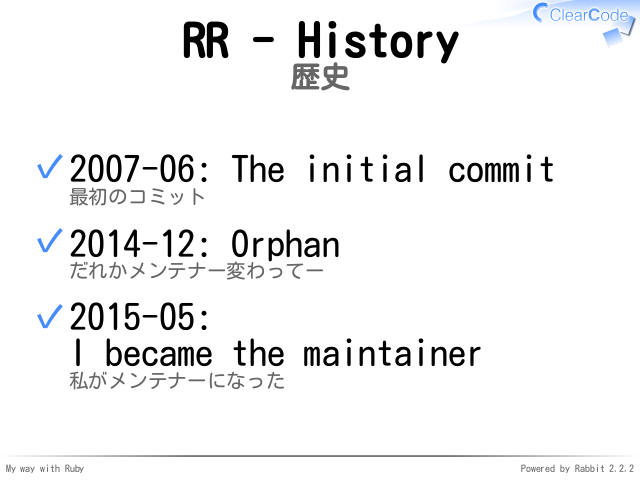 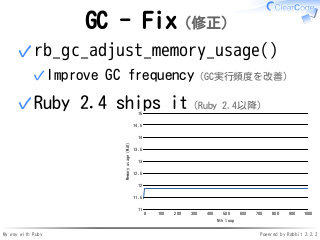 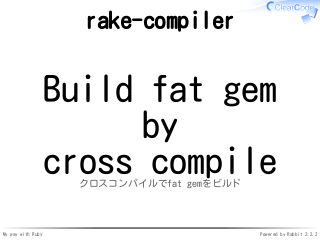 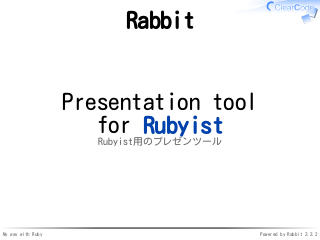 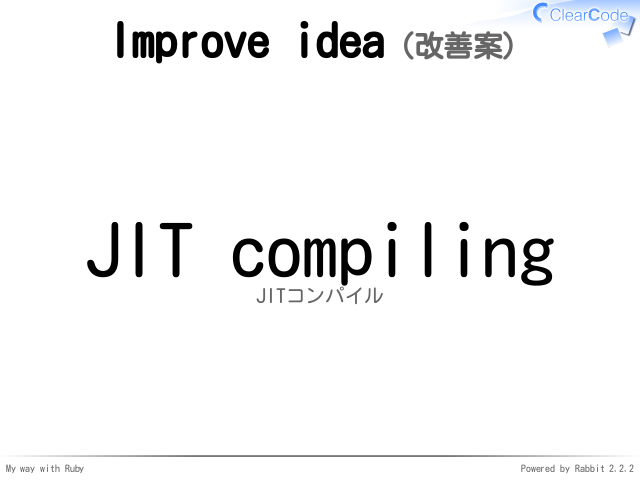 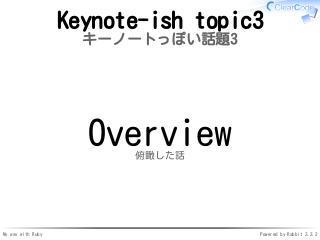 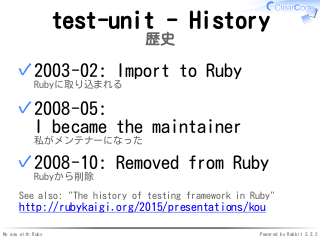 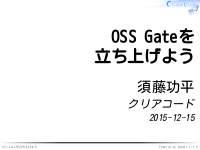 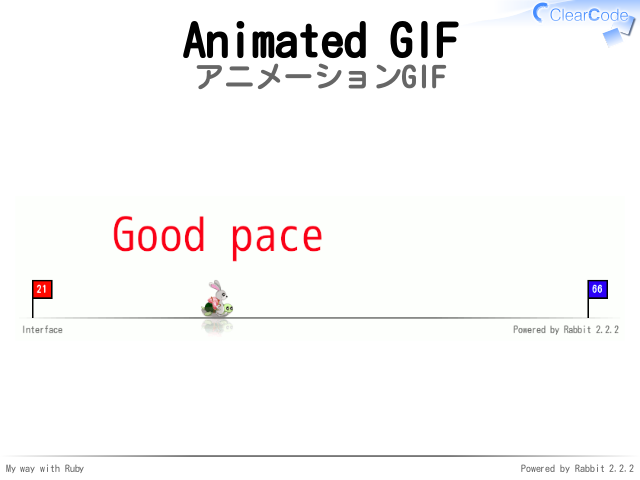 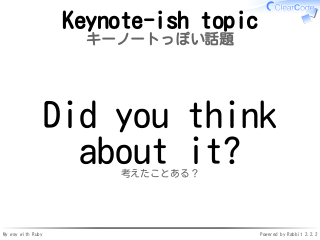 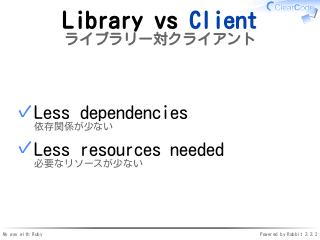 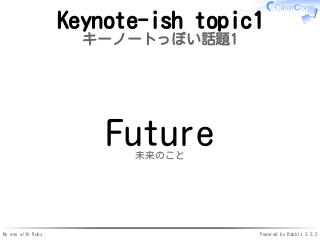 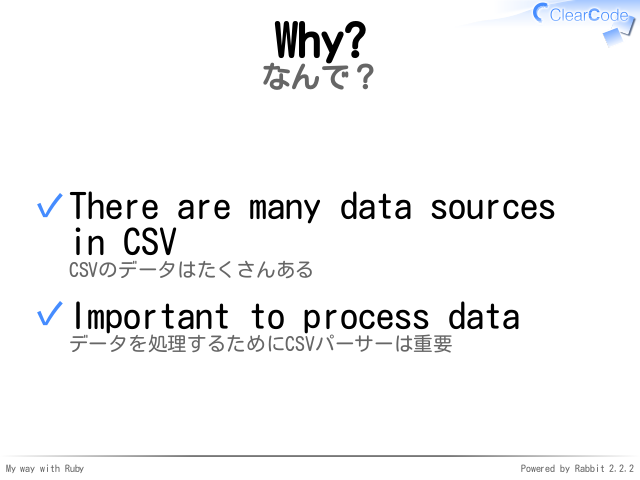 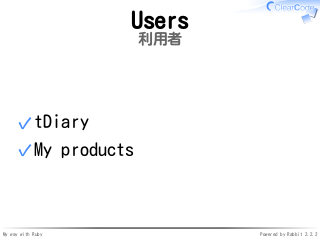 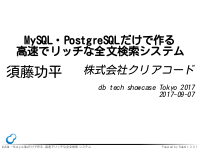 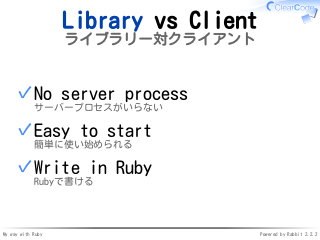 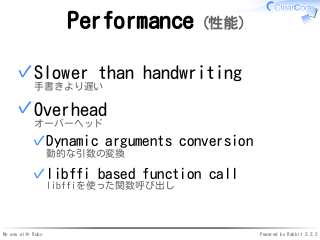 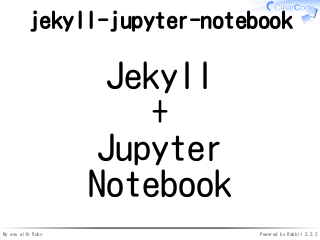 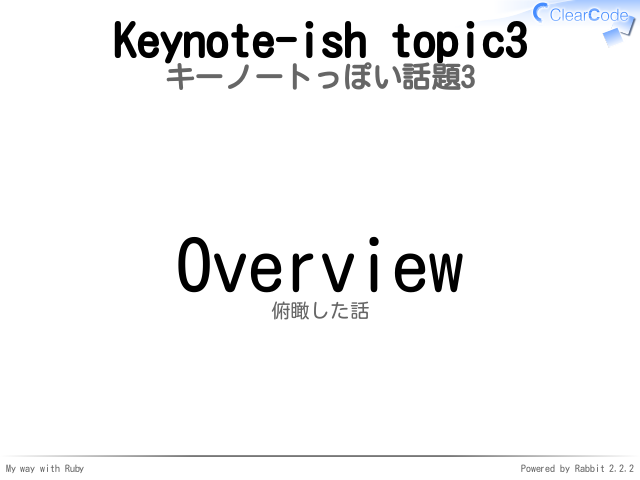 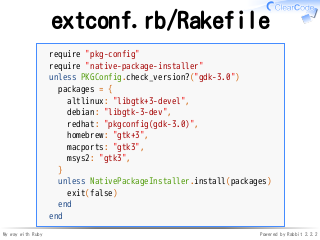 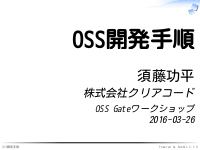 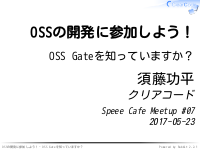 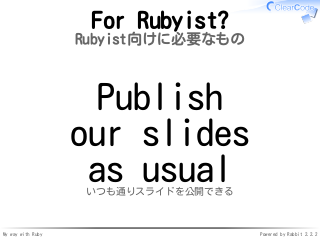 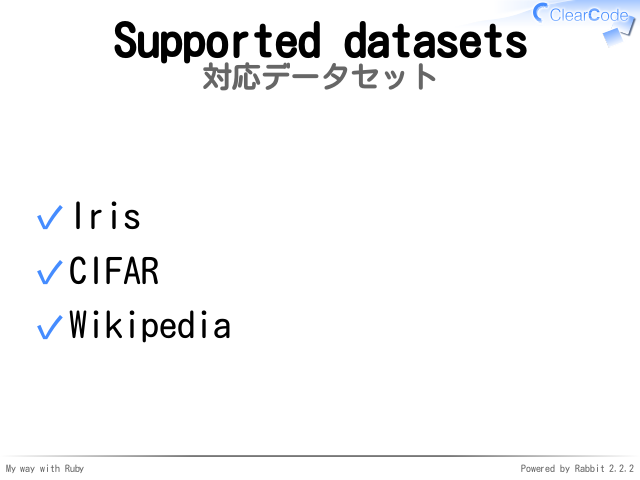 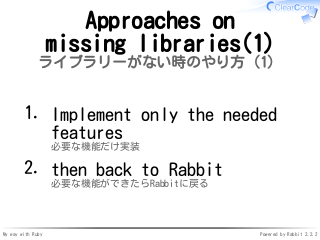 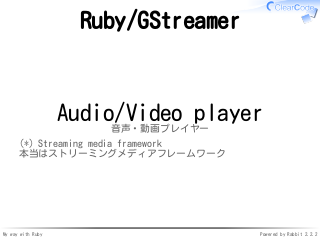 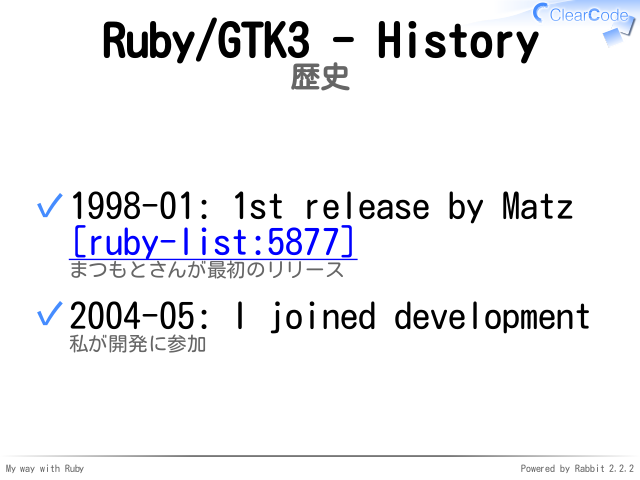 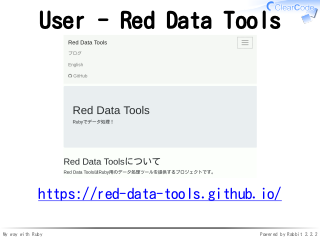 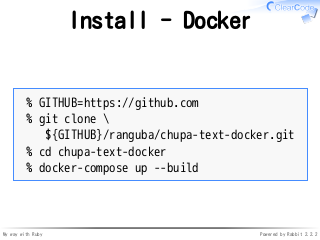 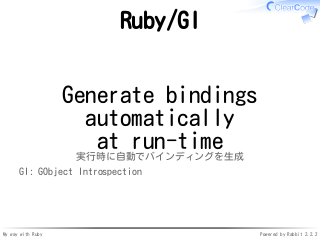 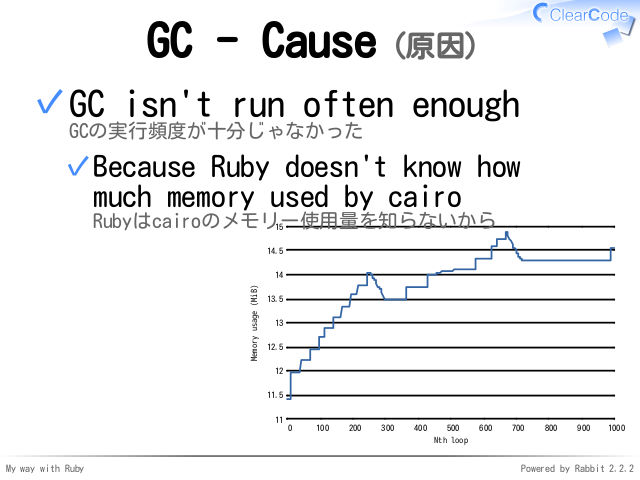 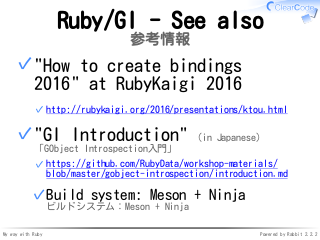 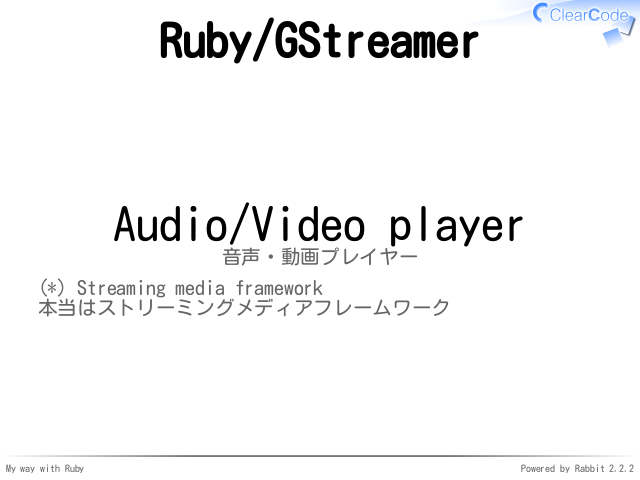 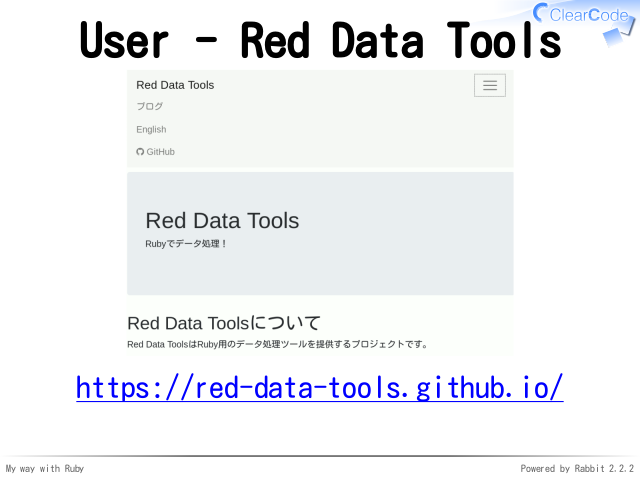 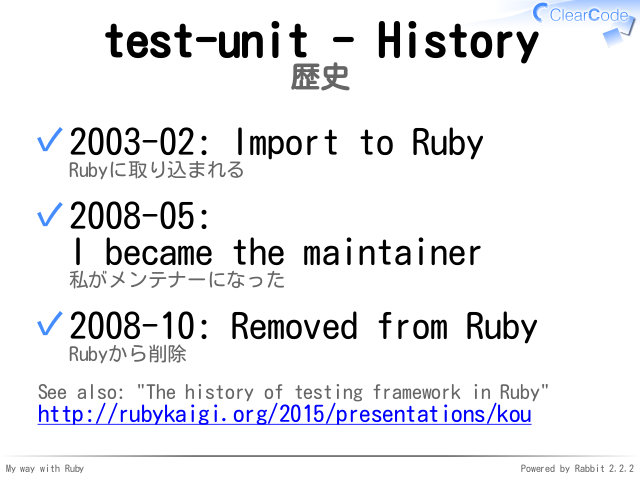 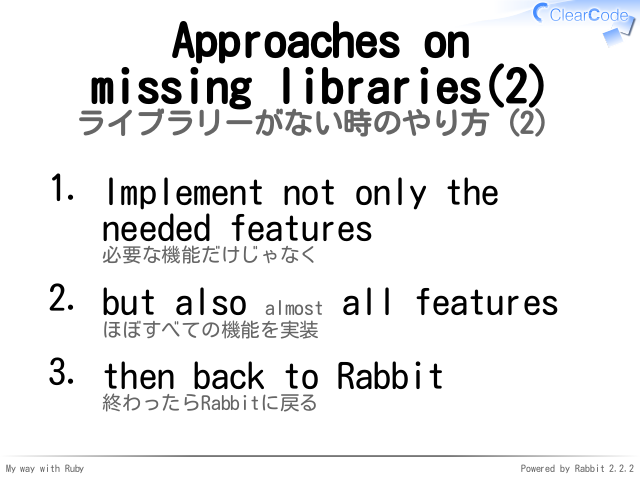 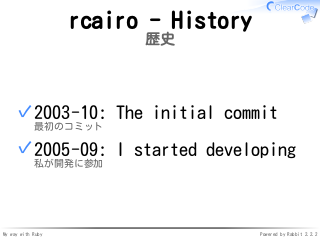 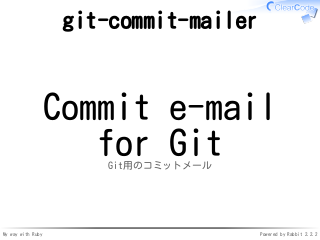 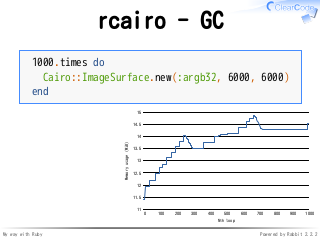 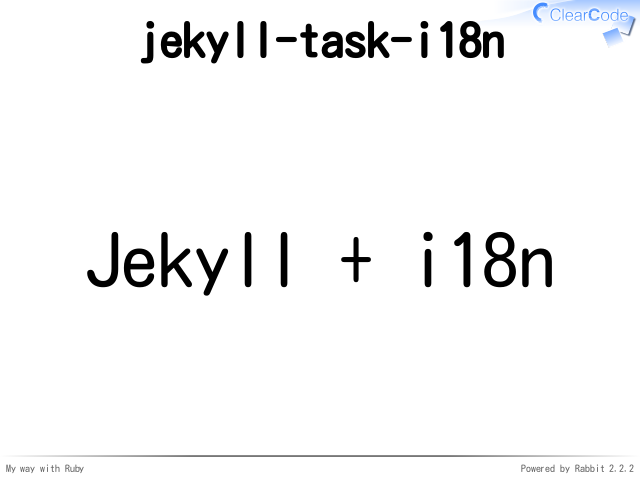 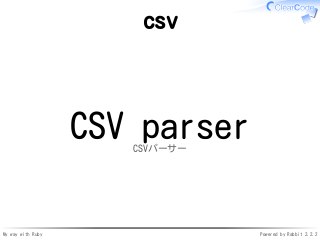 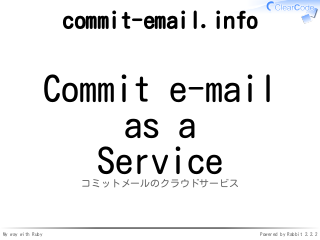 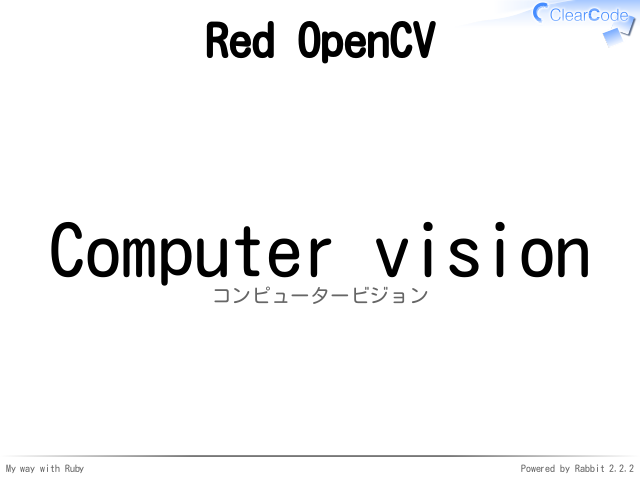 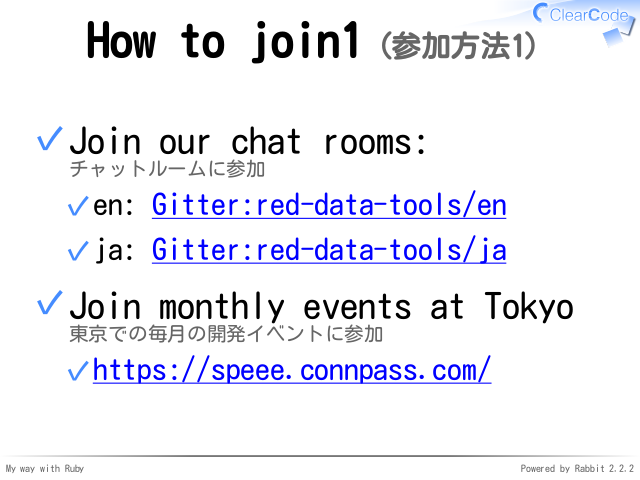 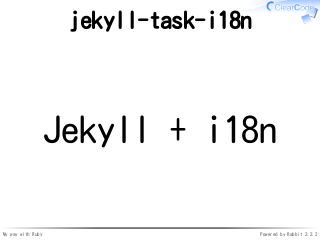 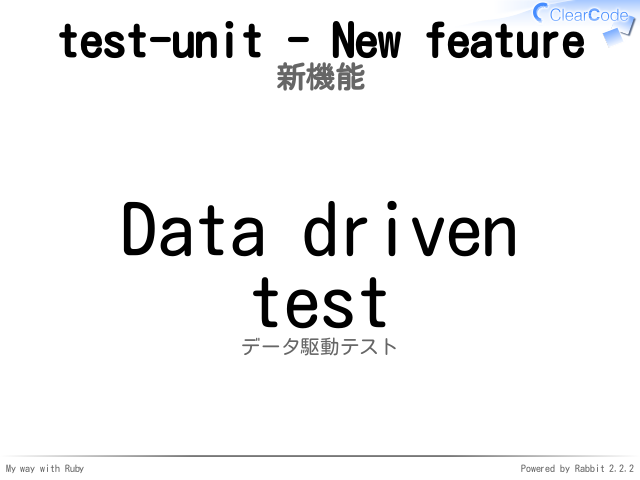 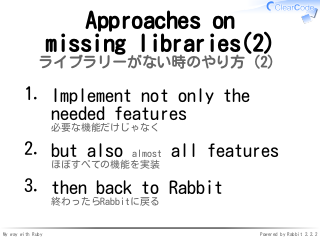 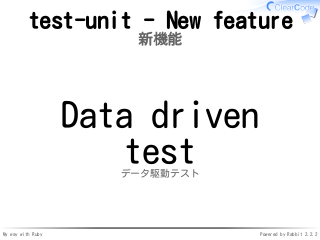 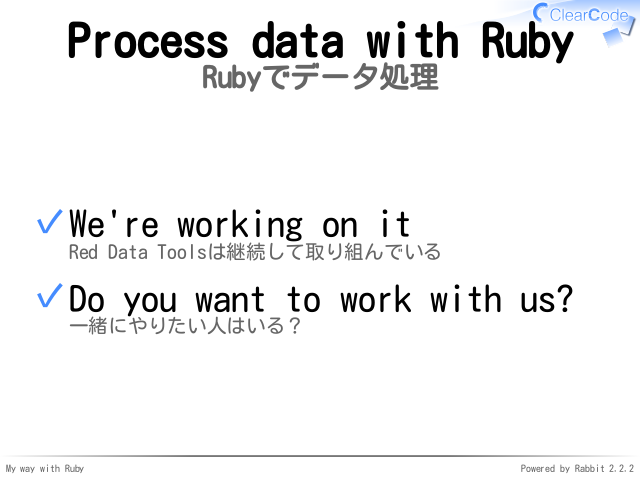 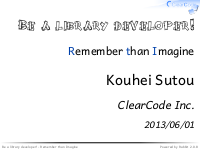 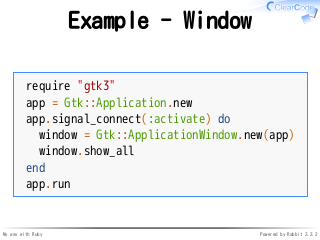 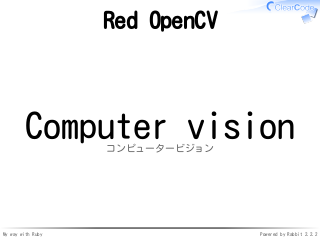 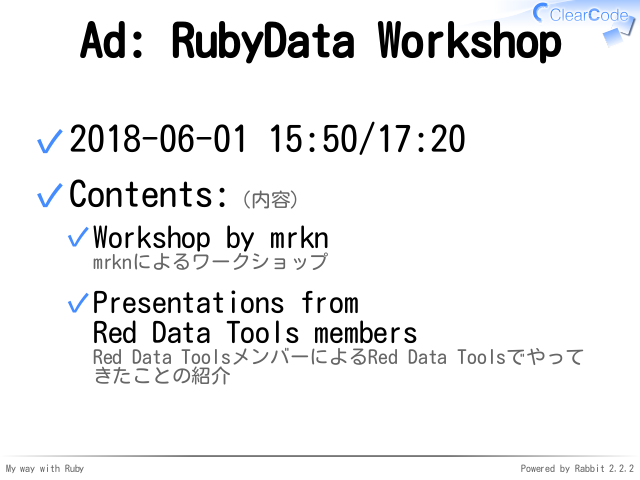 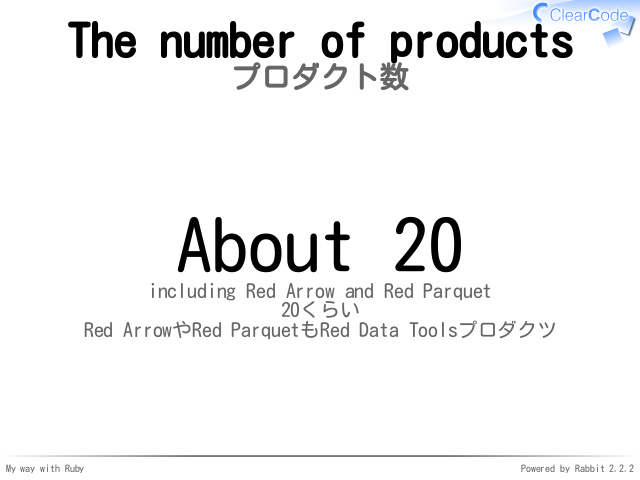 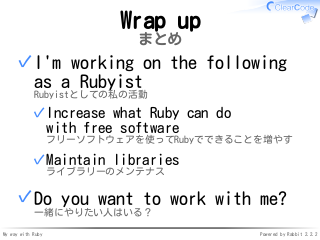 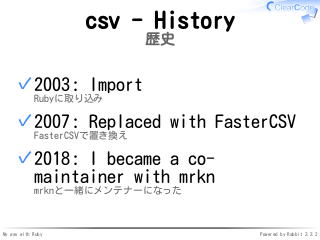 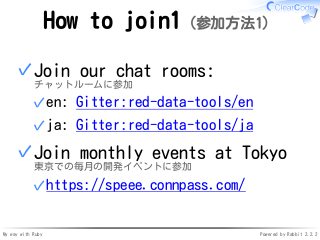 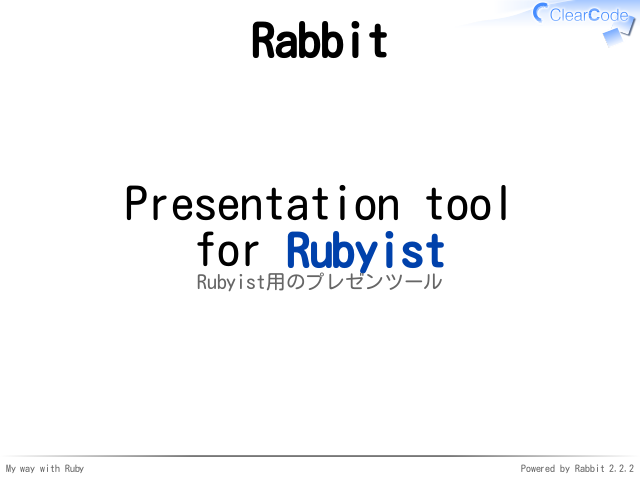 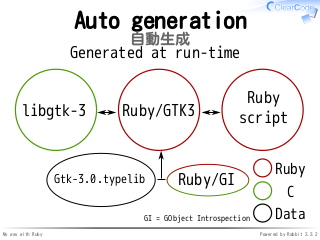 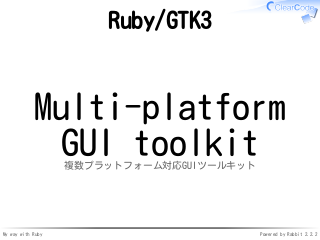 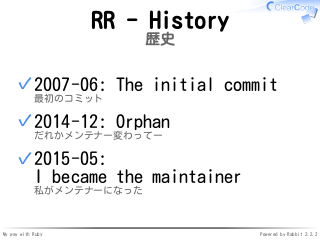 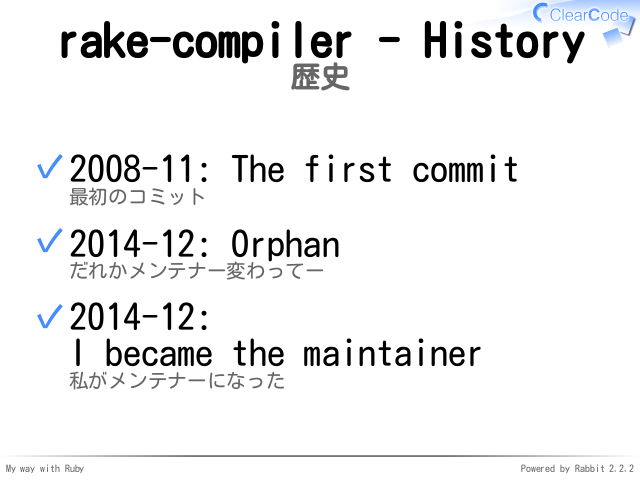 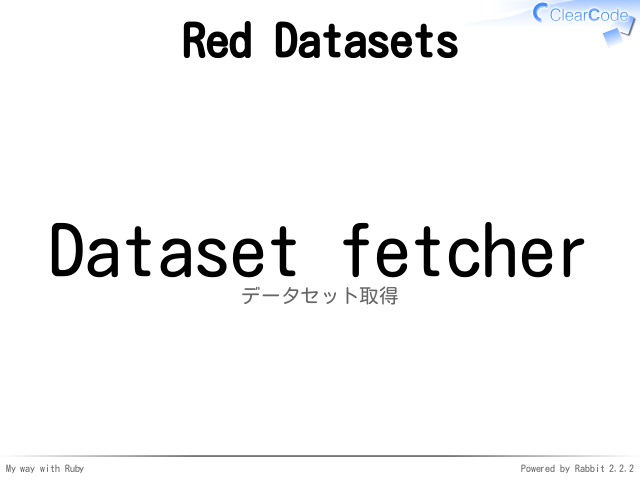 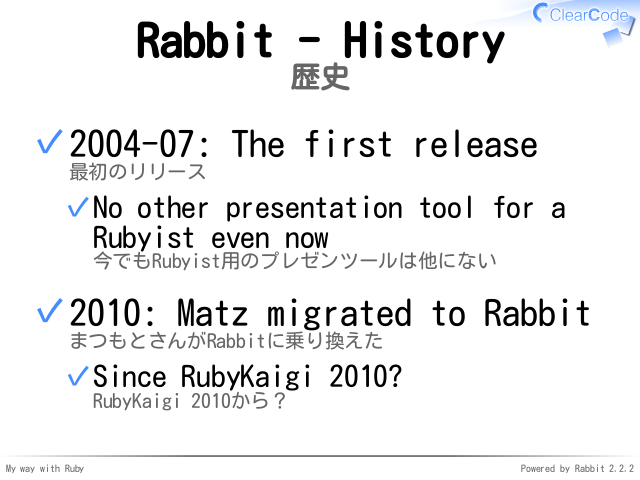 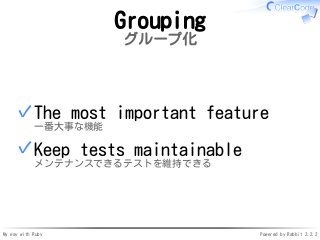 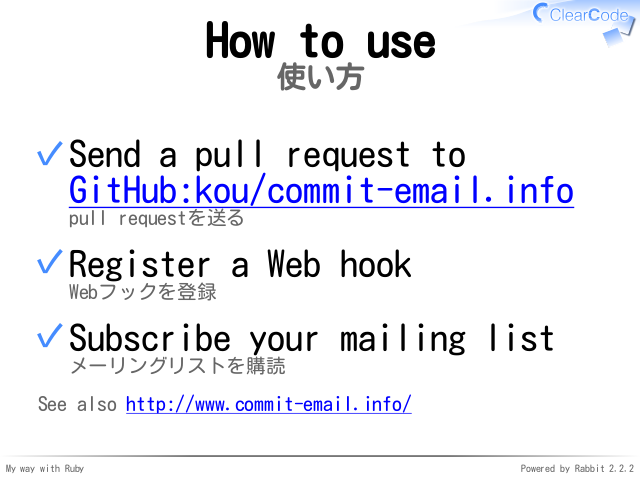 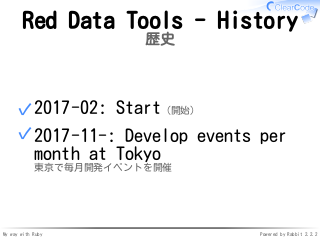 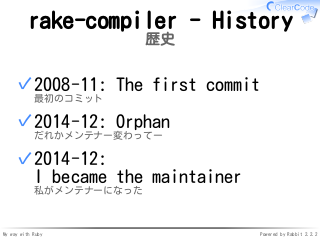 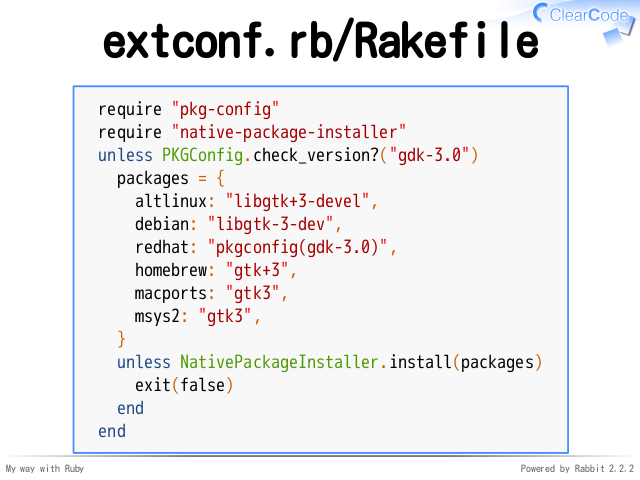 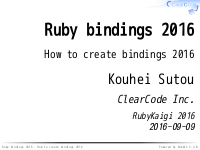 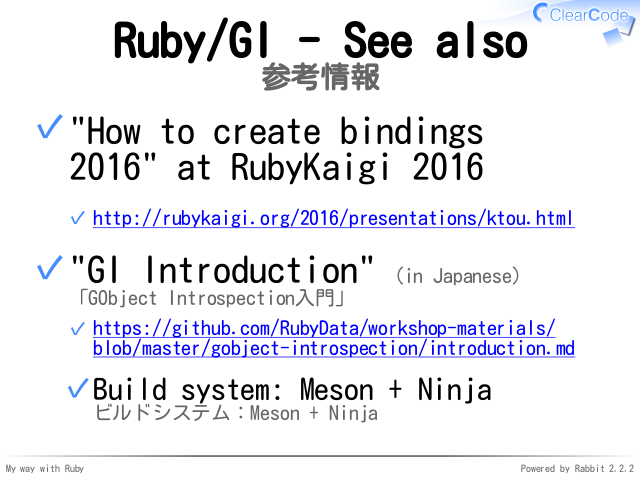 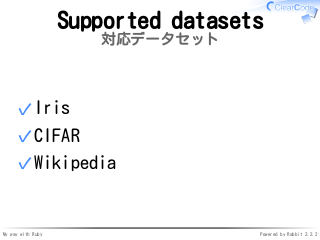 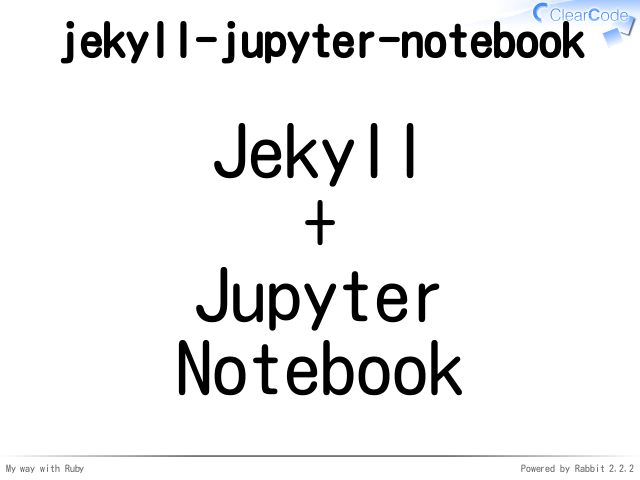 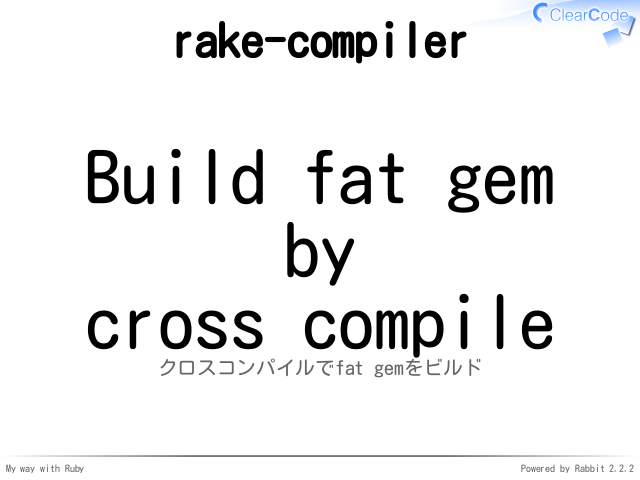 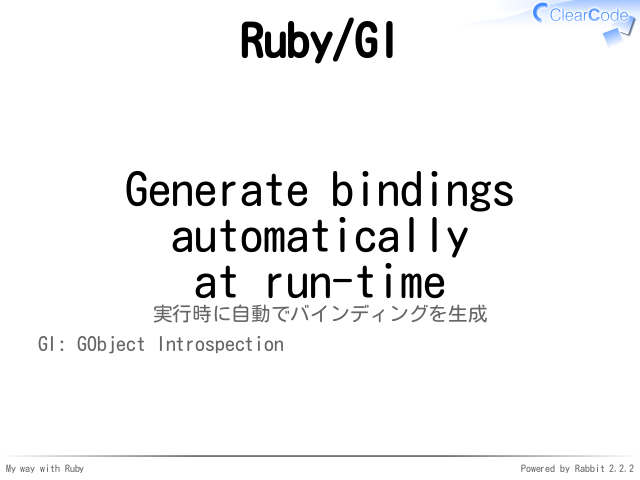 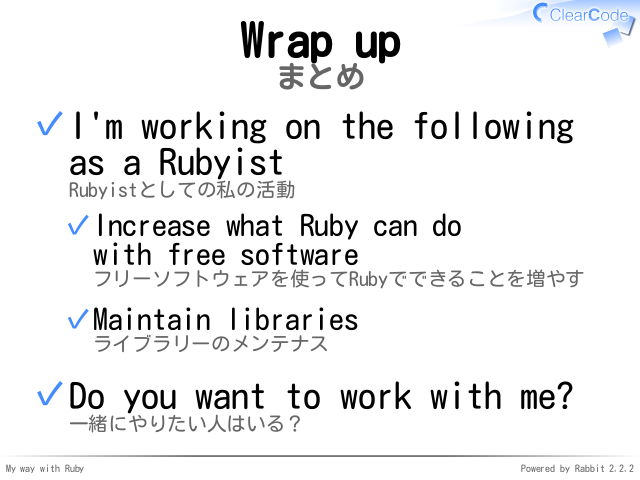 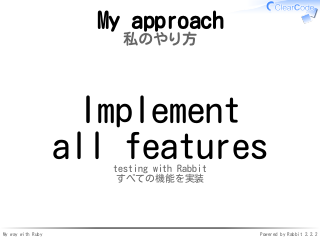 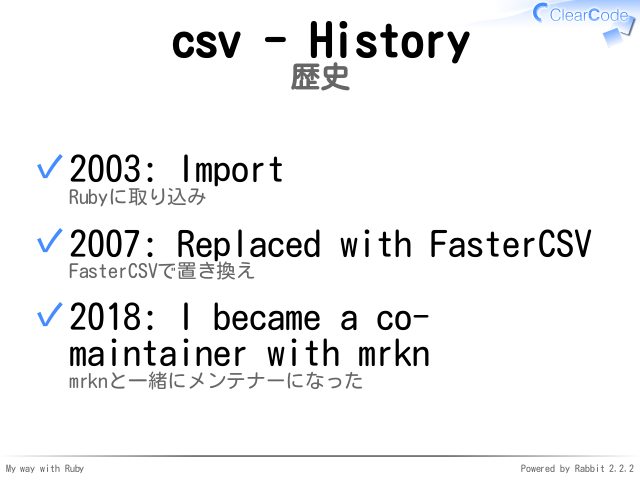 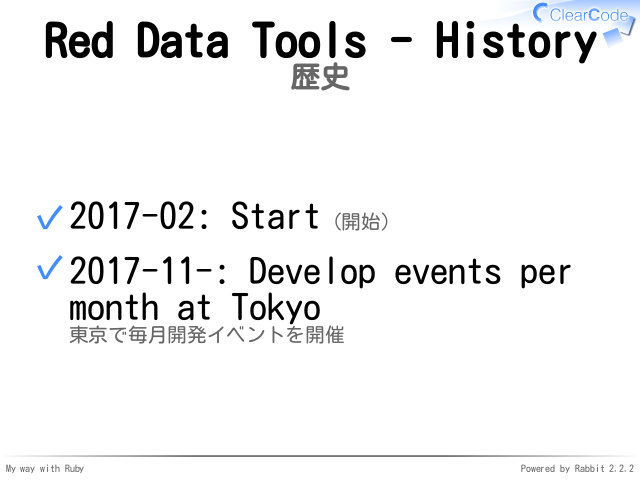 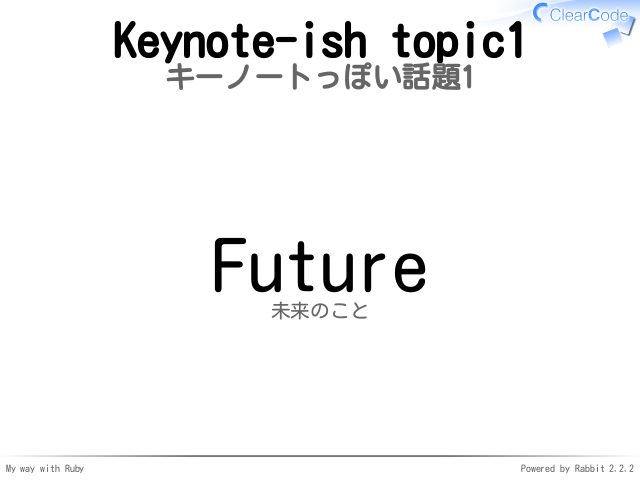 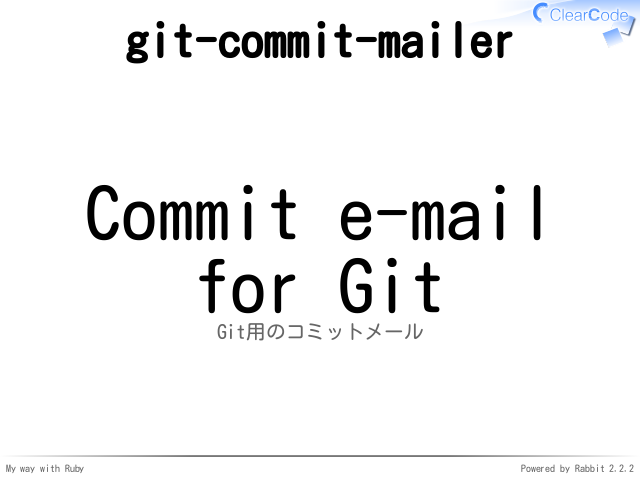 Here are my activities as a Rubyist: * Increase what Ruby can do with free software * Maintain libraries In this talk, I introduce my activities. 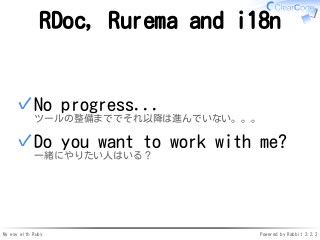 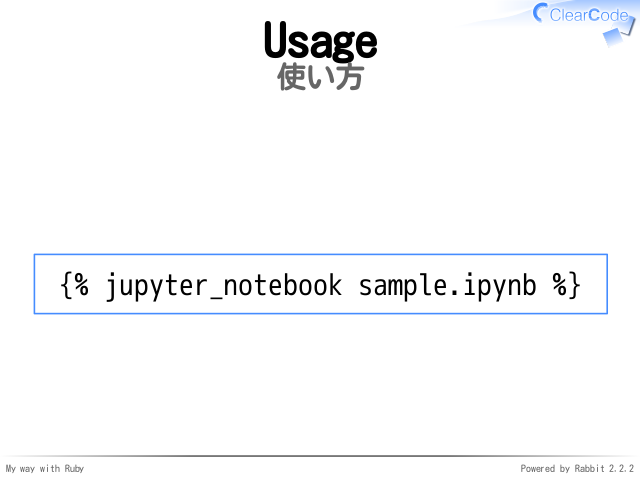 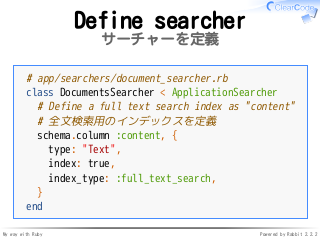 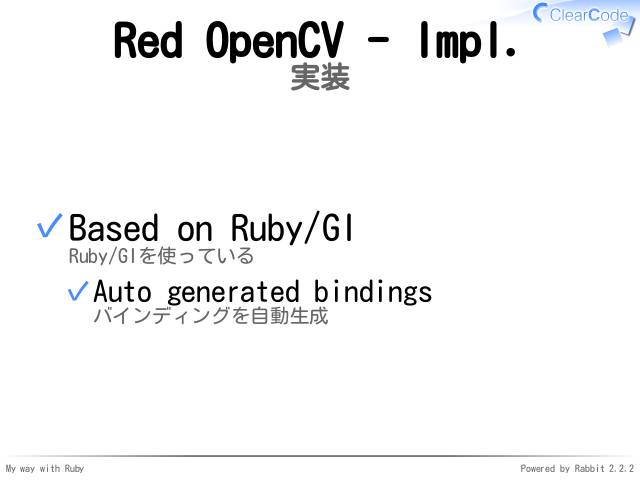 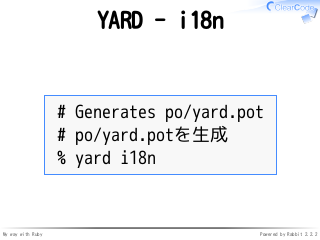 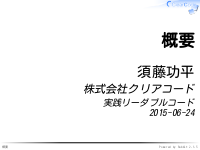 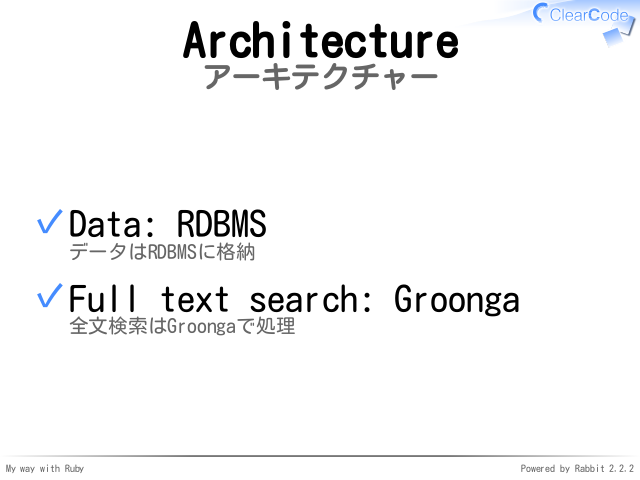 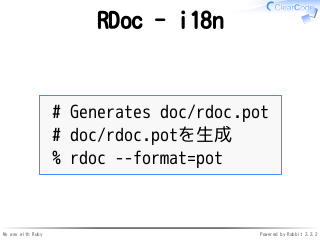 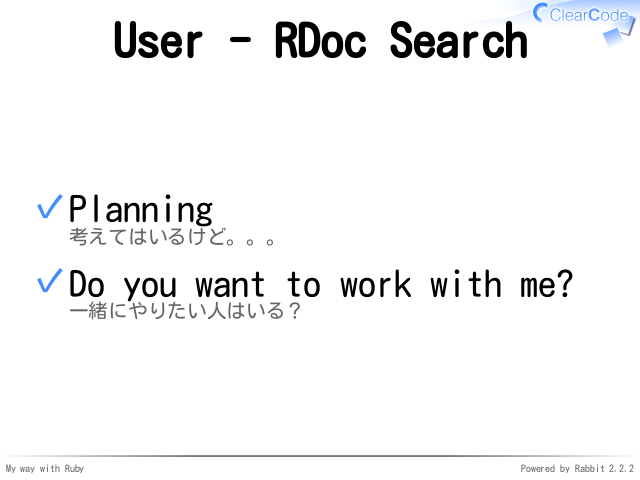 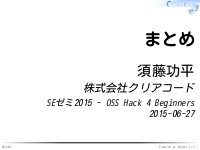 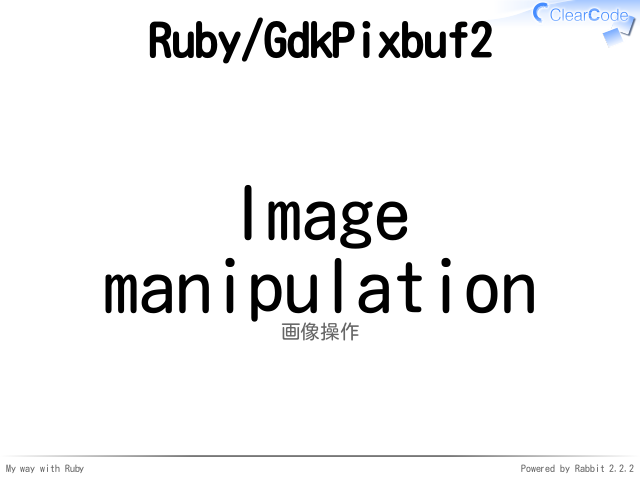 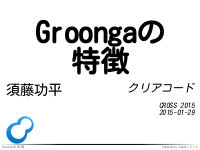 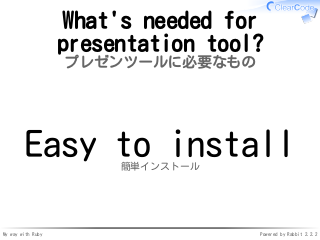 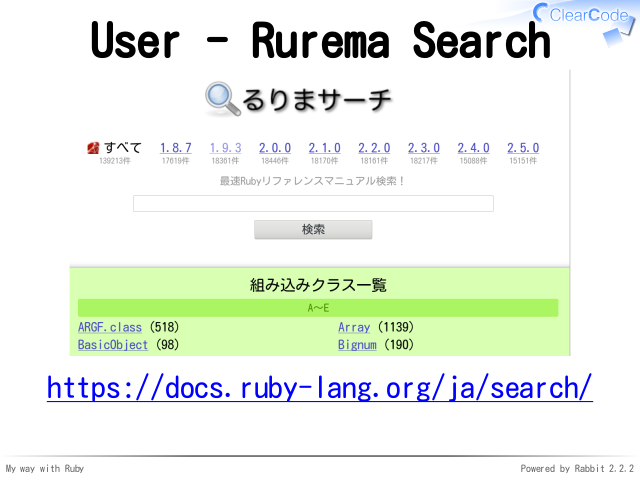 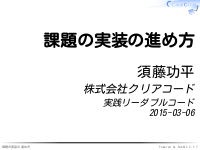 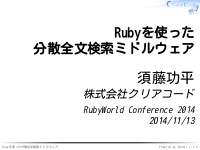 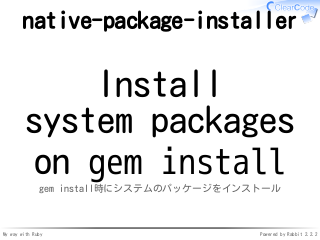 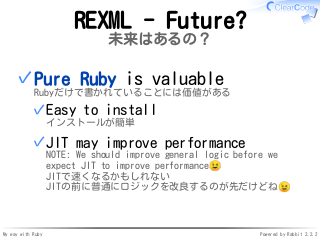 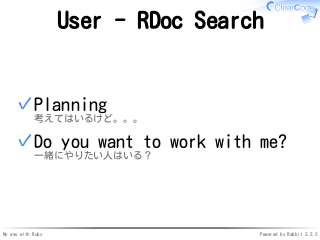 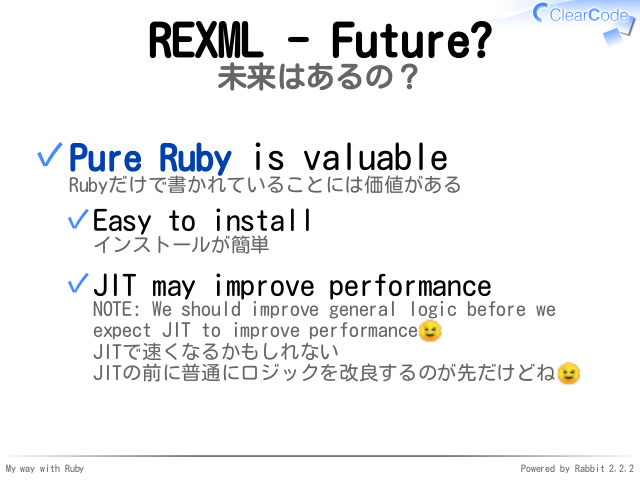 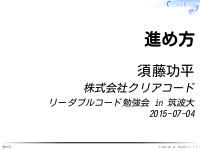 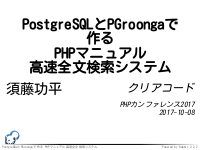 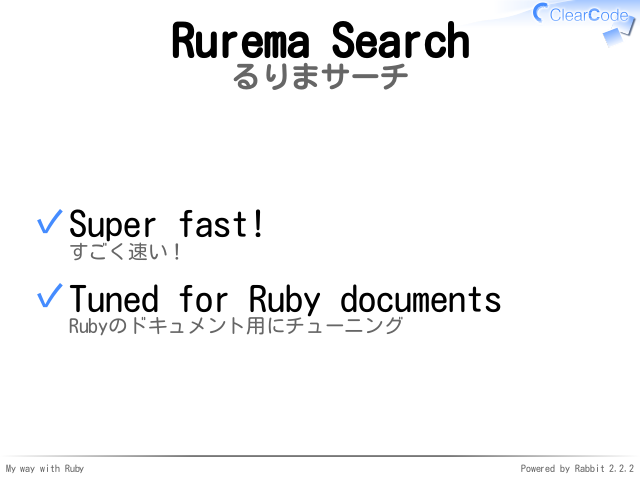 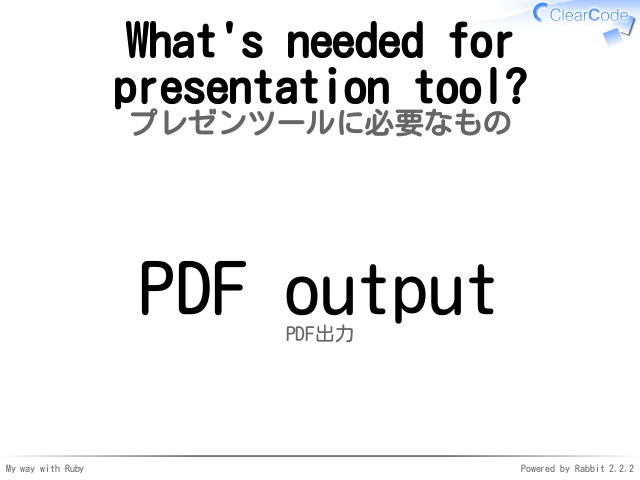 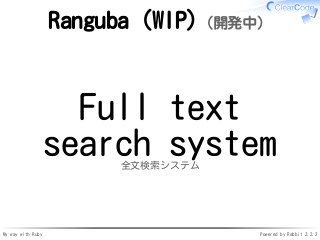 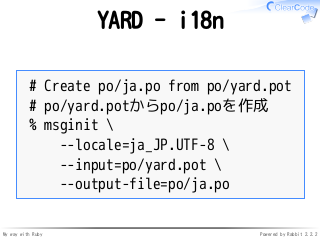 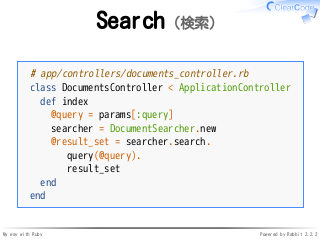 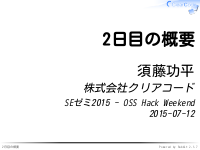 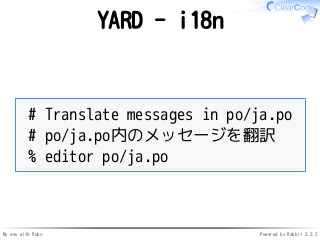 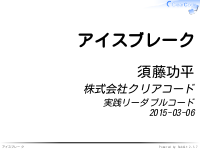 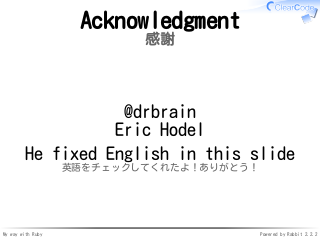 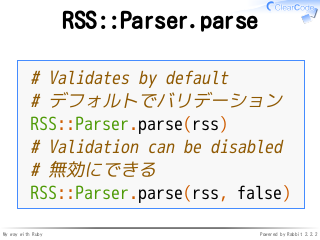 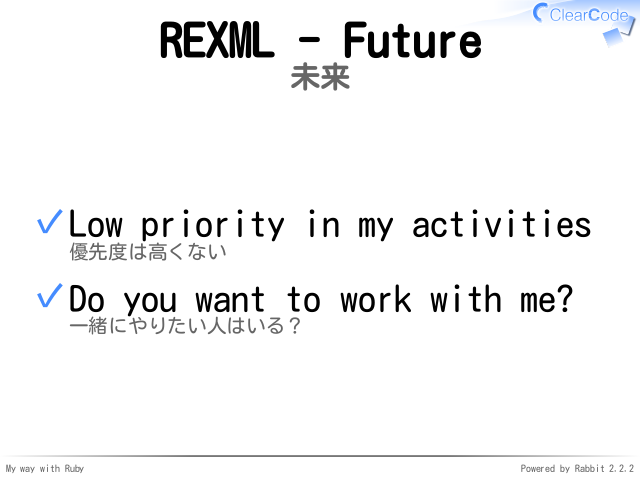 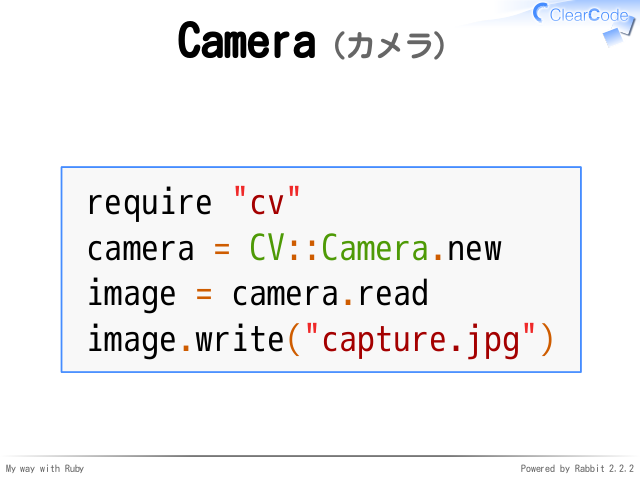 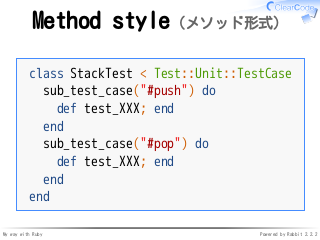 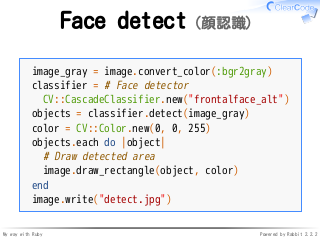 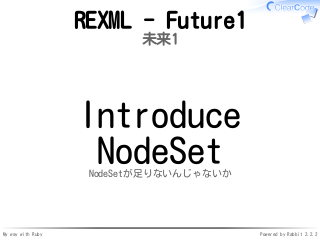 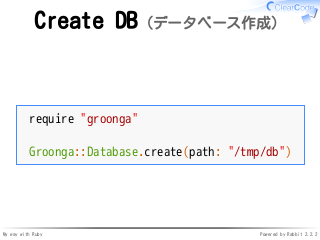 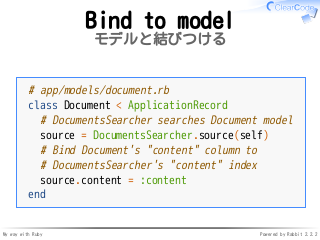 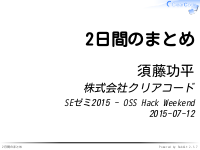 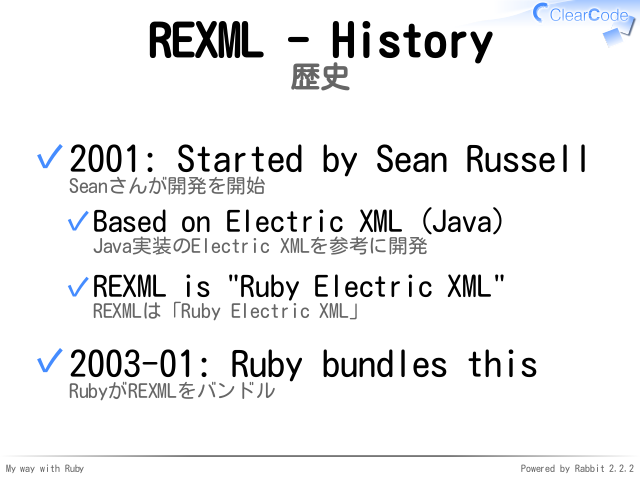 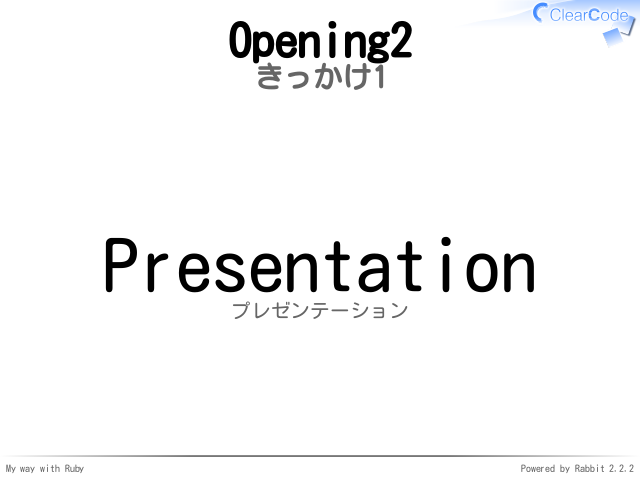 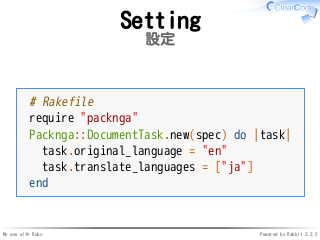 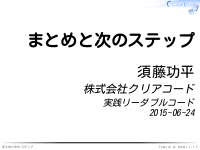 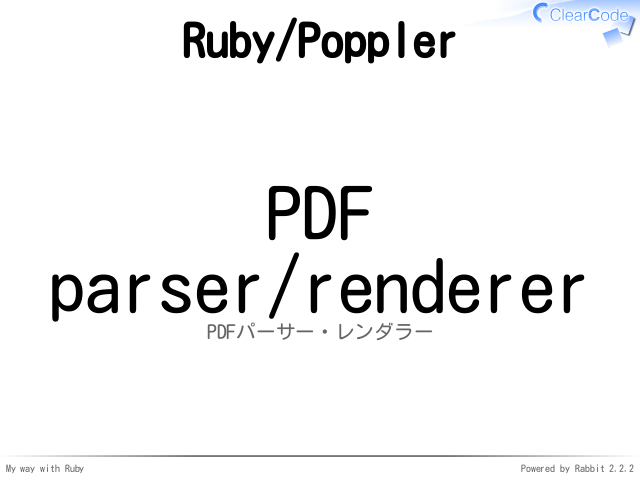 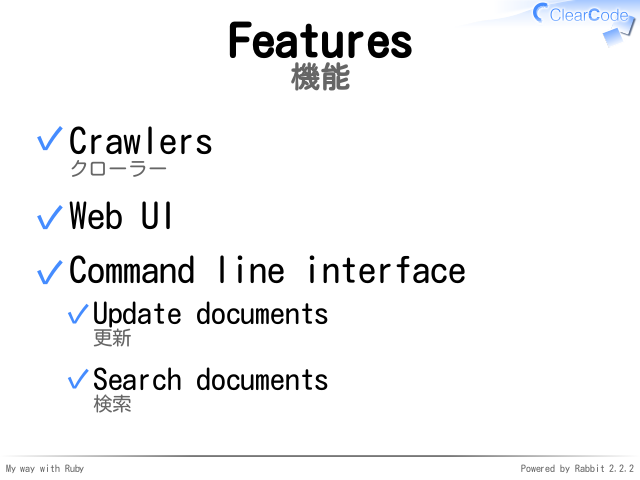 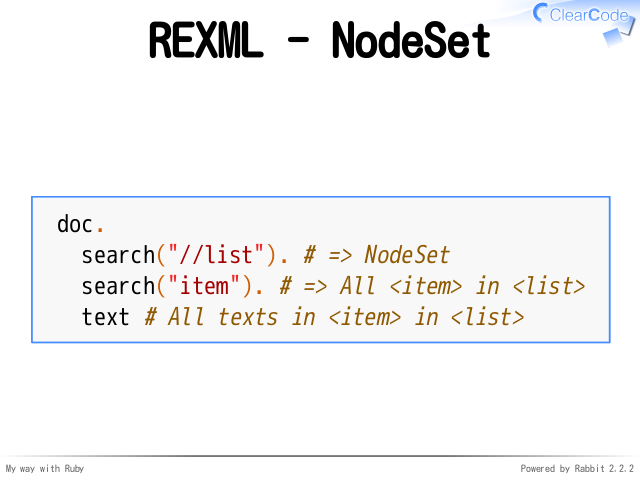 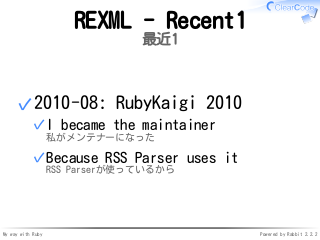 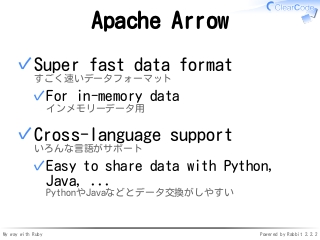 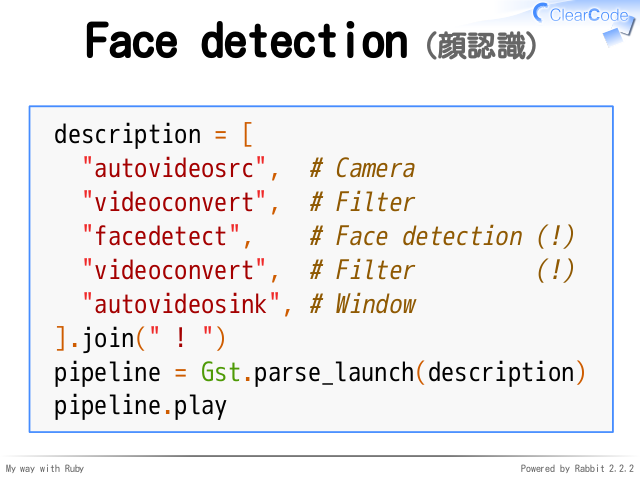 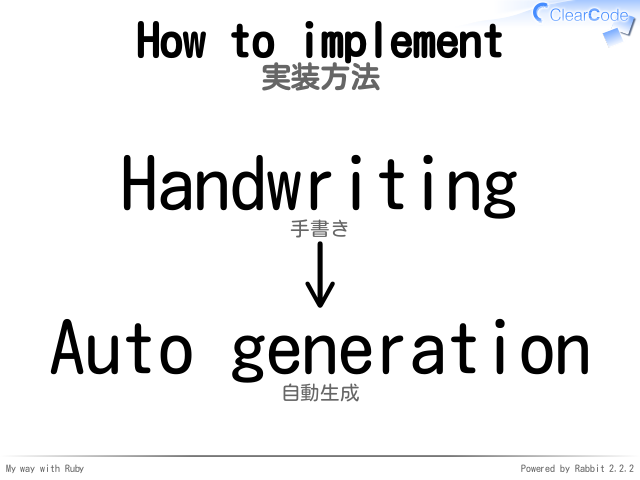 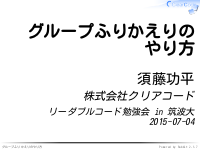 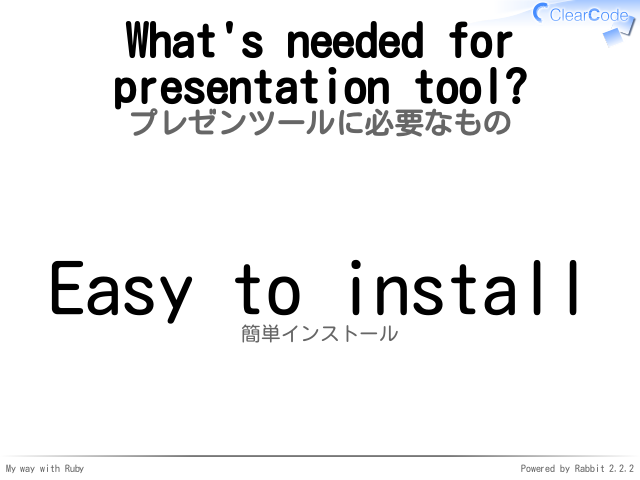 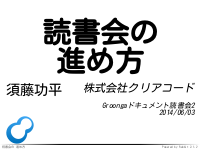 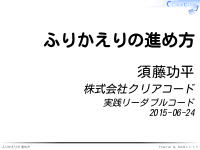 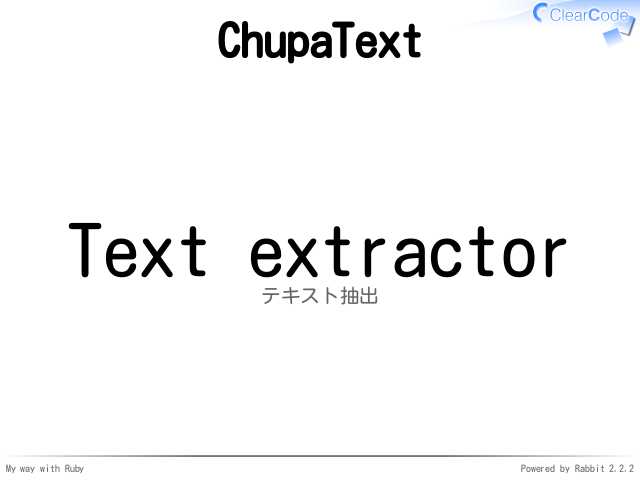 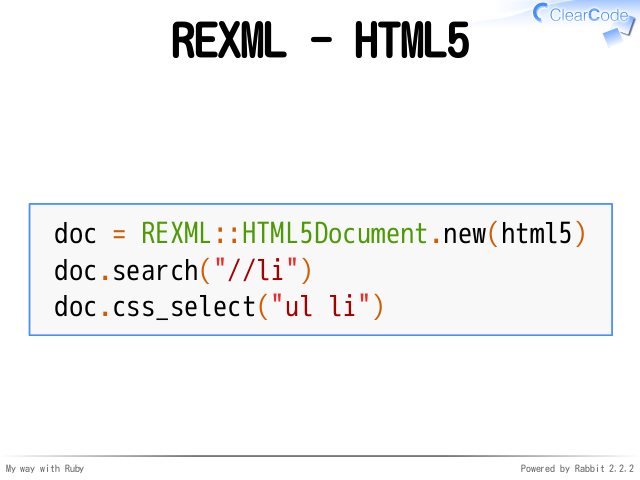 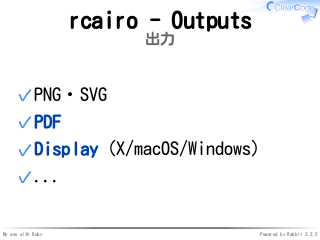 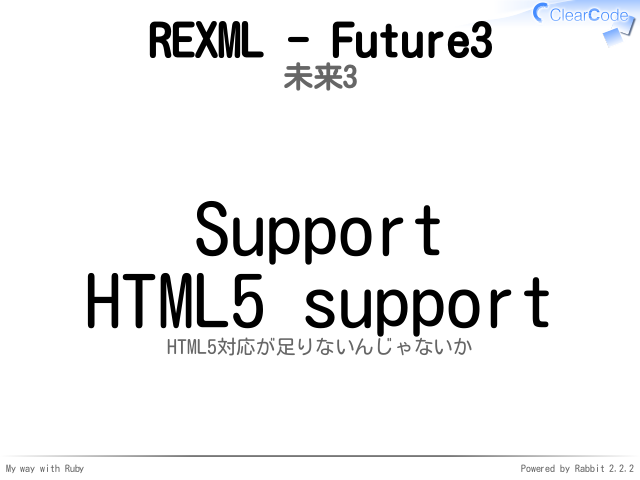 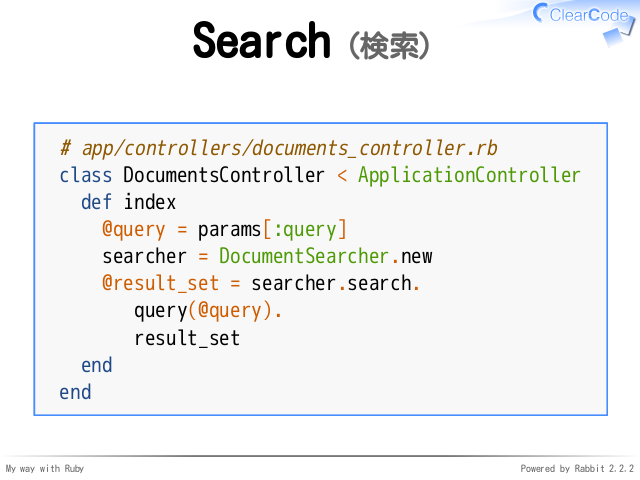 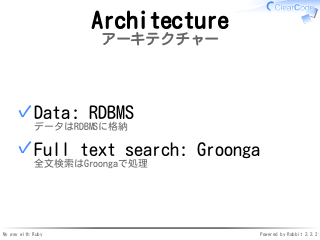 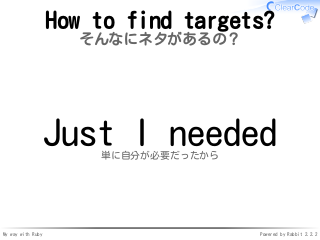 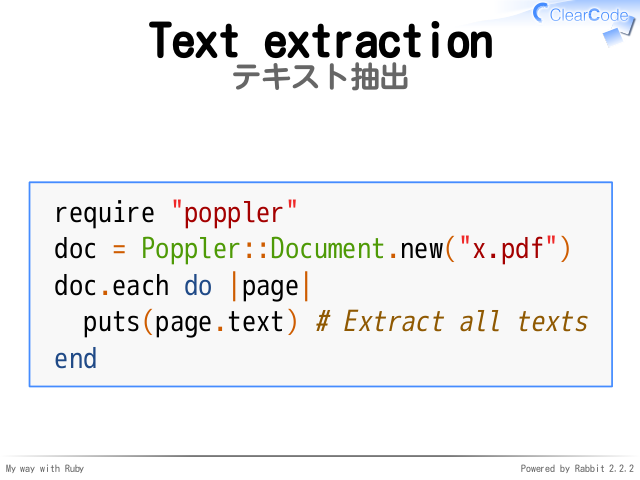 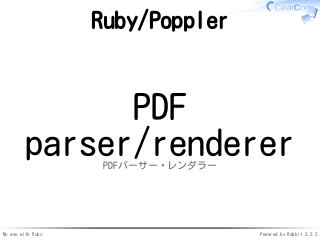 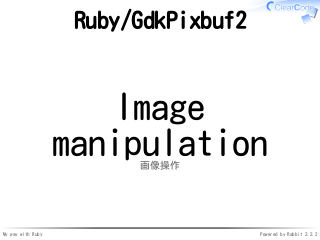 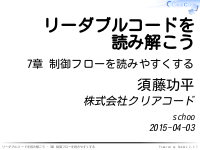 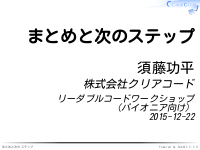 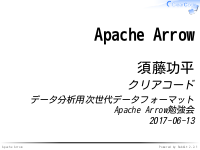 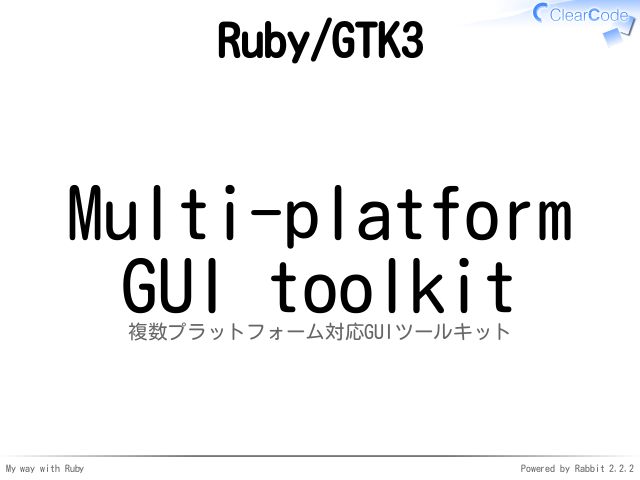 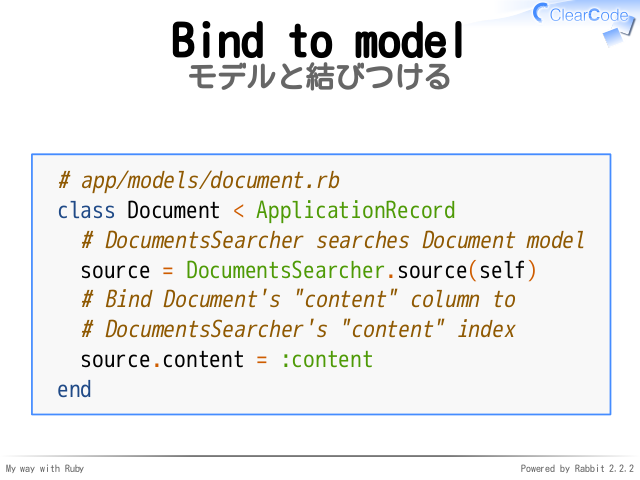 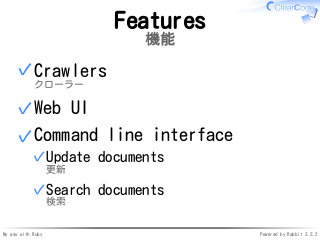 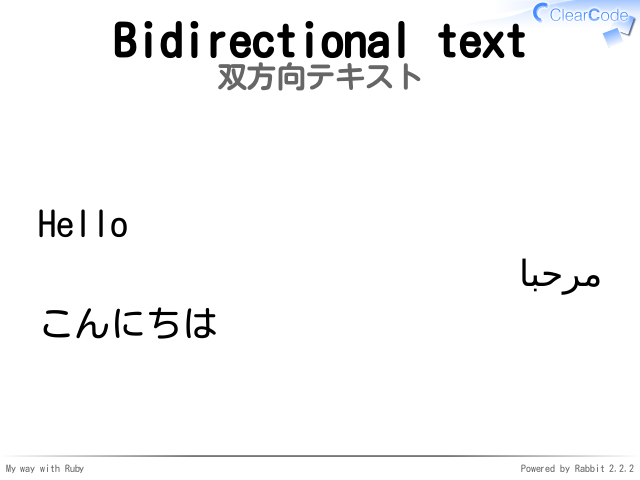 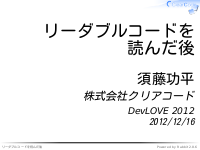 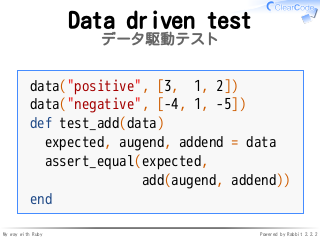 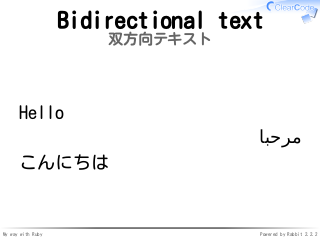 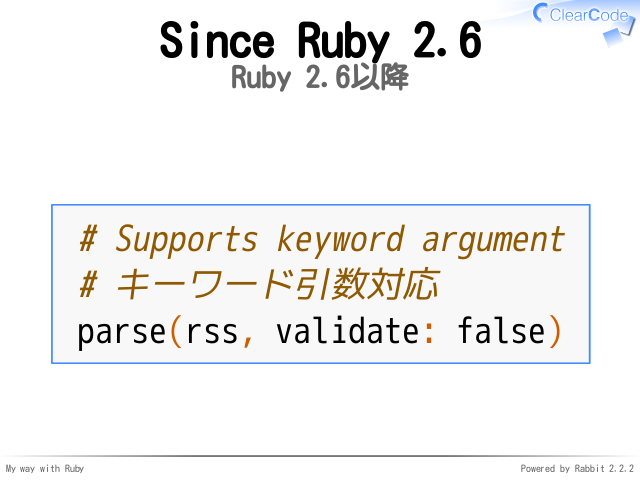 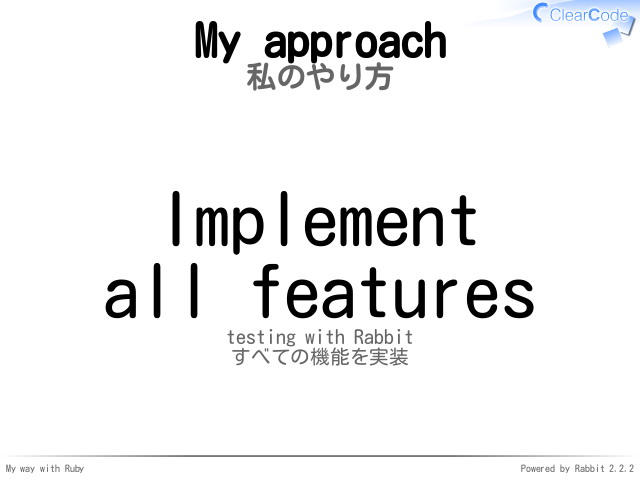 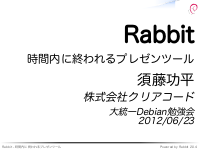 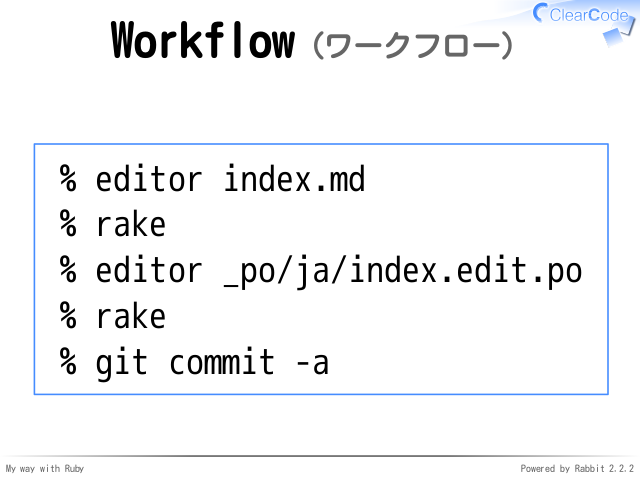 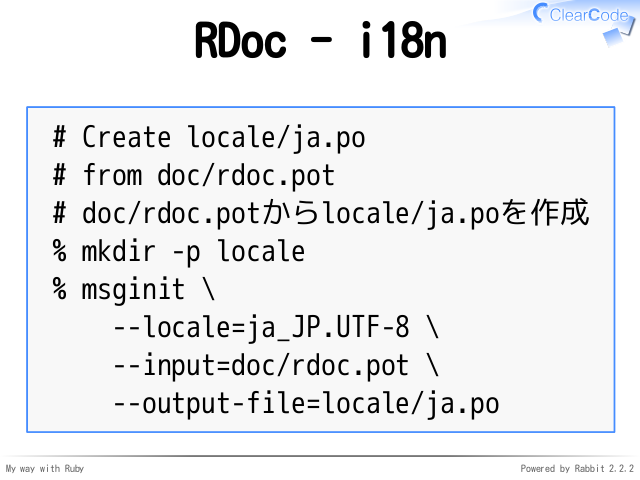 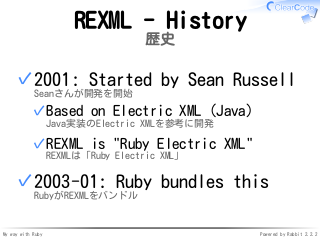 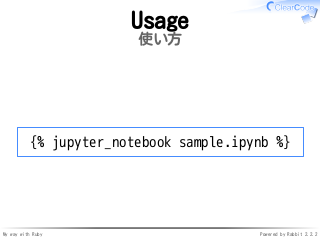 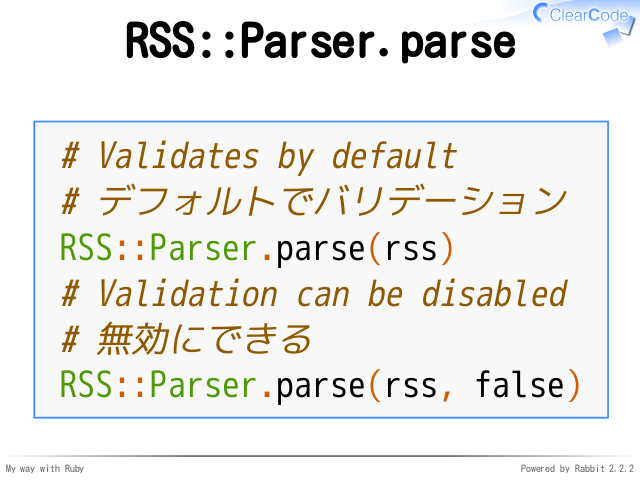 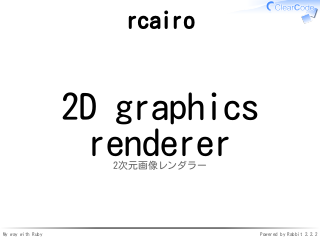 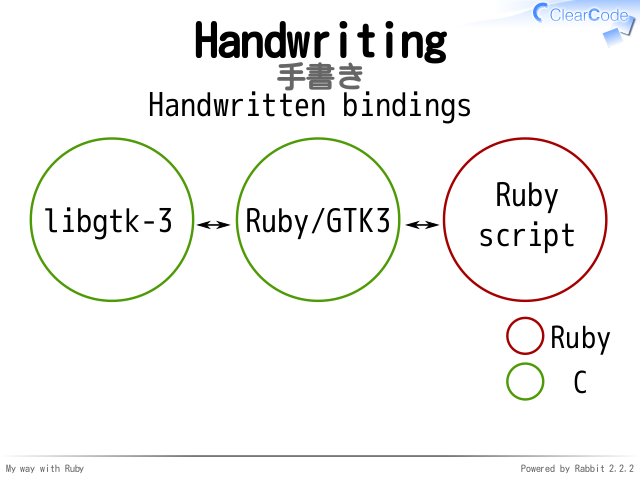 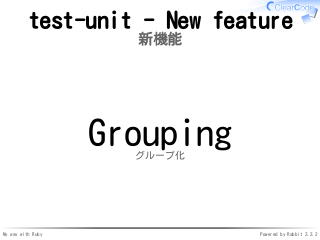 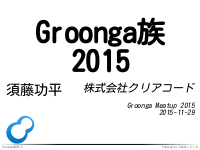 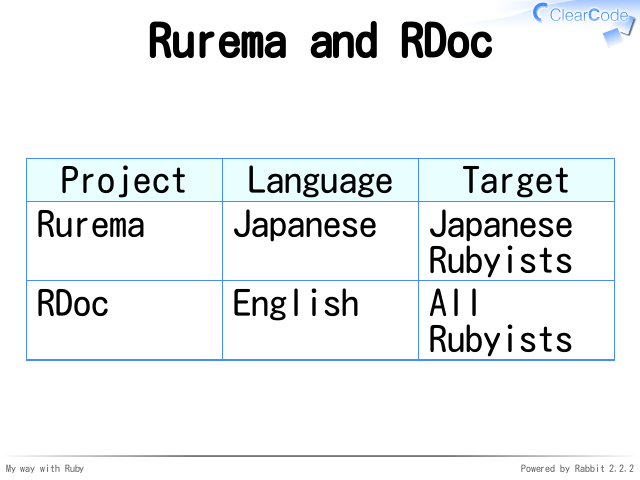 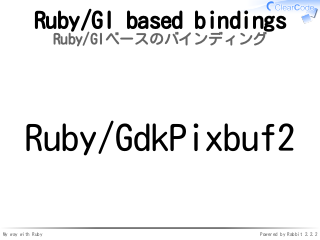 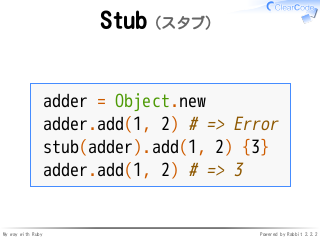 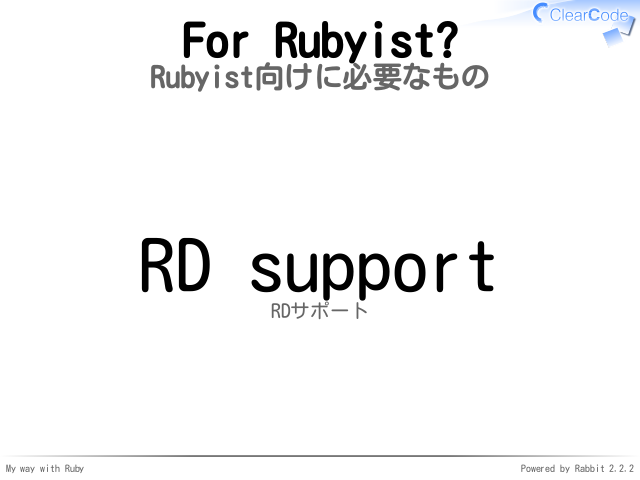 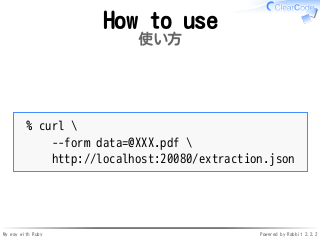 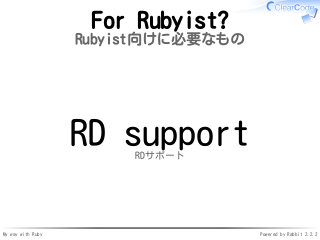 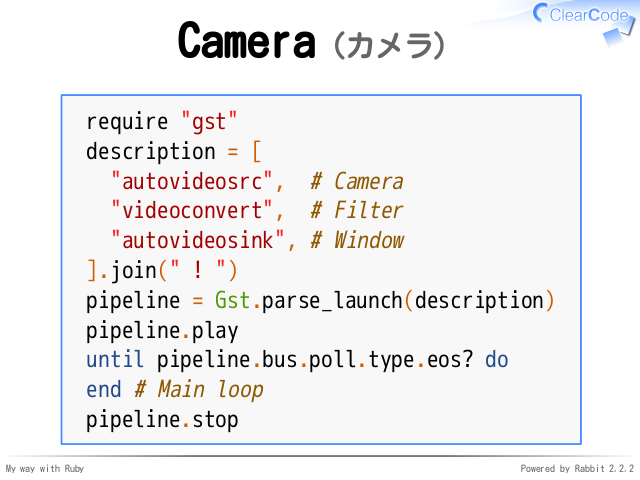 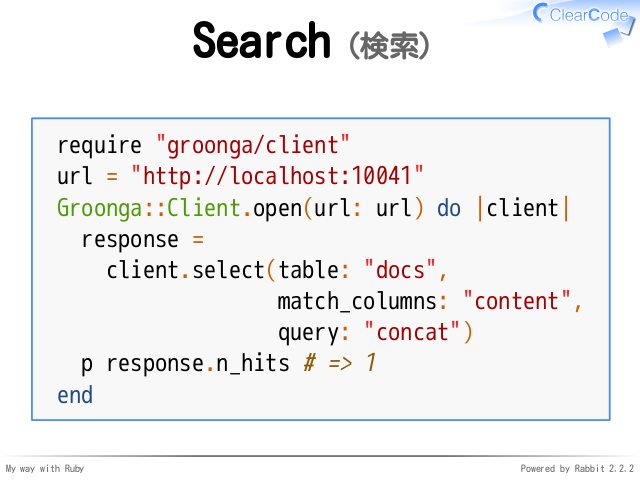 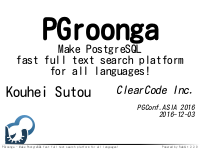 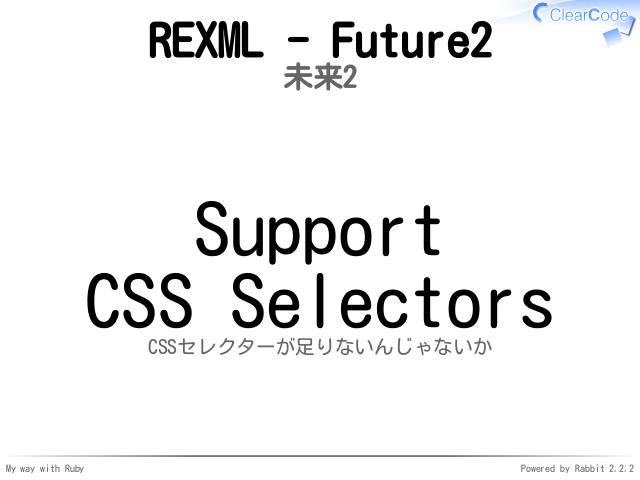 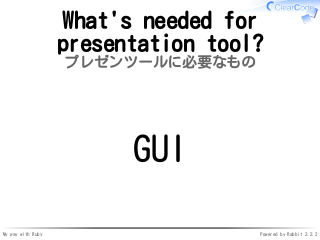 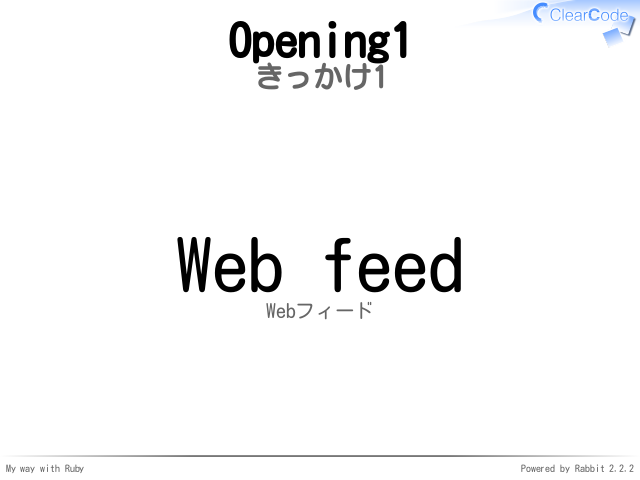 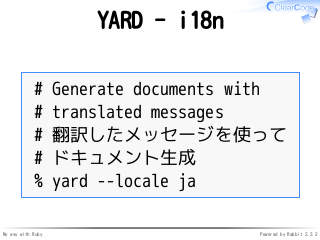 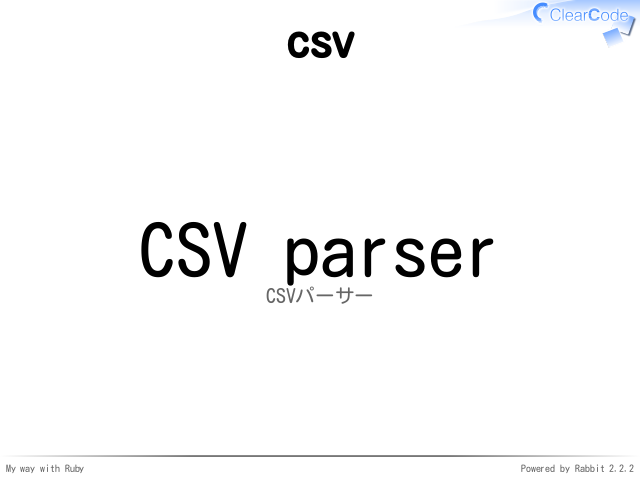 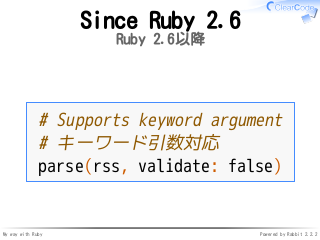 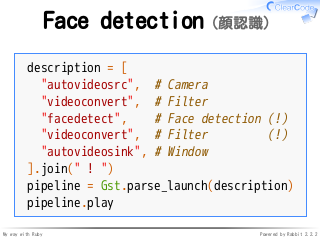 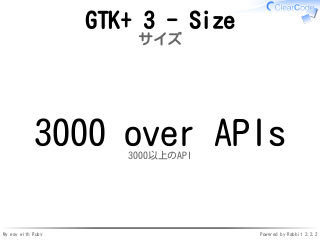 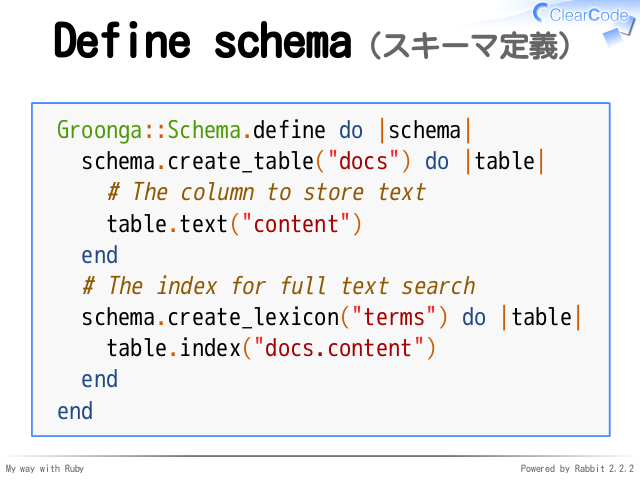 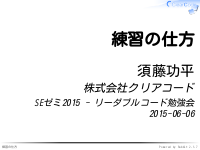 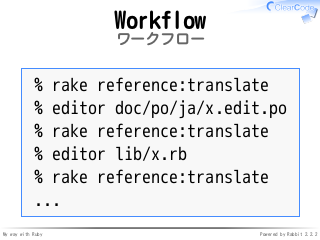 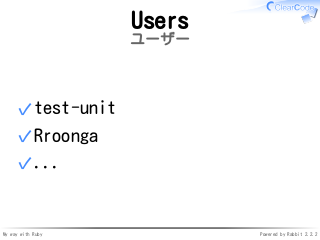 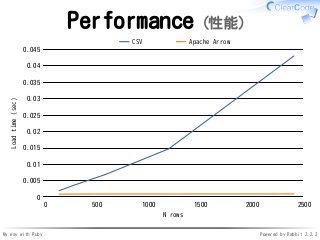 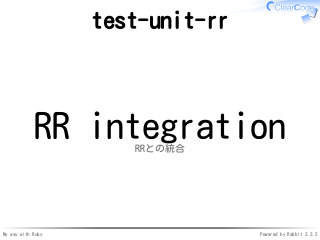 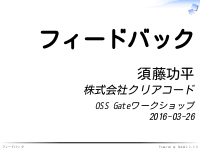 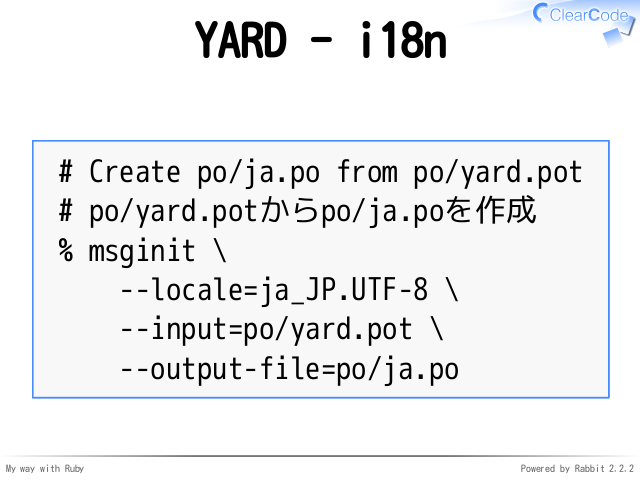 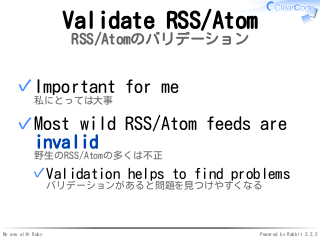 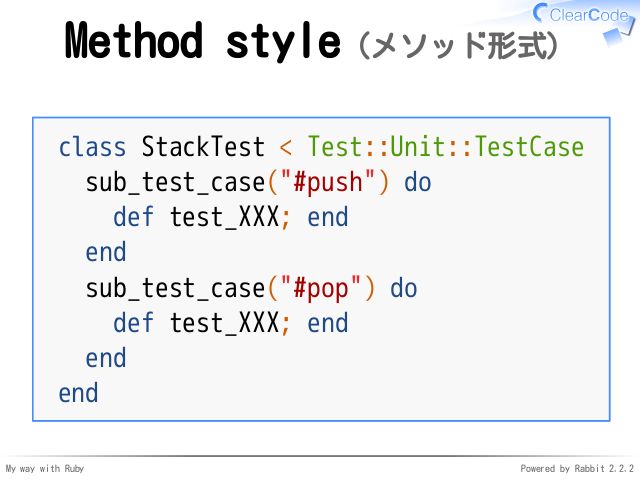 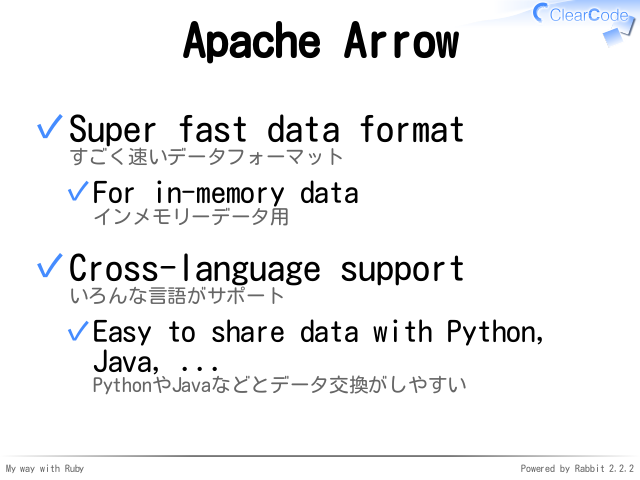 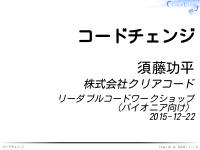 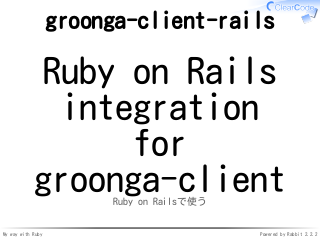 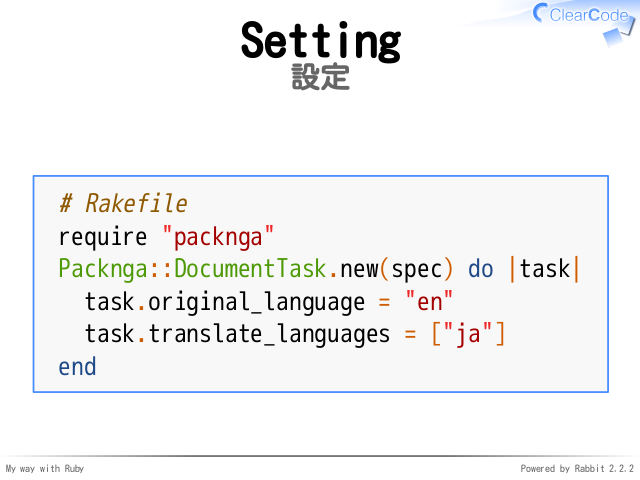 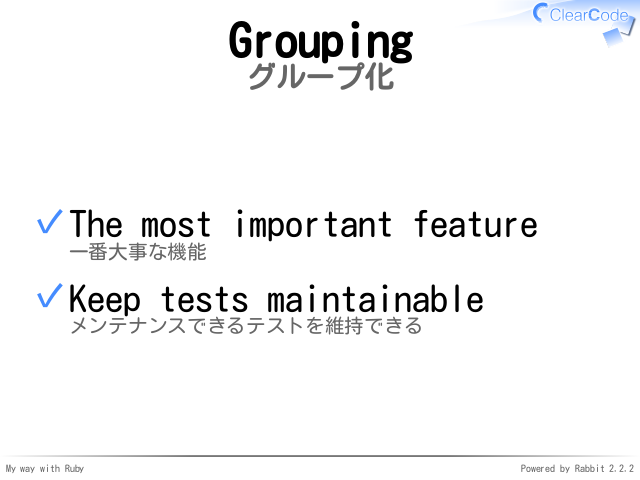 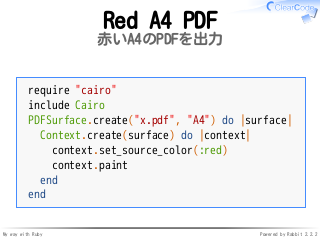 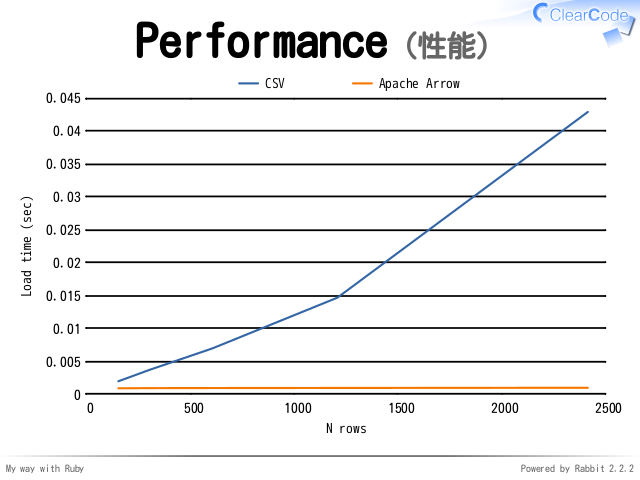 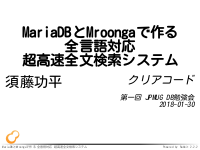 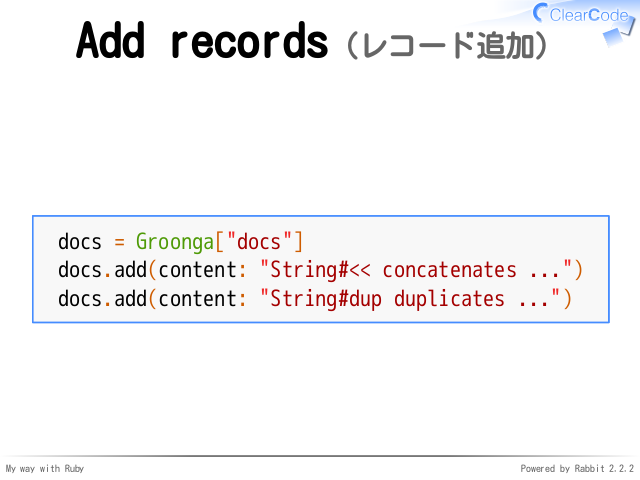 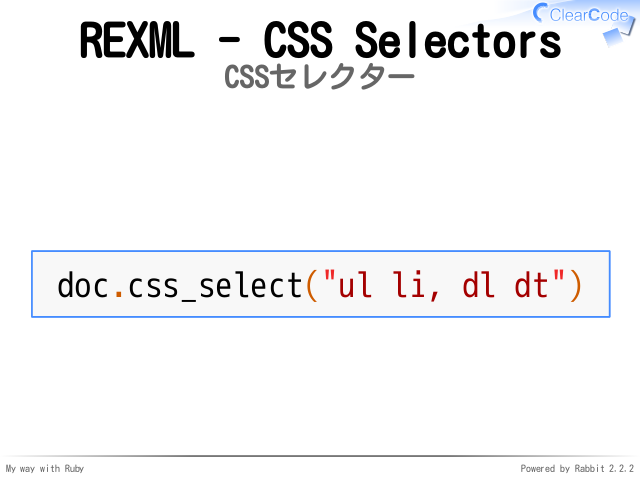 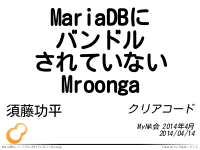 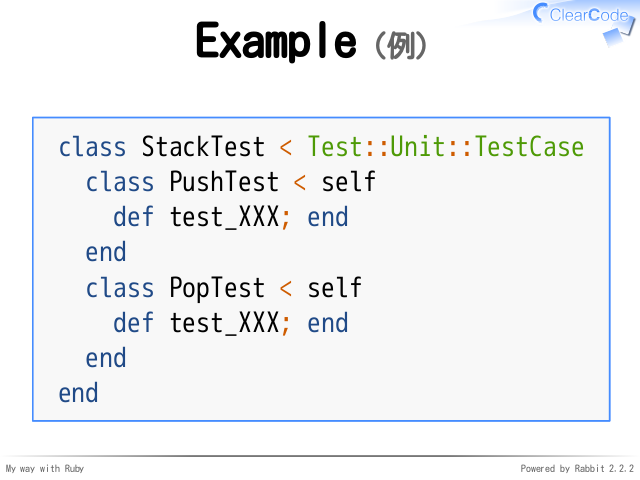 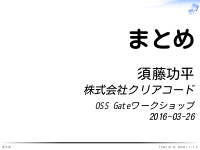 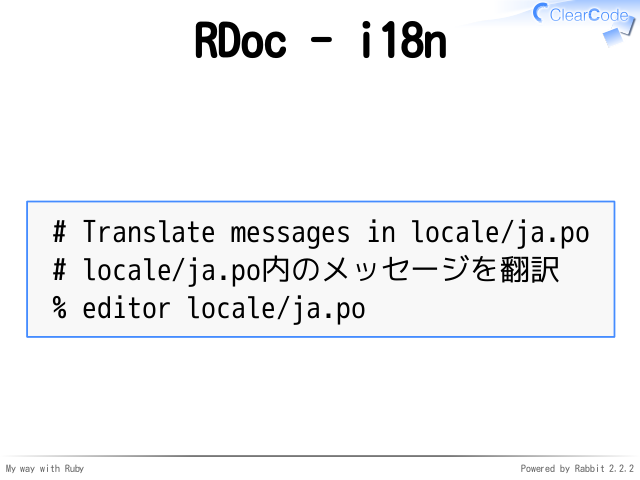 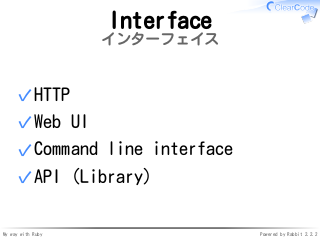 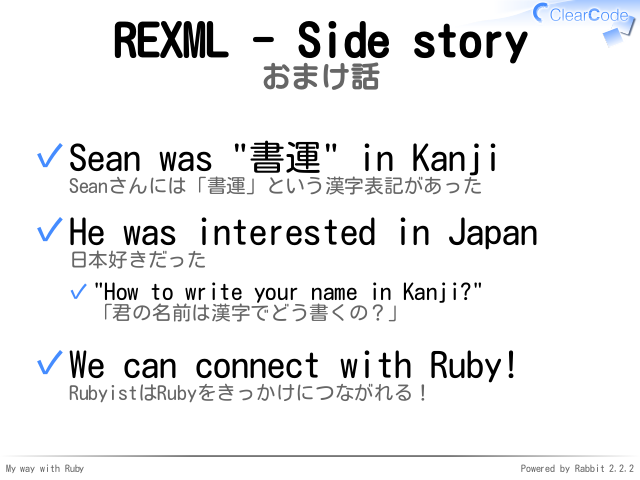 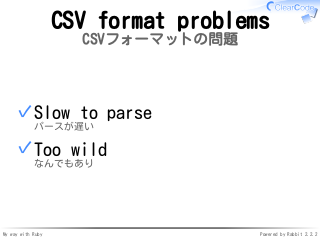 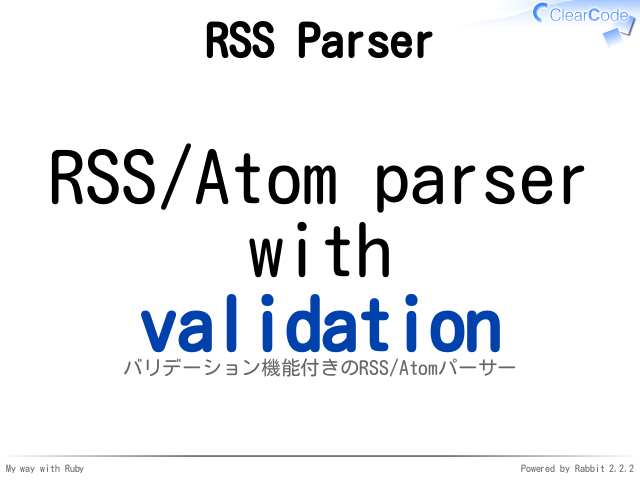 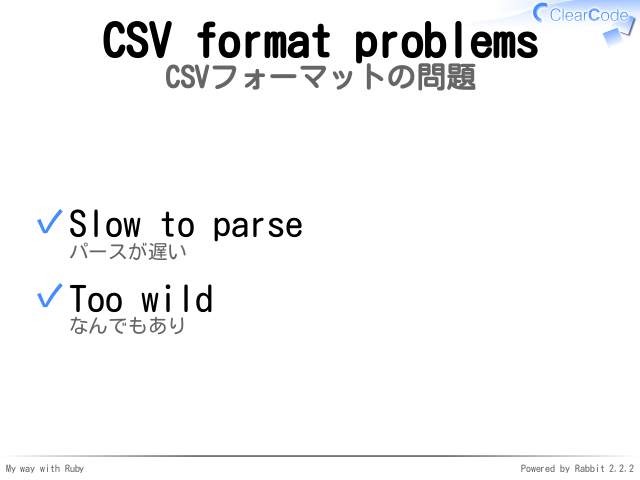 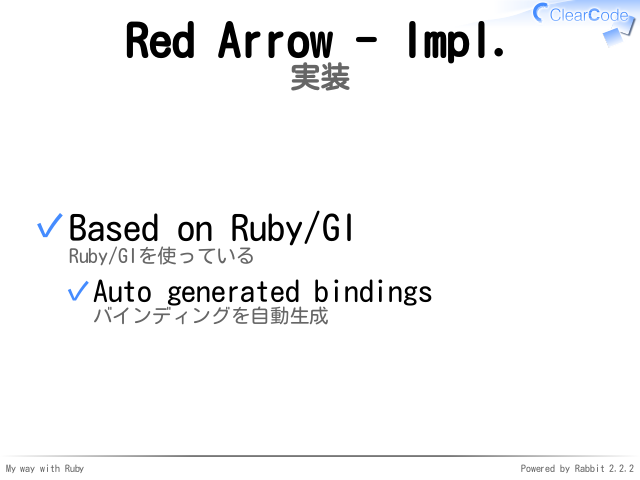 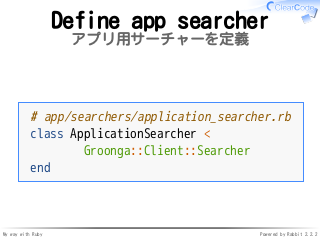 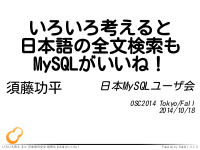 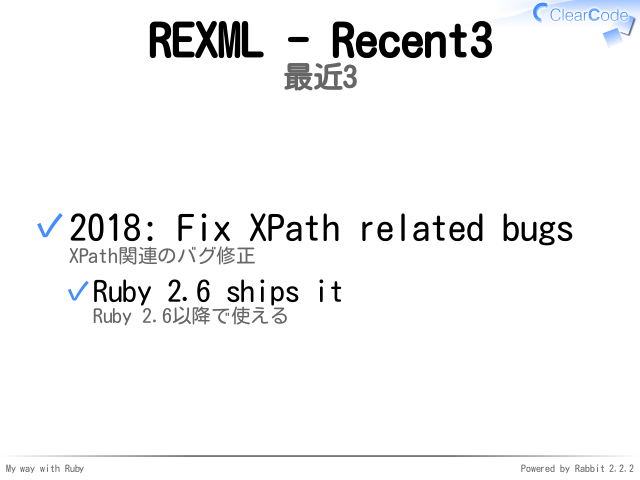 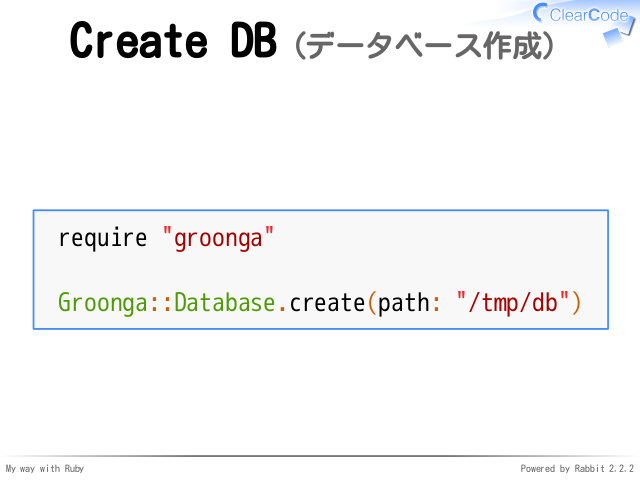 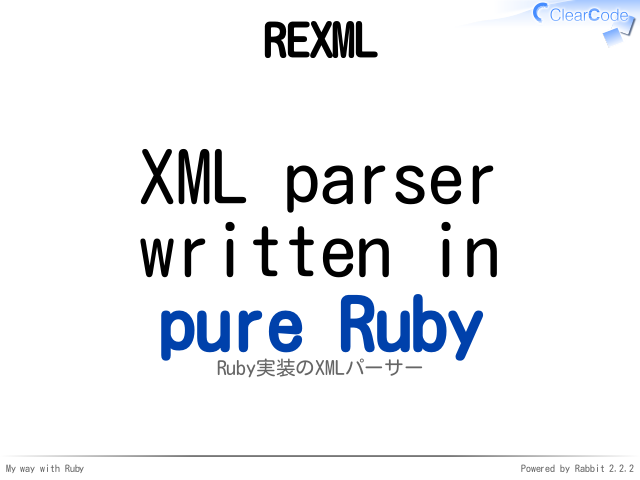 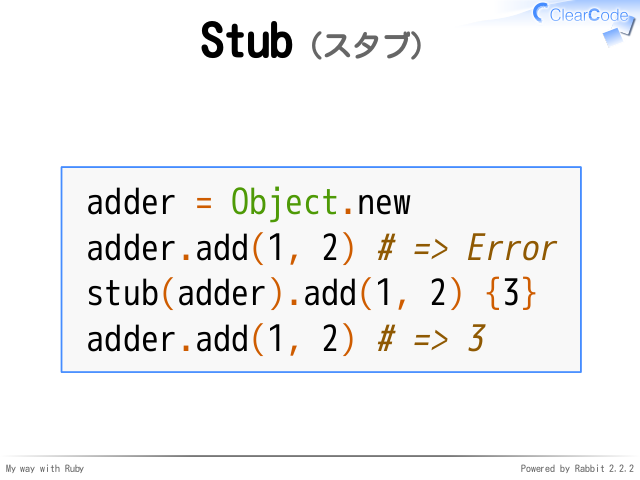 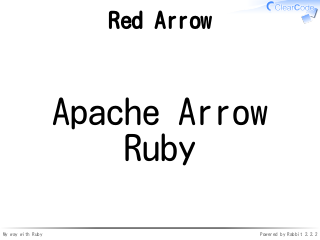 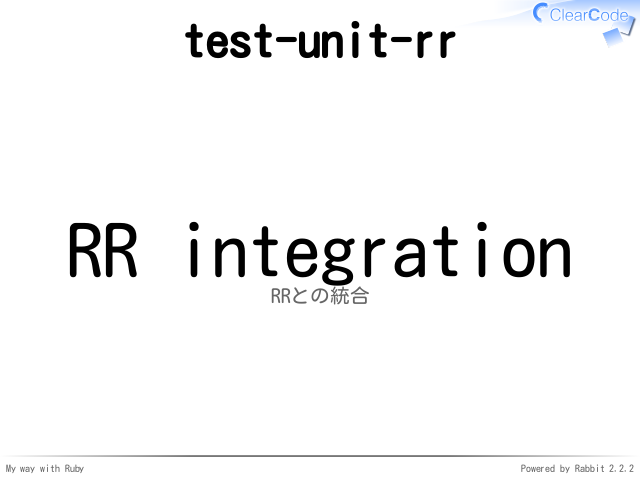 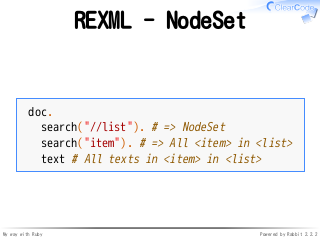 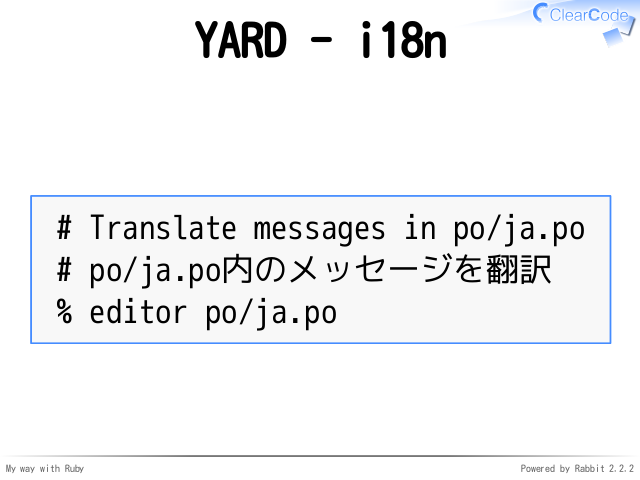 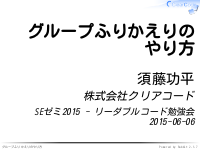 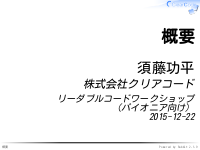 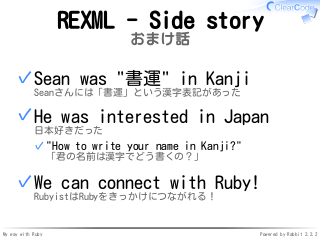 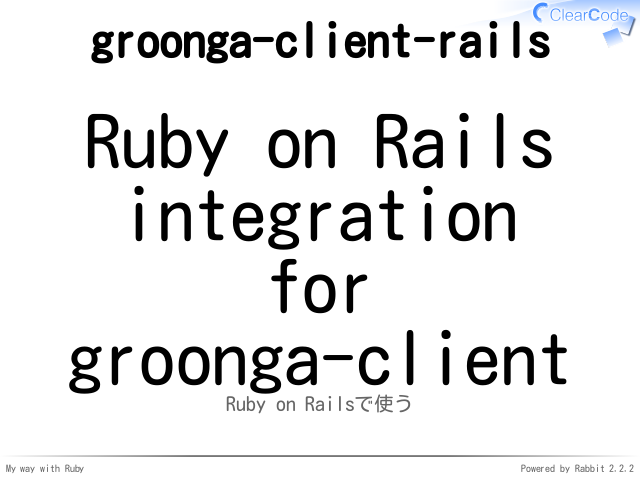 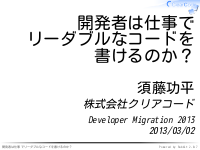 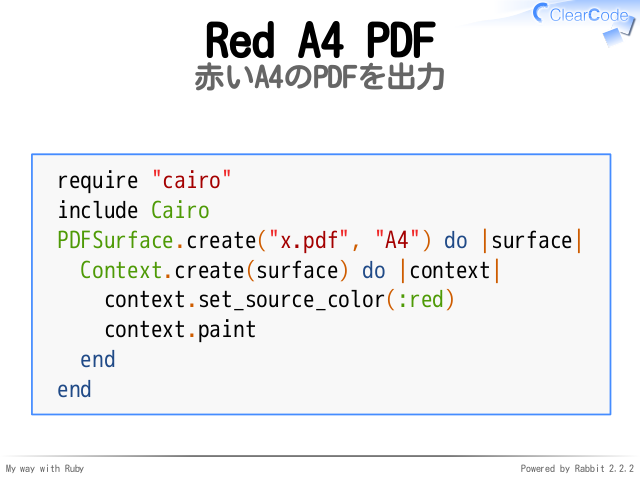 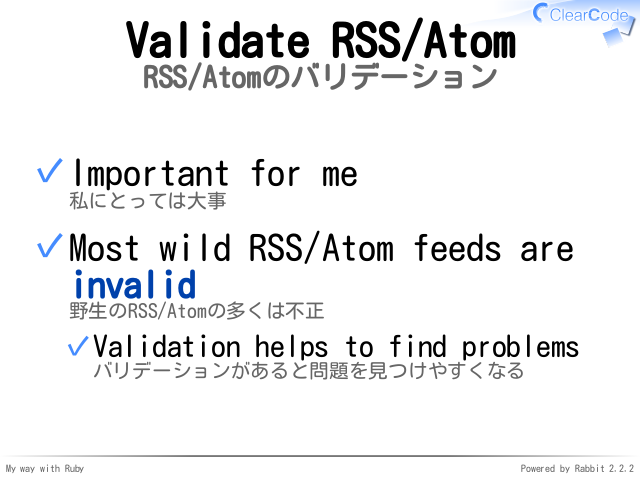 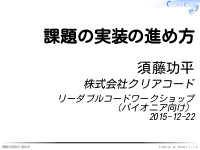 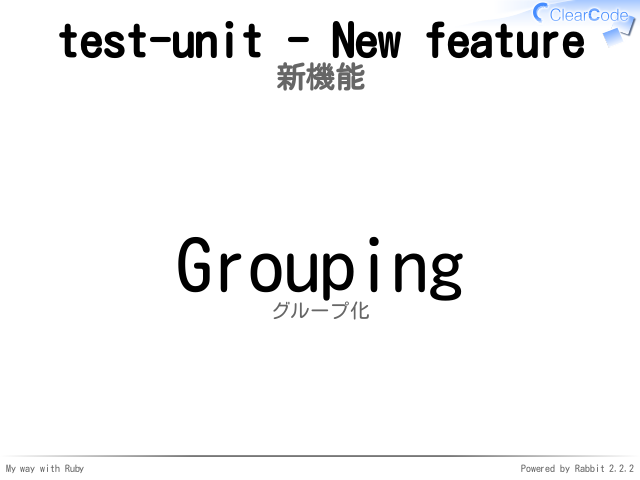 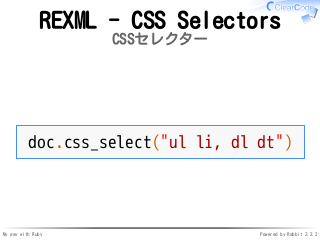 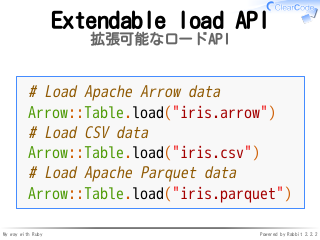 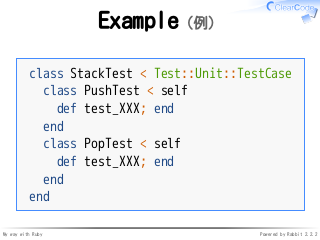 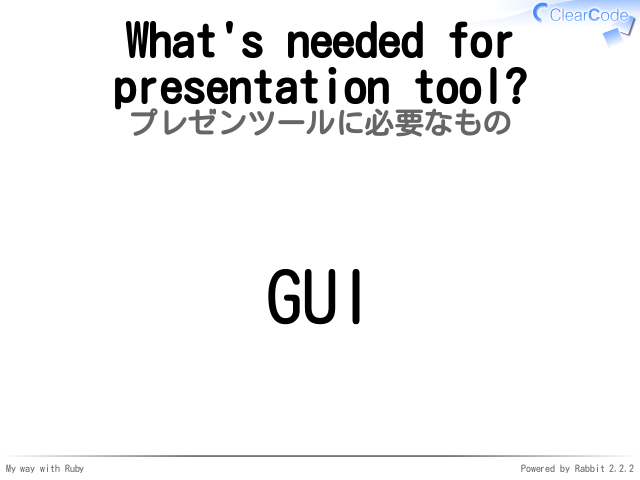 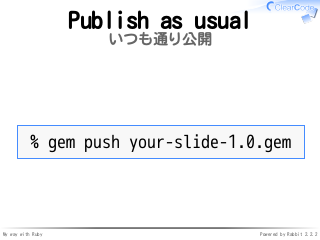 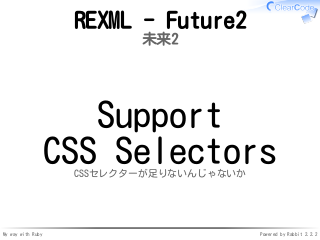 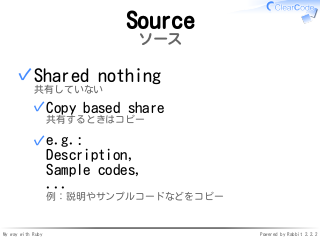 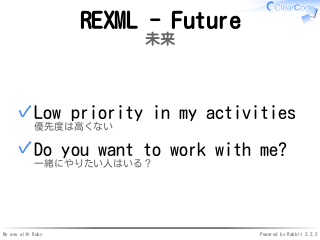 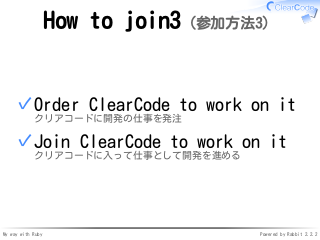 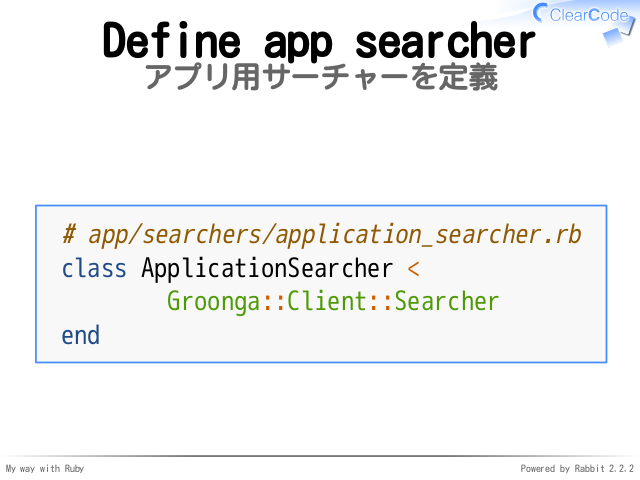 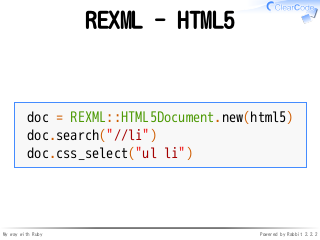 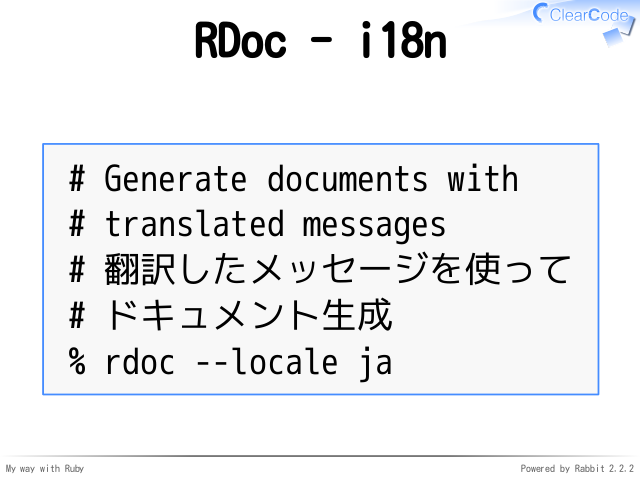 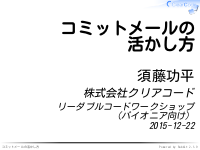 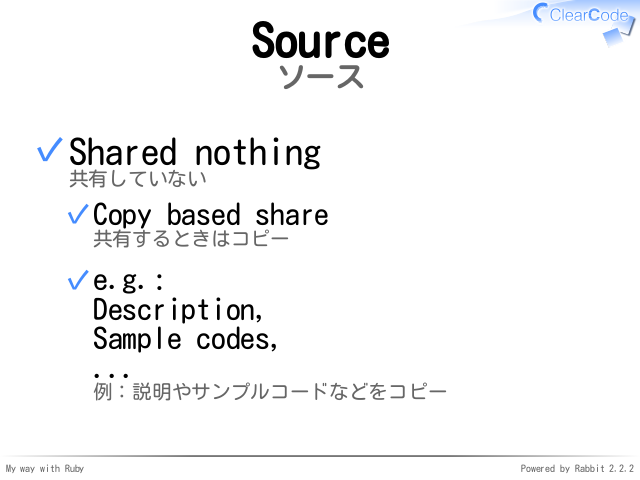 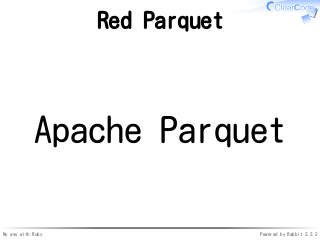 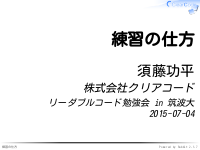 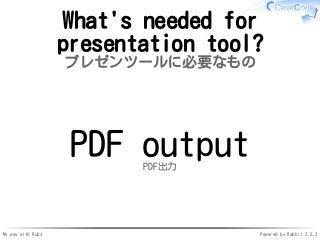 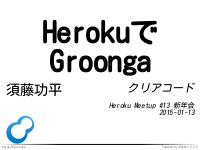 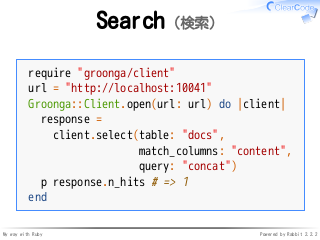 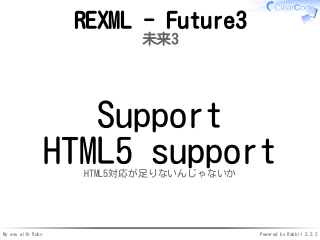 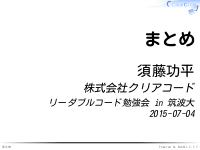 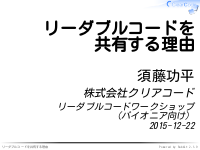 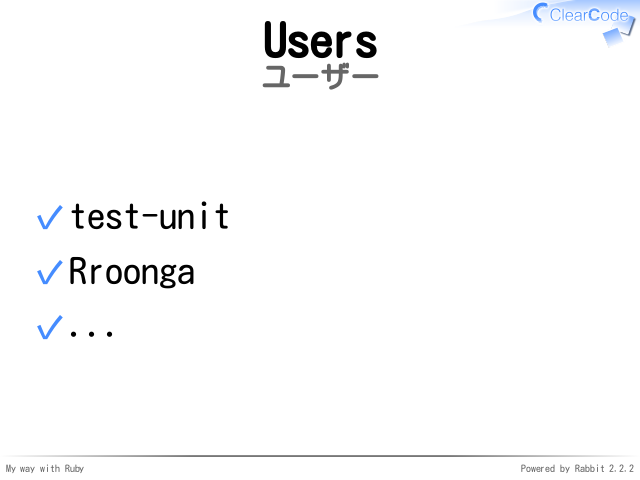 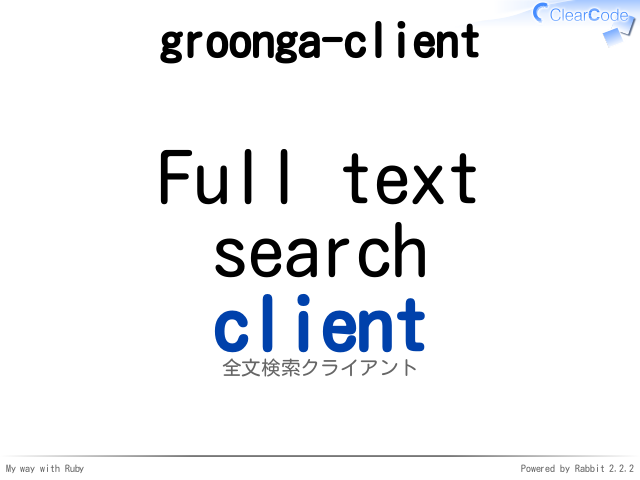 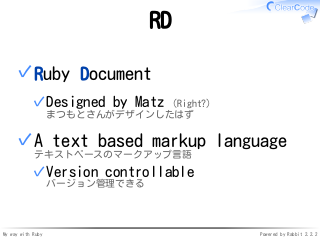 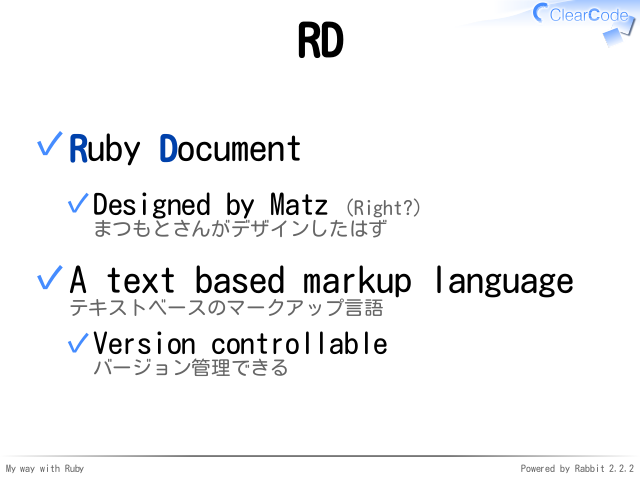 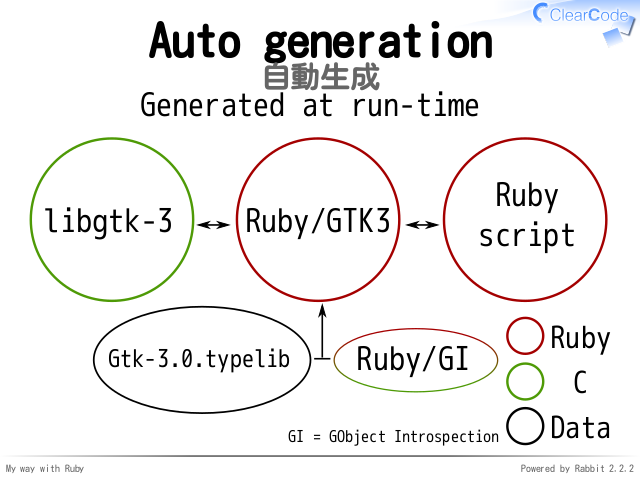 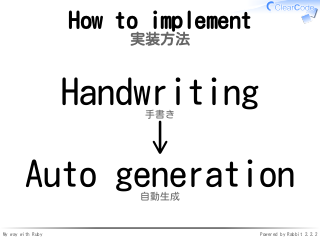 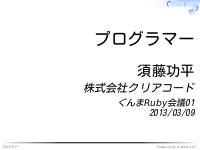 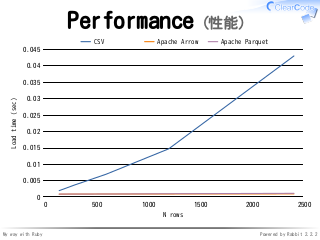 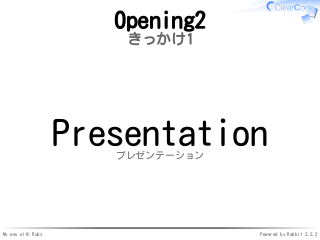 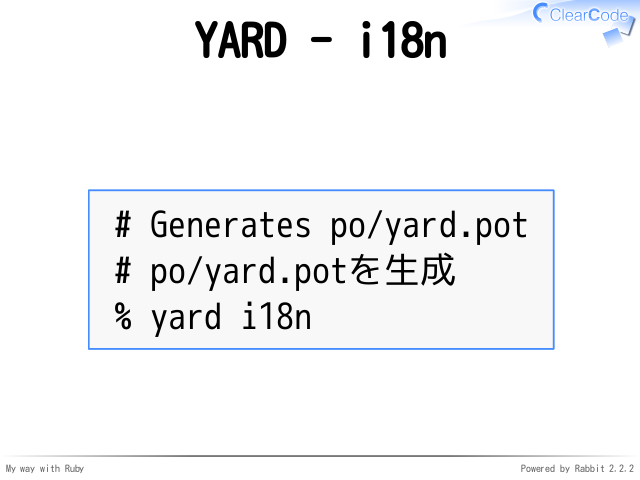 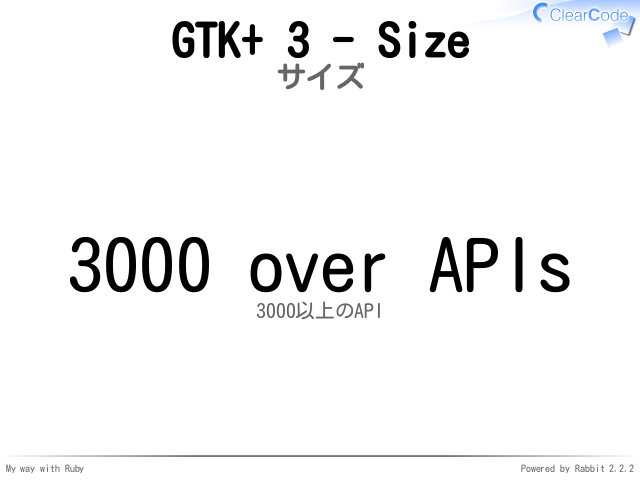 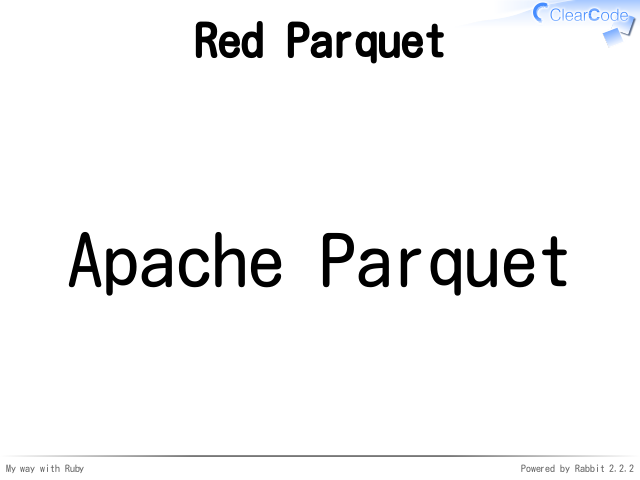 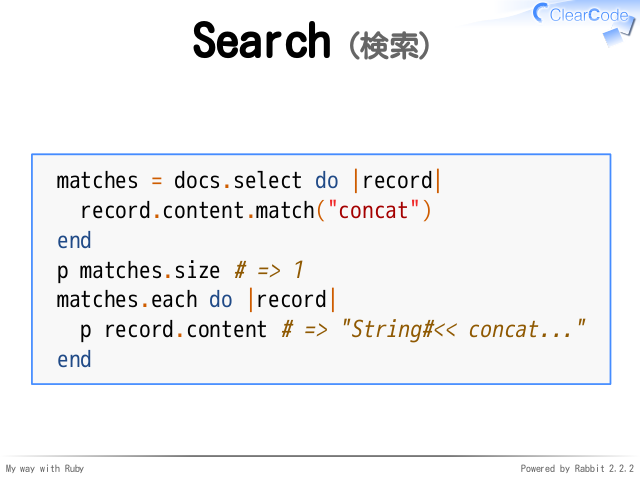 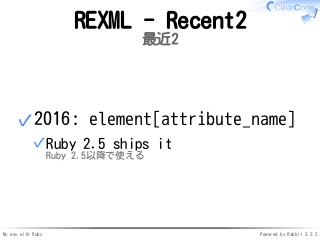 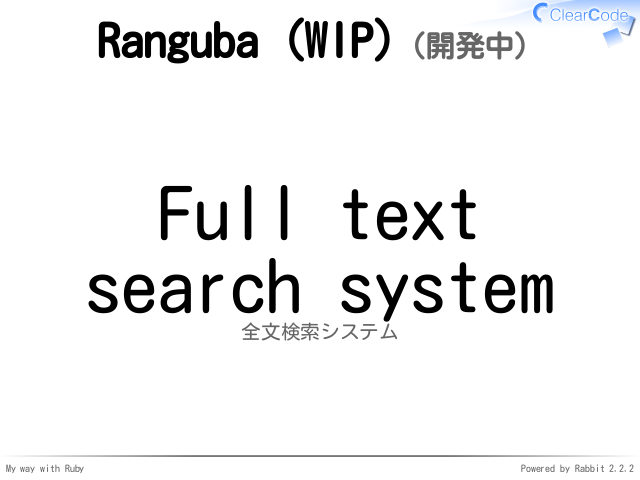 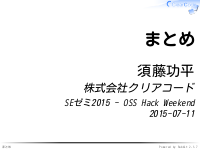 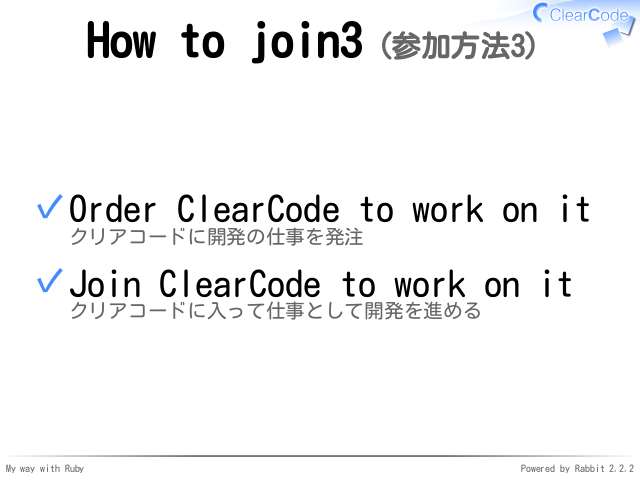 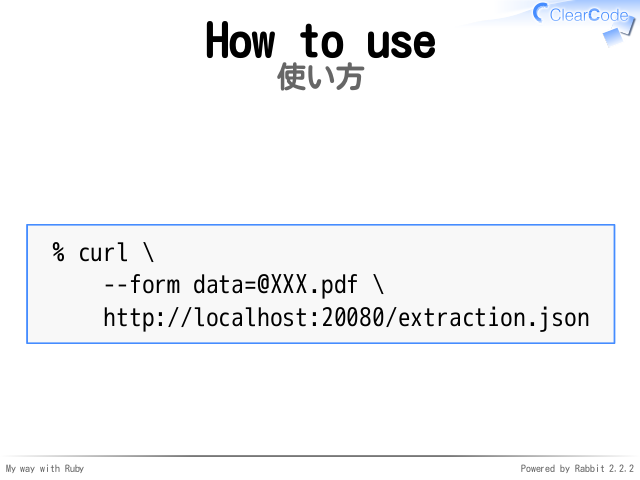 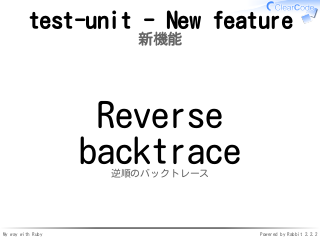 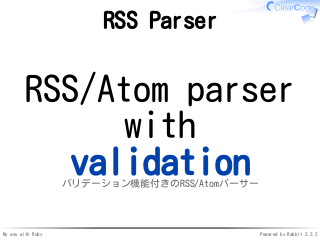 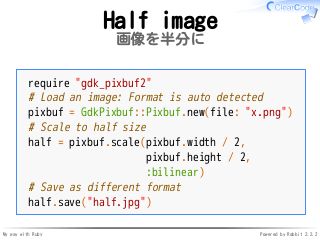 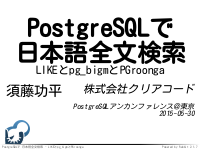 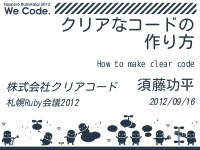 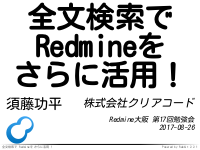 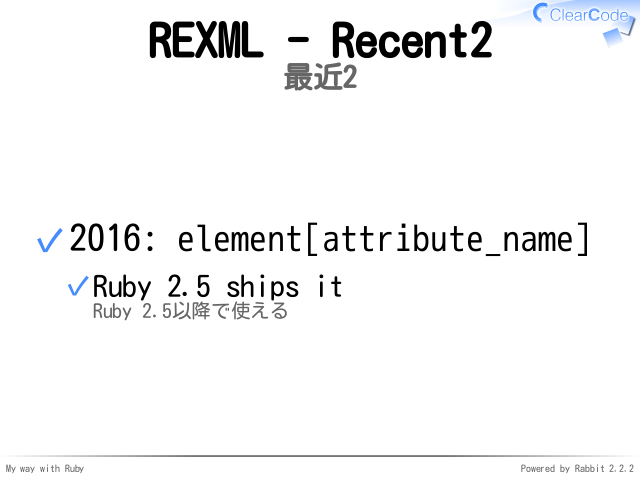 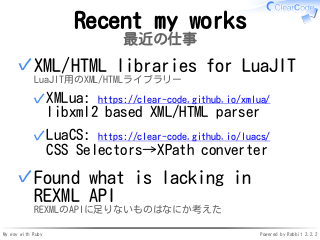 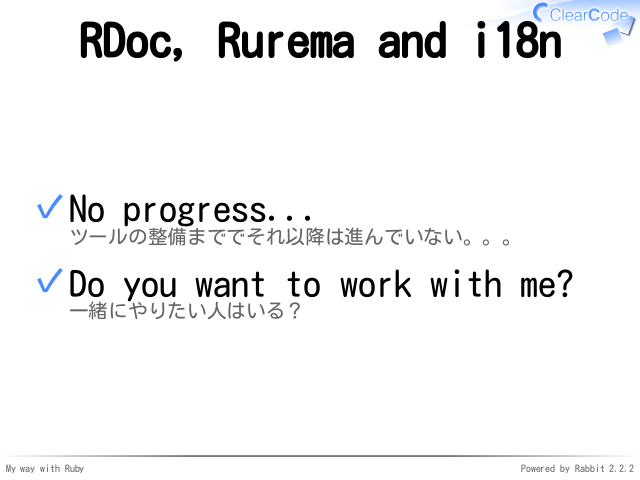 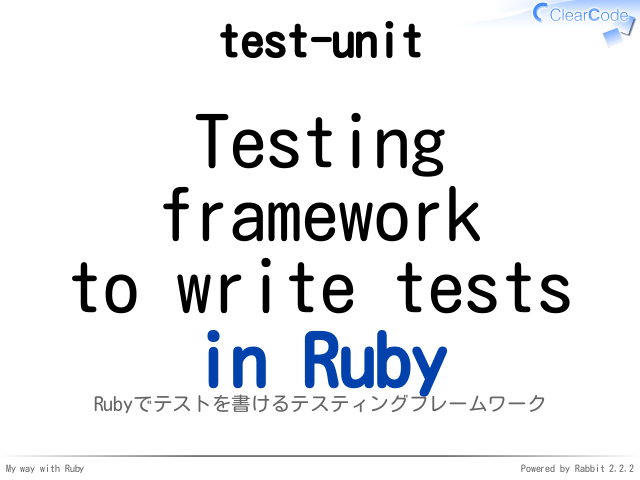 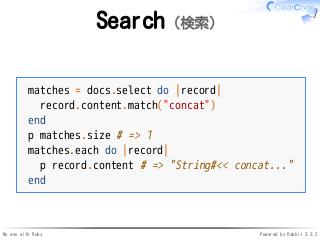 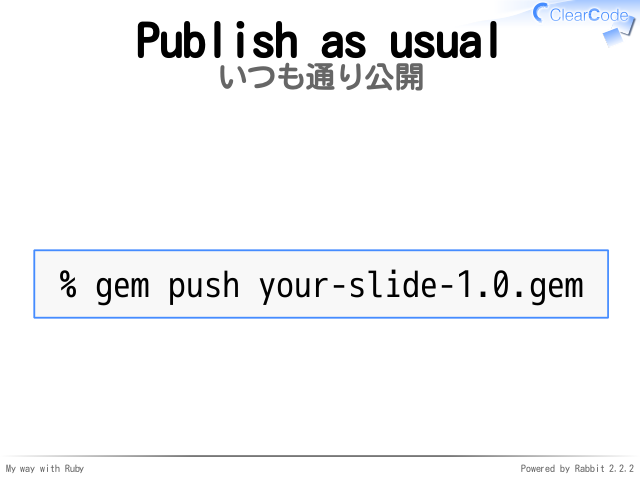 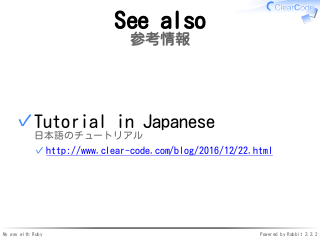 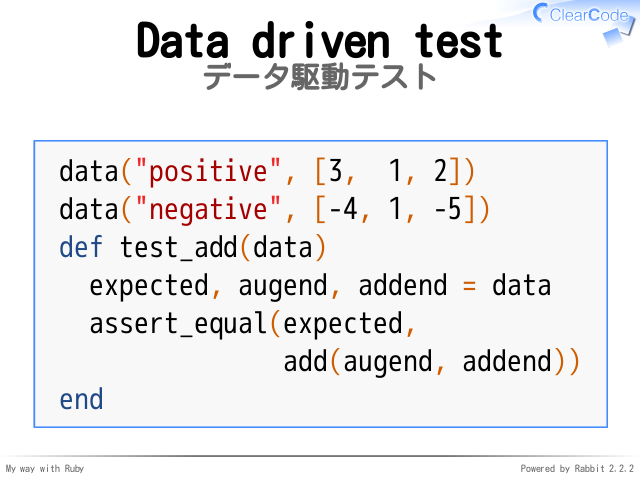 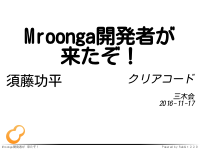 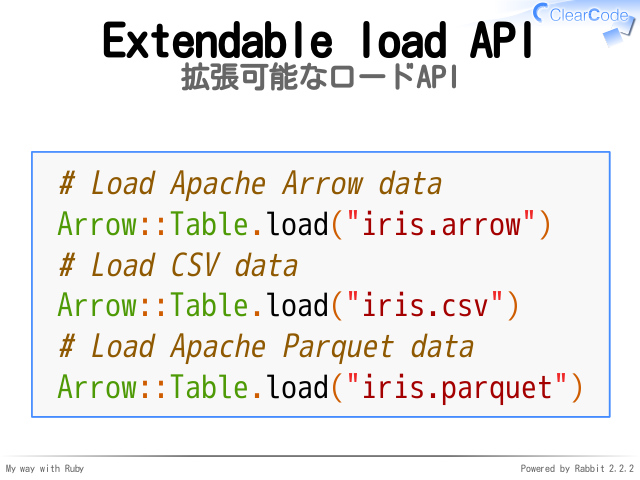 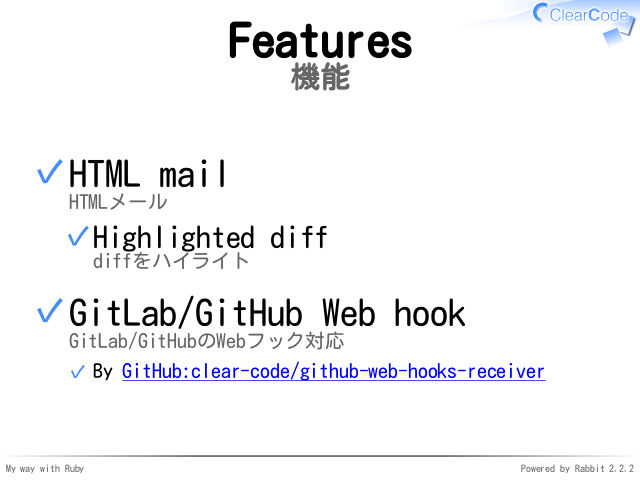 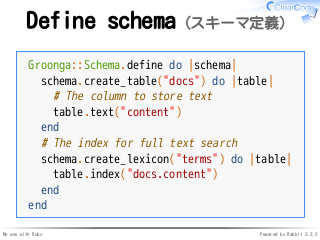 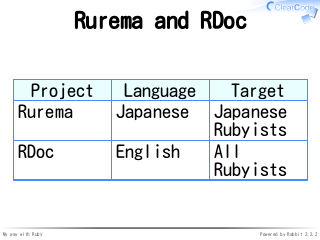 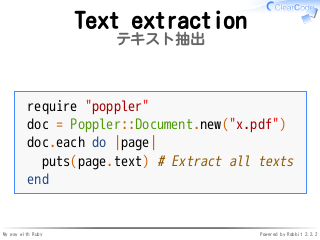 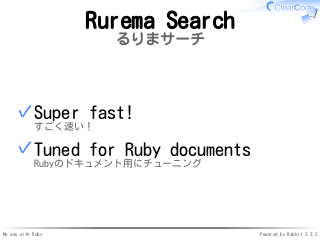 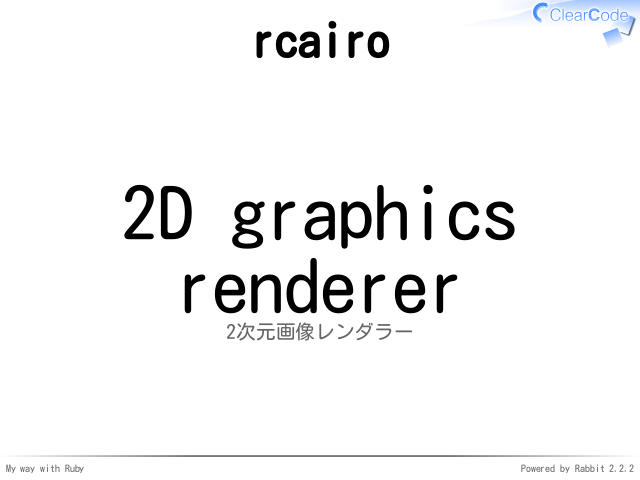 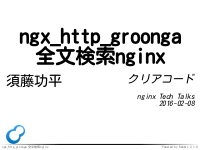 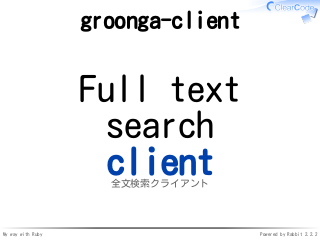 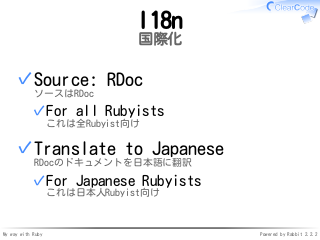 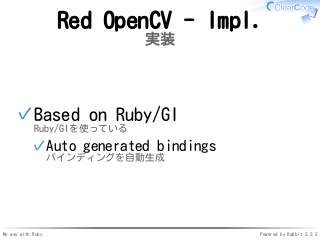 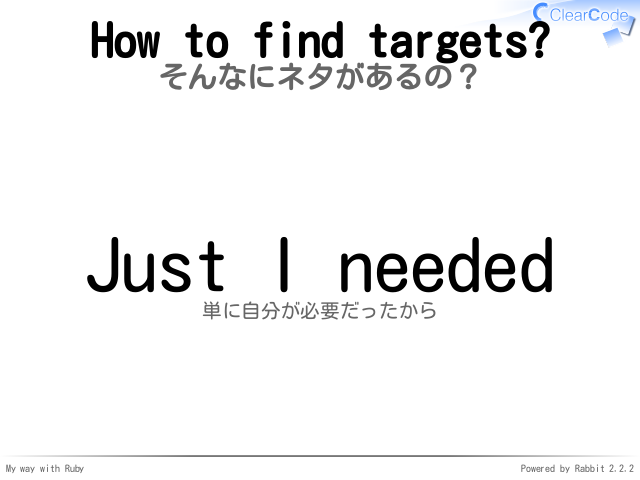 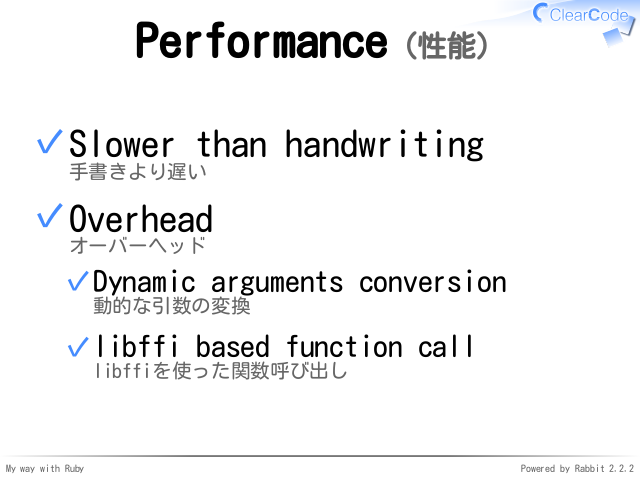 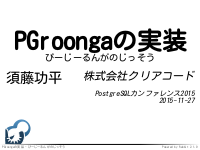 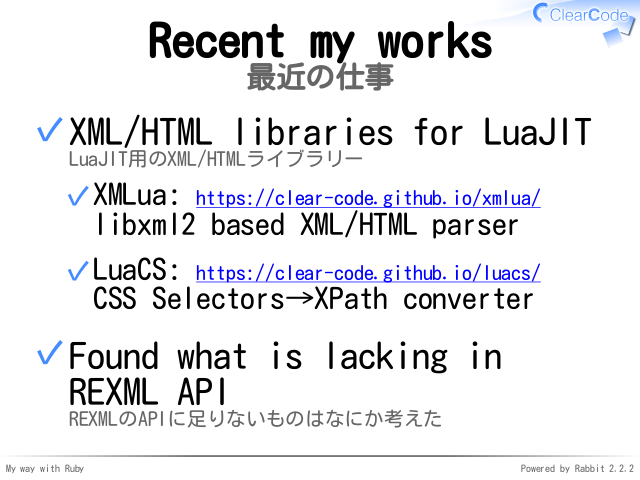 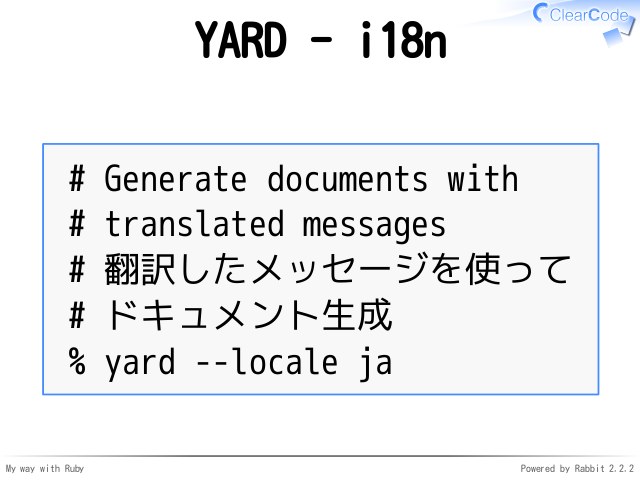 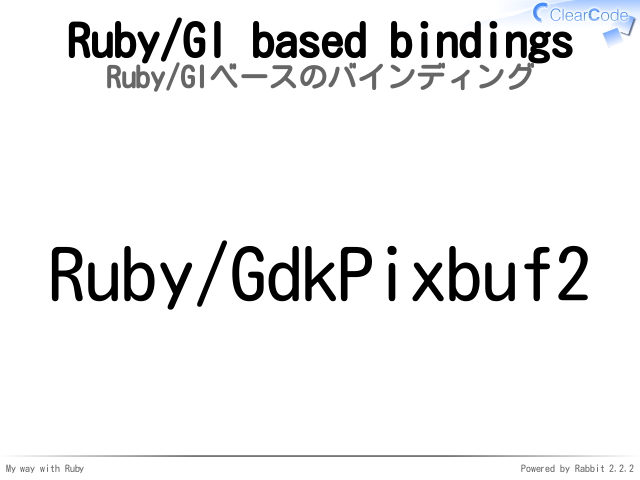 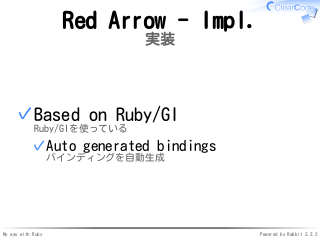 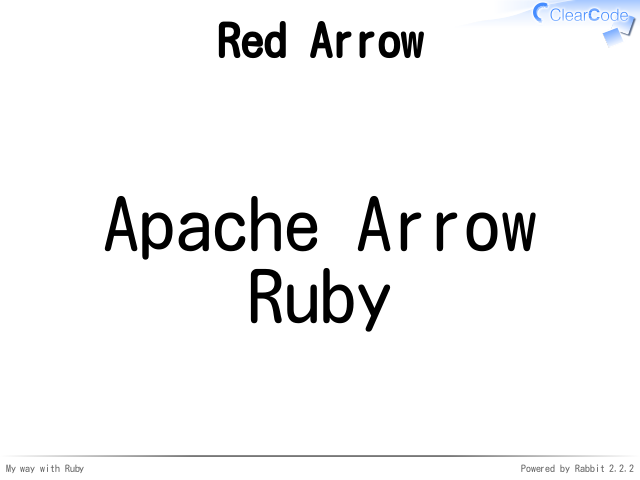 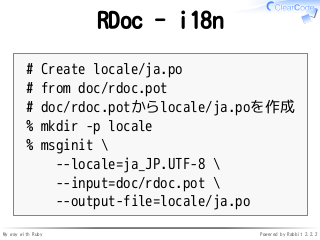 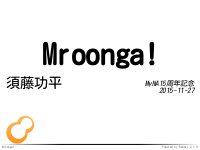 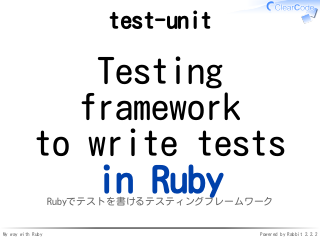 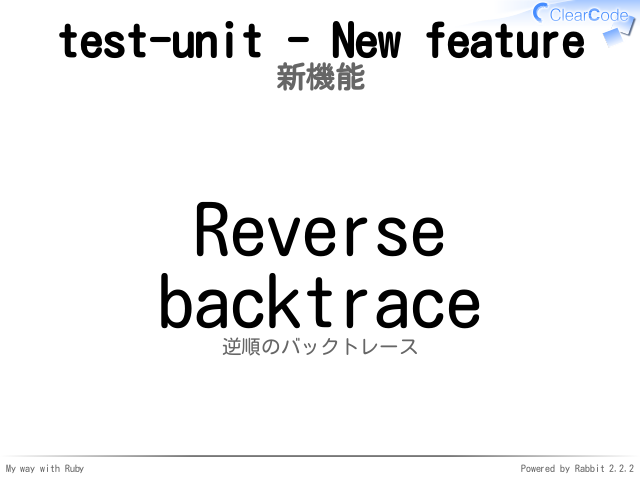 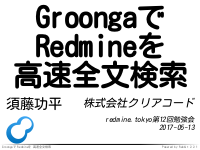 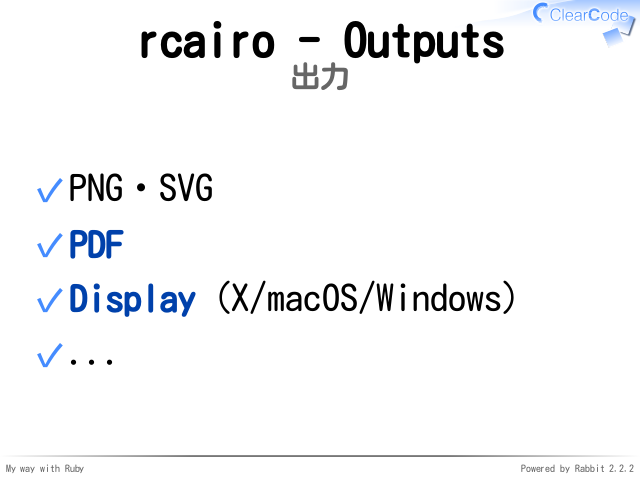 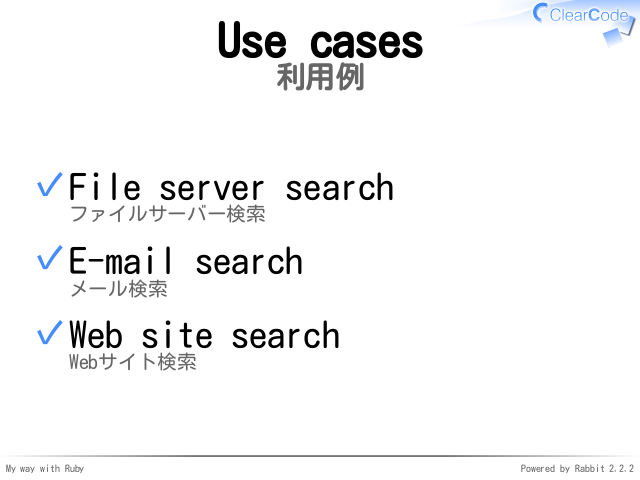 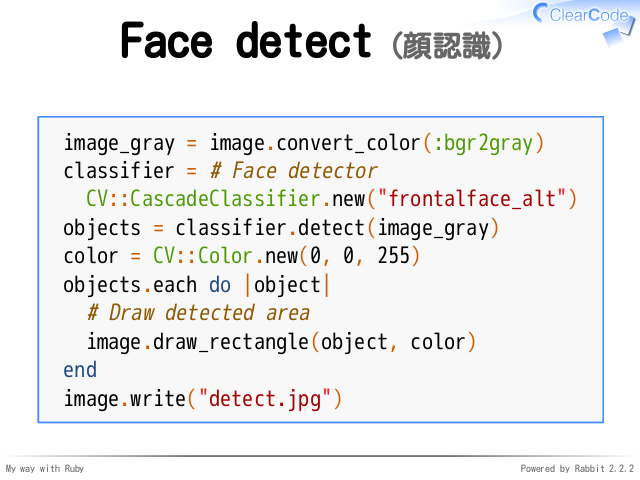 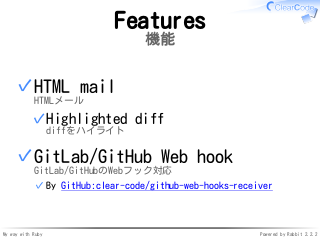 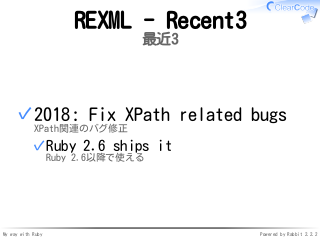 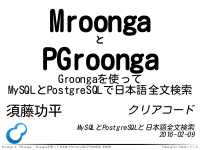 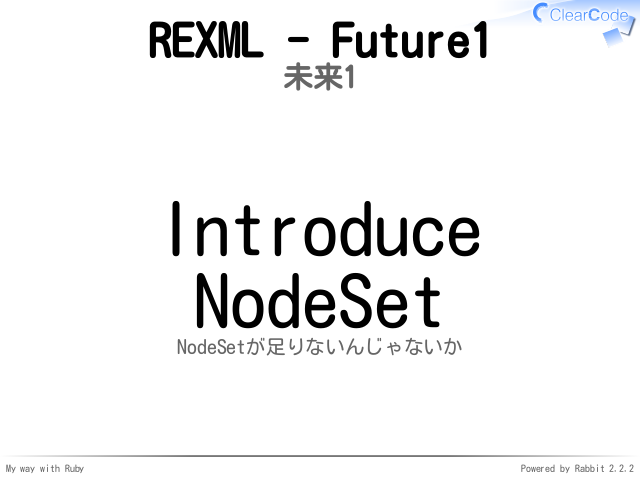 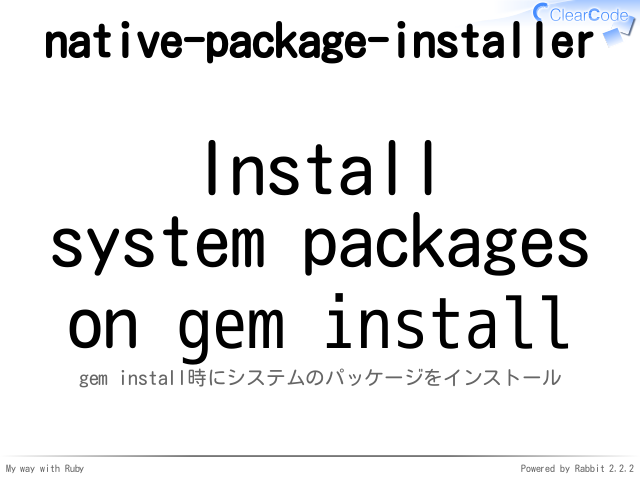 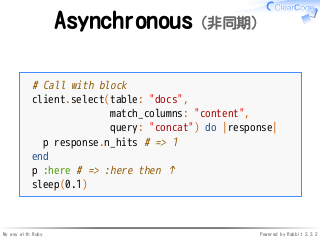 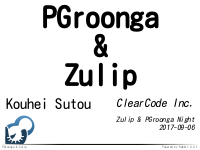 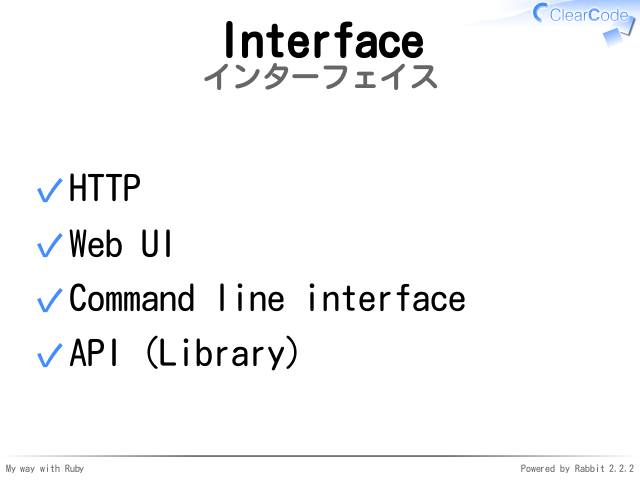 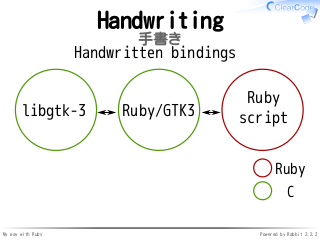 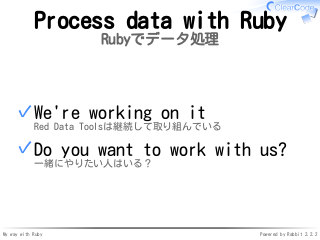 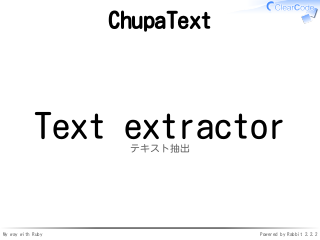 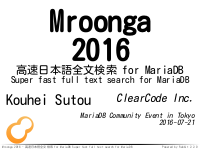 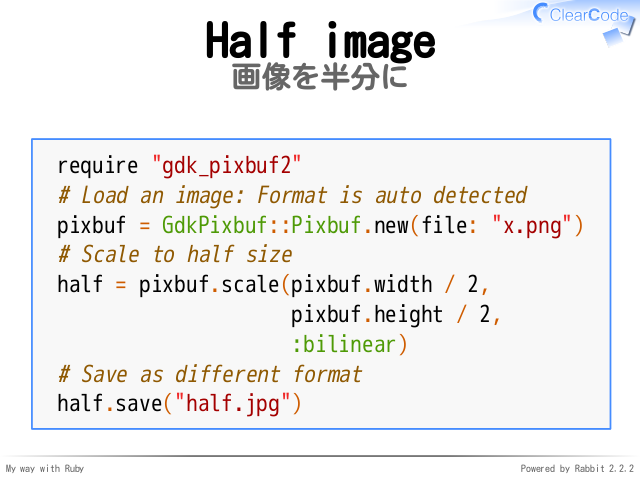 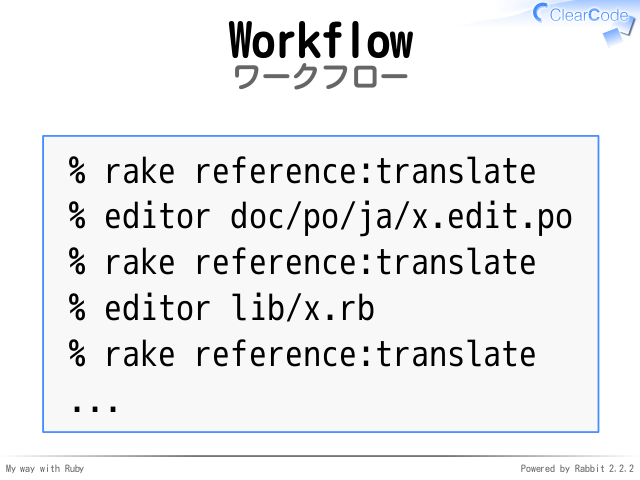 ✓ REXML is "Ruby Electric XML"
✓ "How to write your name in Kanji?" 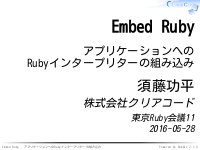 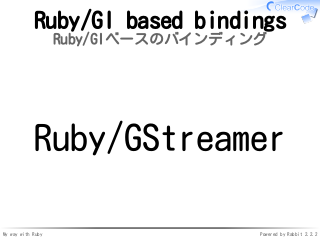 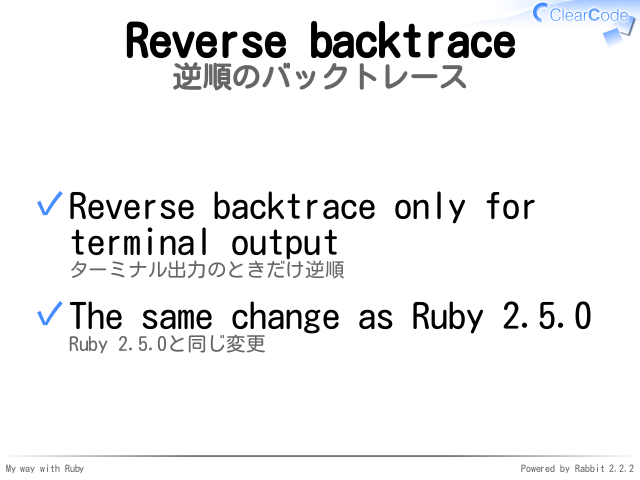 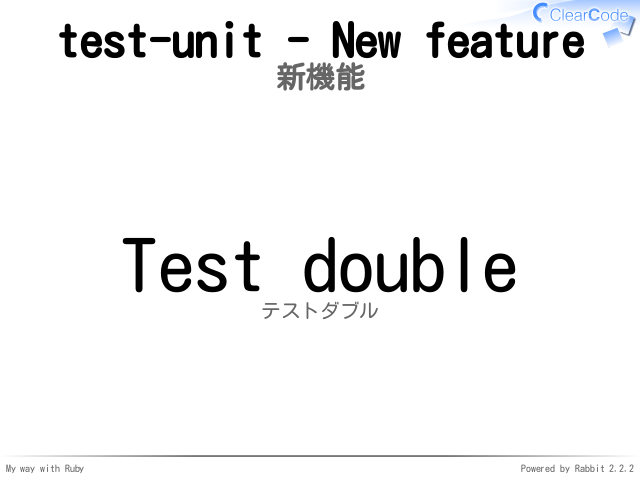 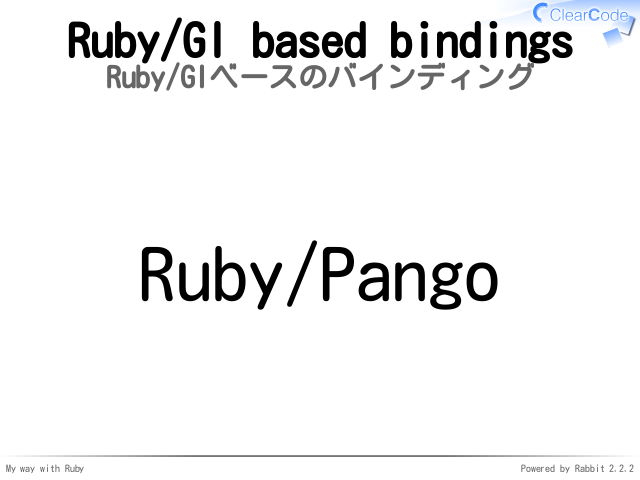 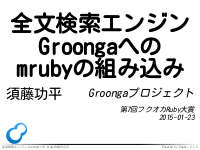 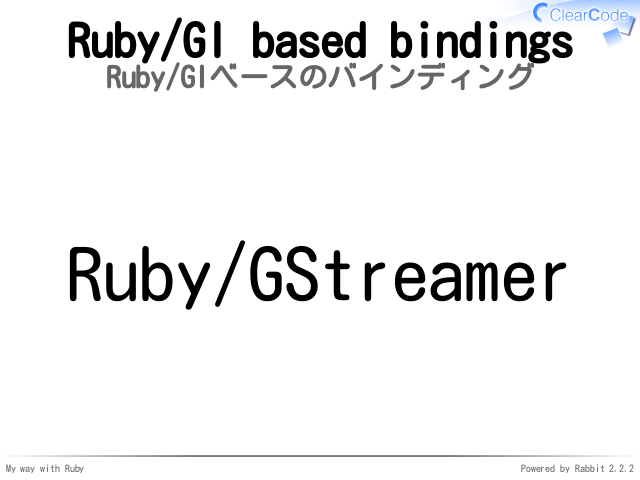 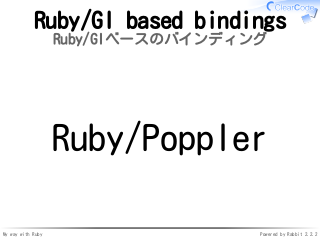 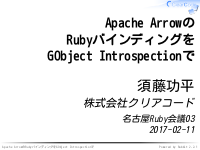 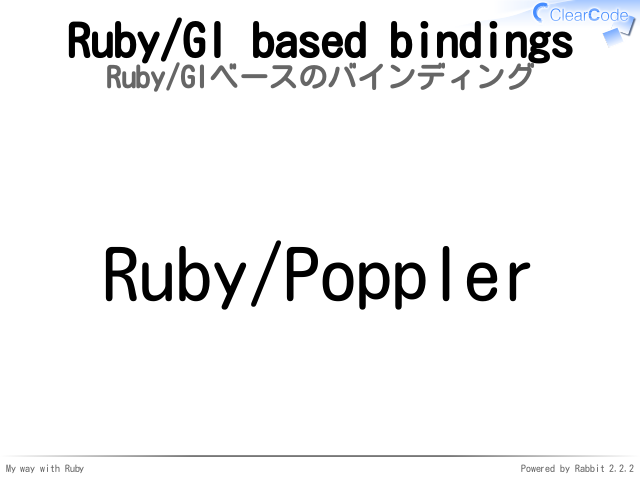 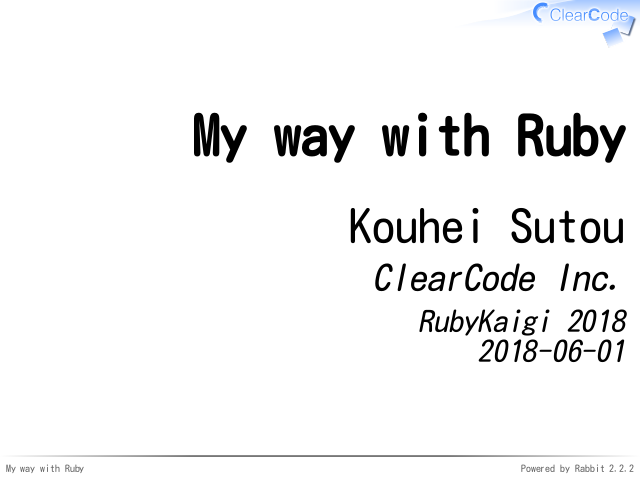 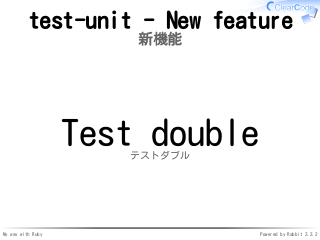 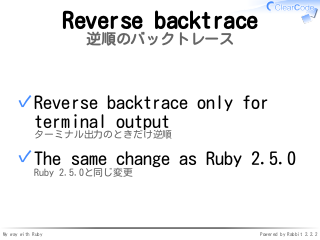 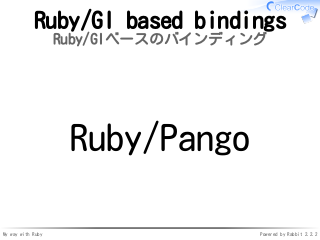 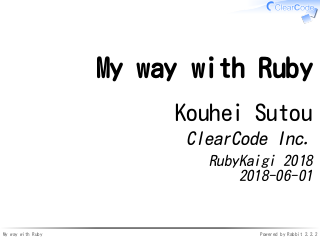 ✓ We can connect with Ruby! 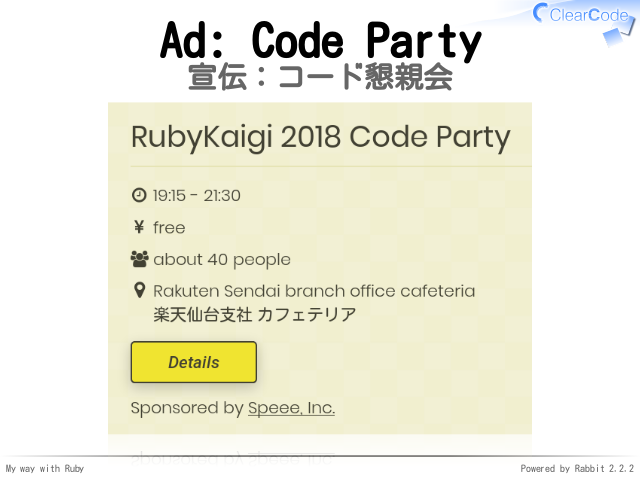 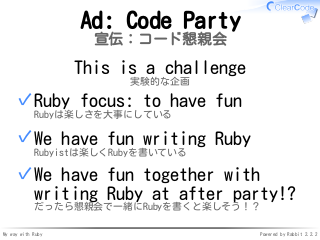 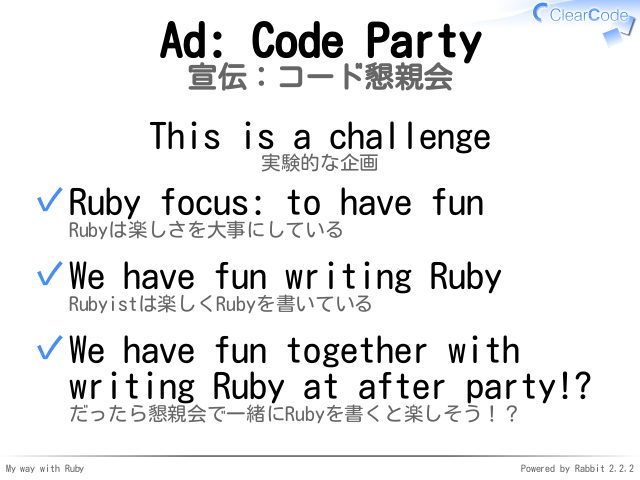 writing Ruby at after party!? 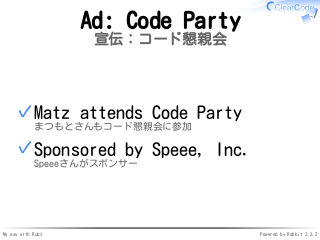 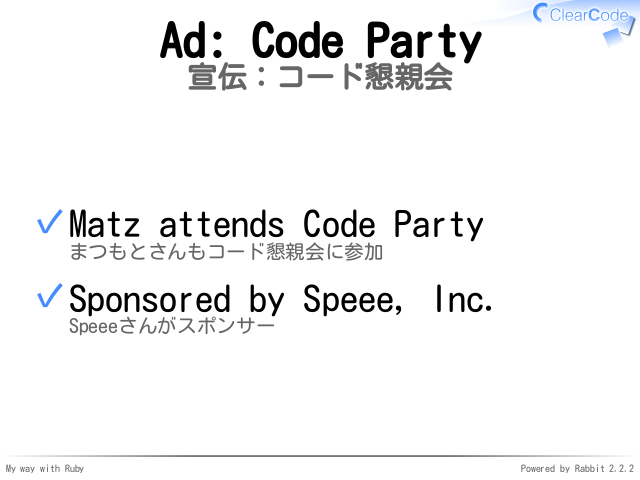 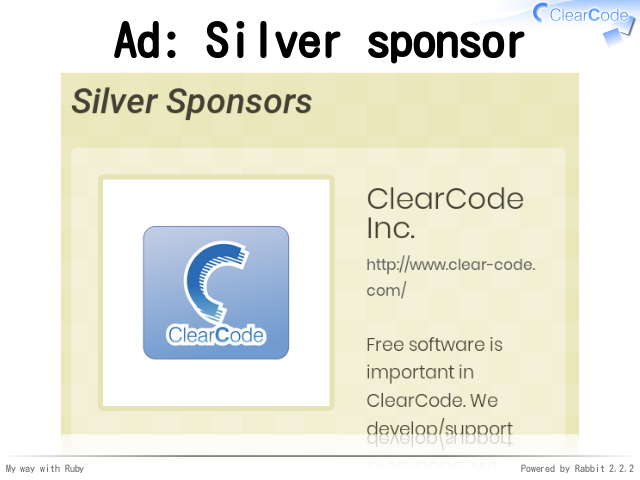 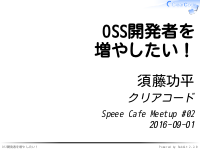 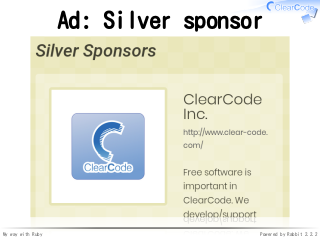 ✓ Sponsored by Speee, Inc.
✓ Do you want to work with me? 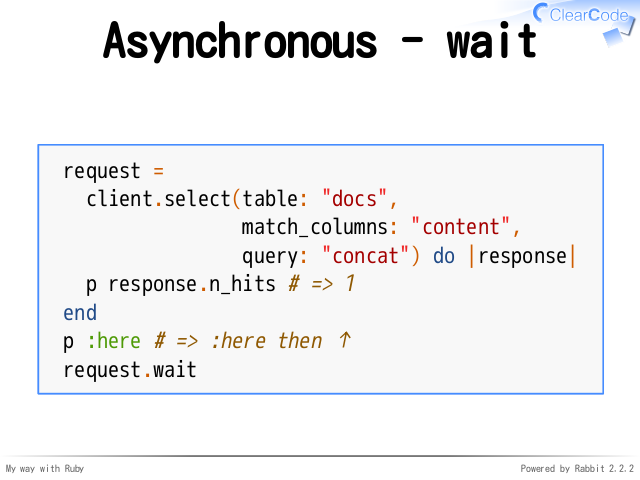 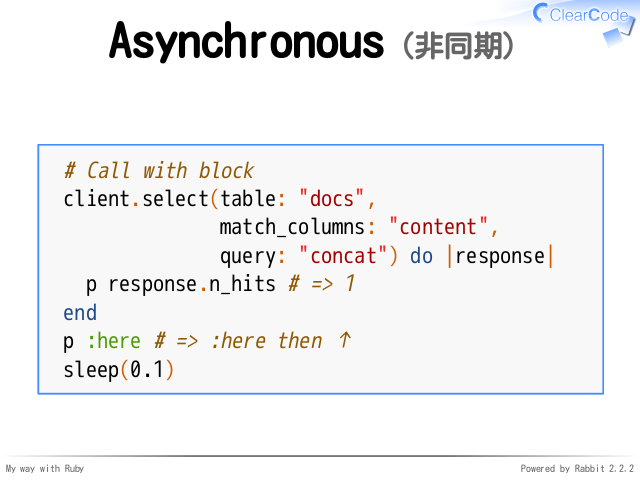 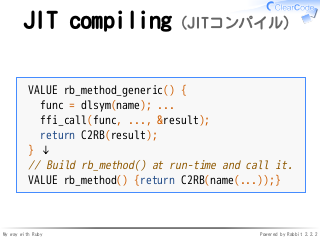 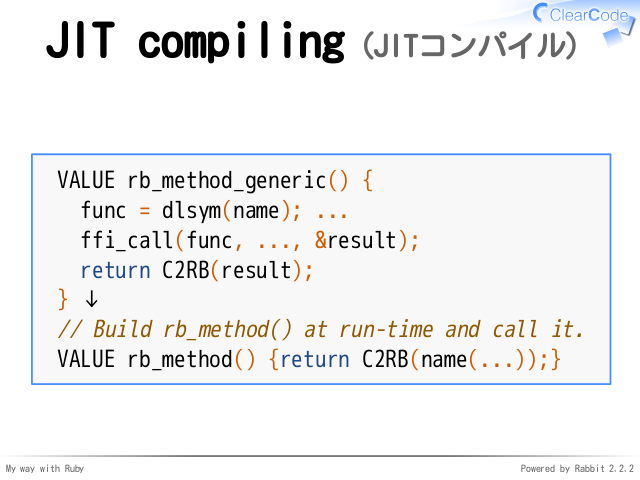 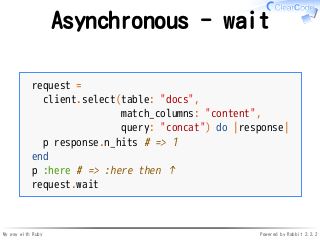 // Build rb_method() at run-time and call it. 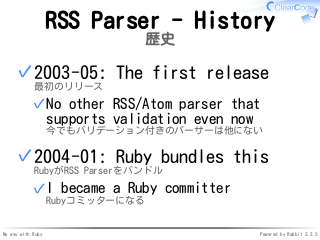 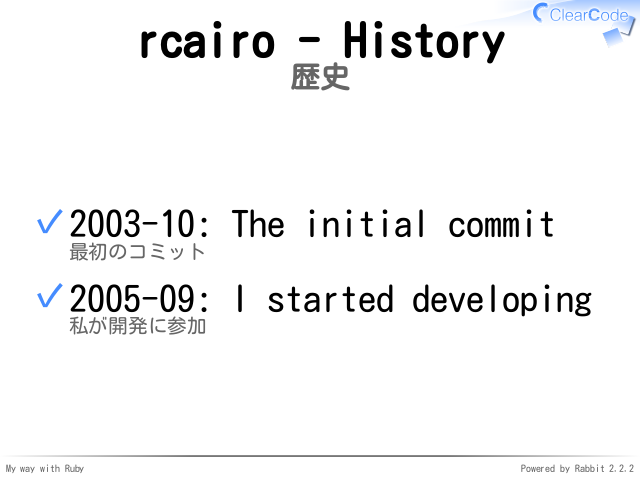 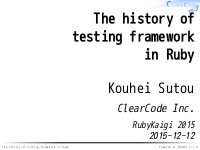 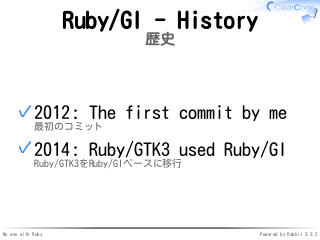 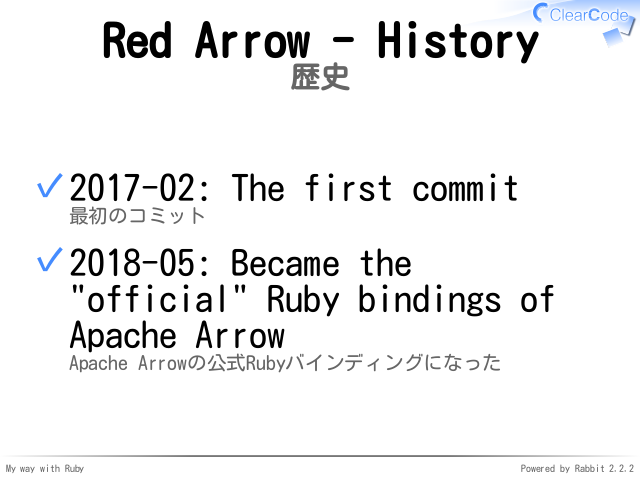 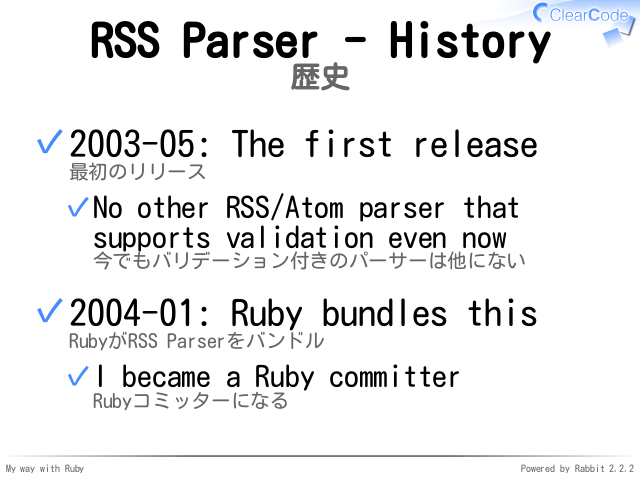 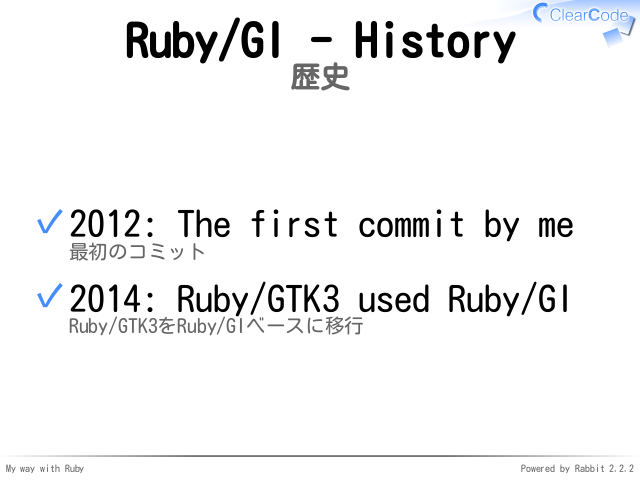 See also: "The history of testing framework in Ruby"
p record.content # => "String#<< concat..."
✓ Can we share documents? 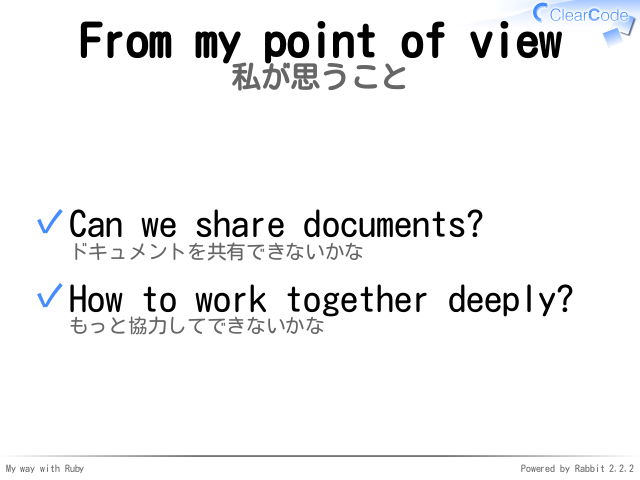 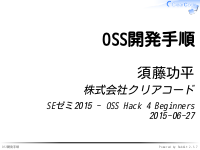 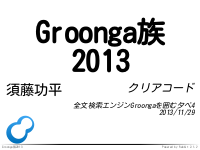 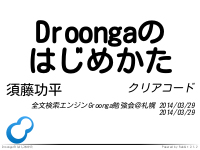 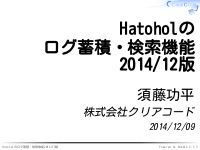 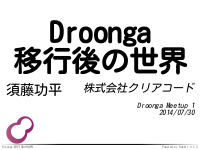 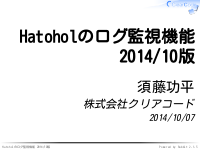 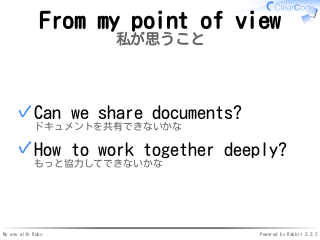 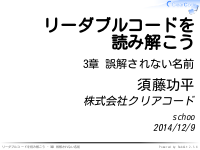 ✓ How to work together deeply? 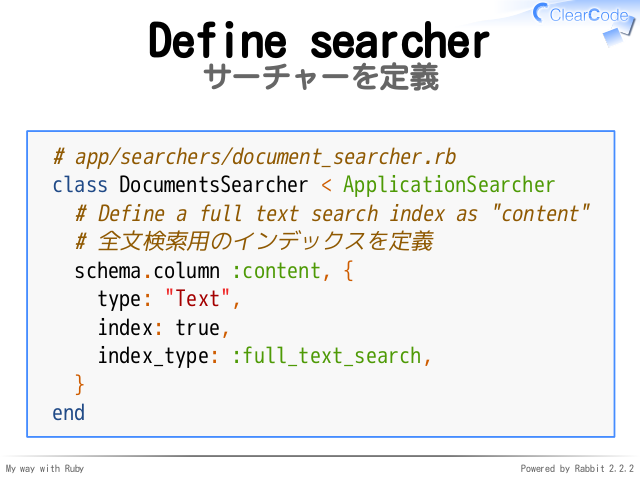 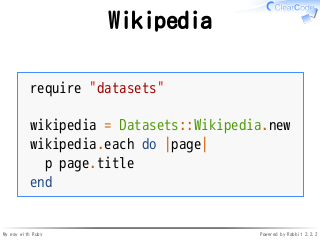 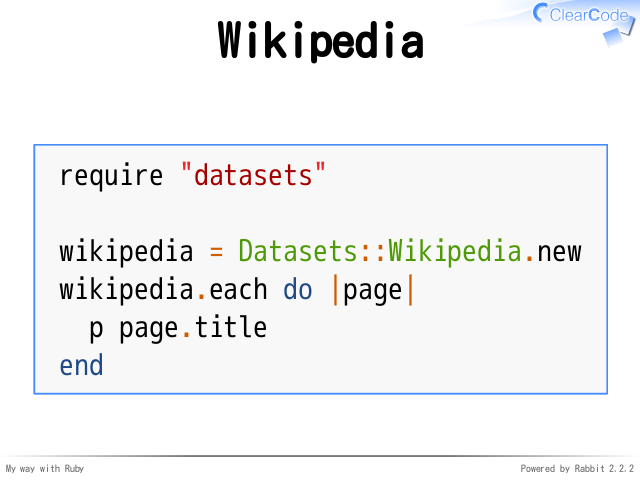 # Define a full text search index as "content"
✓ Do you want to work with us? 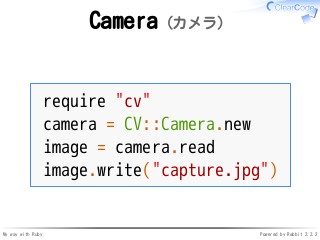 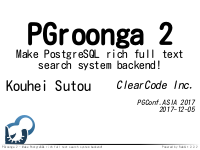 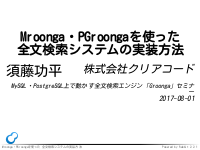 ✓ e.g. 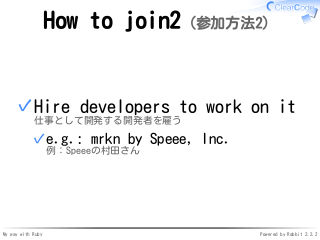 : mrkn by Speee, Inc.